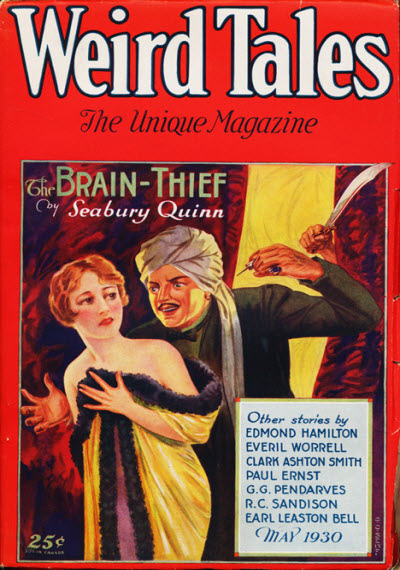 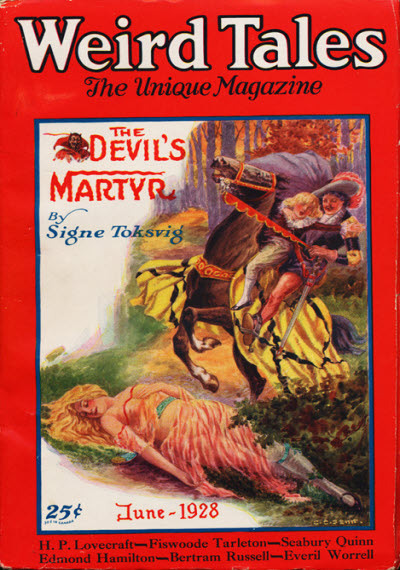 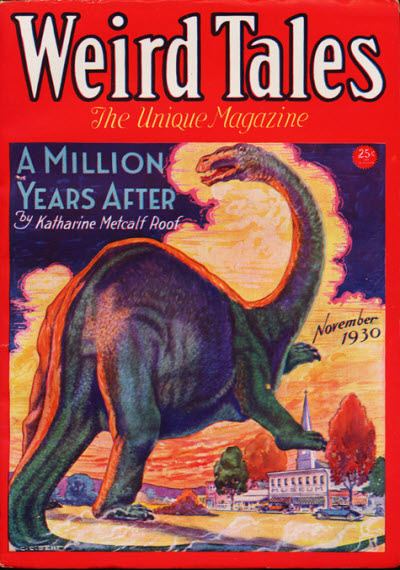 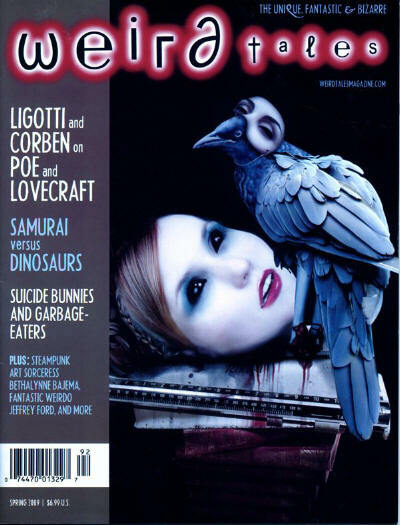 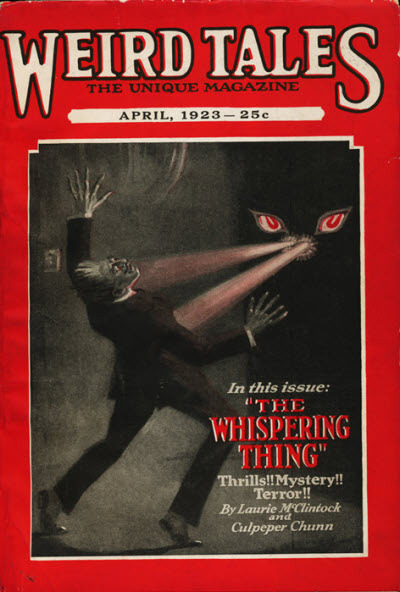 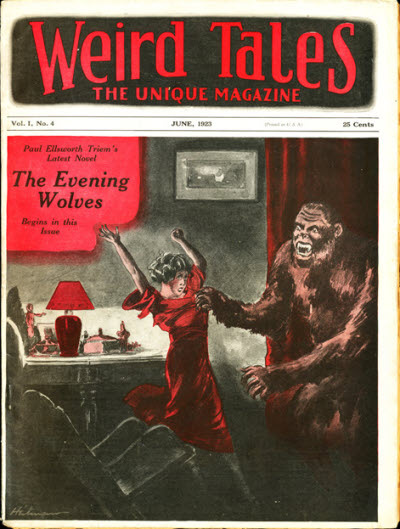 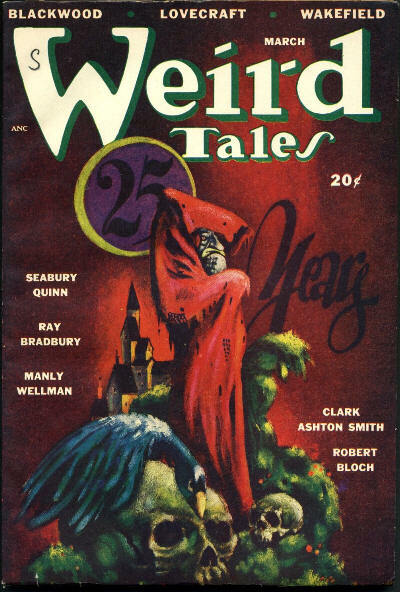 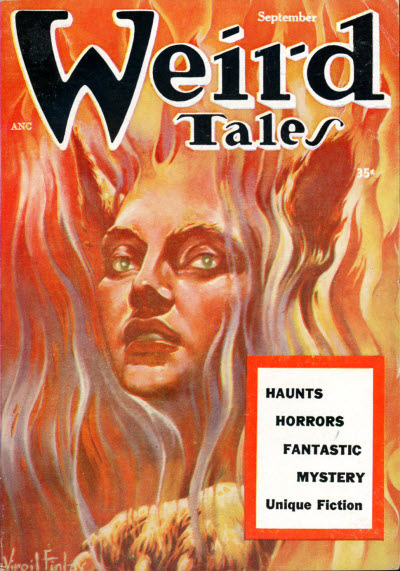 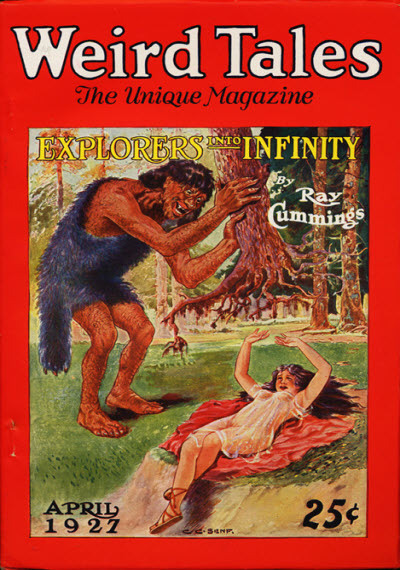 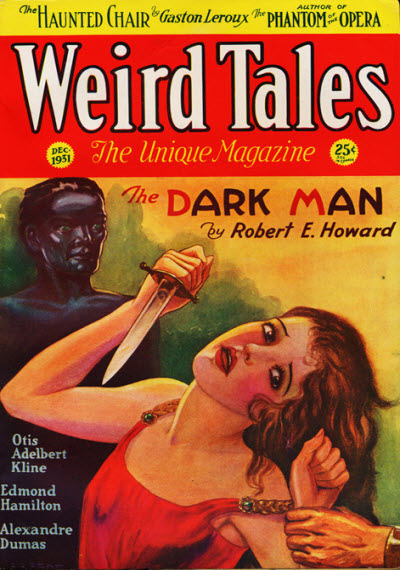 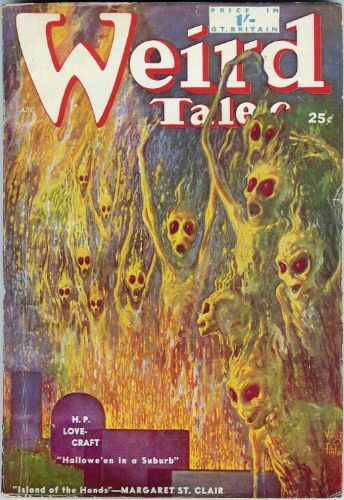 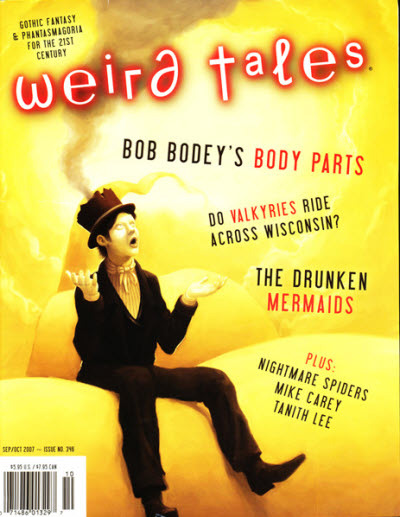 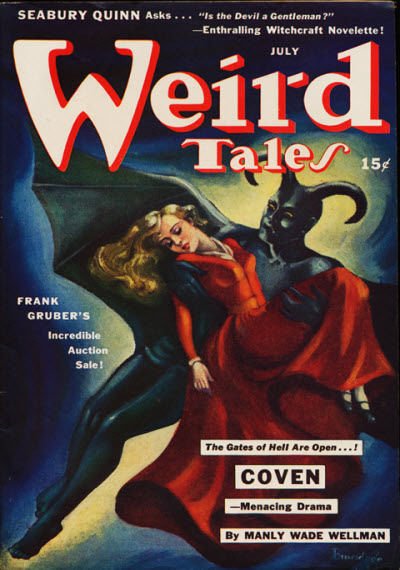 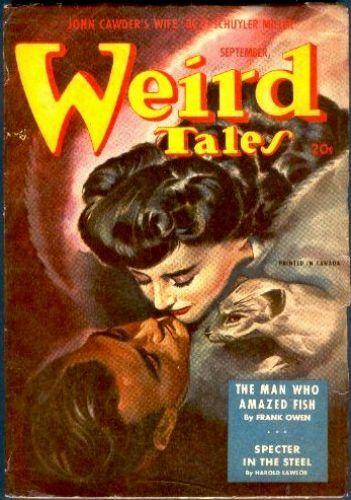 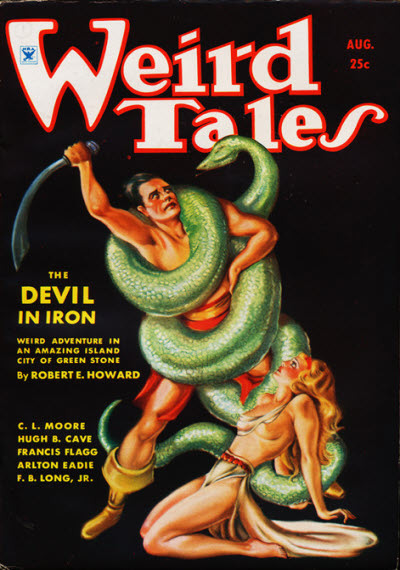 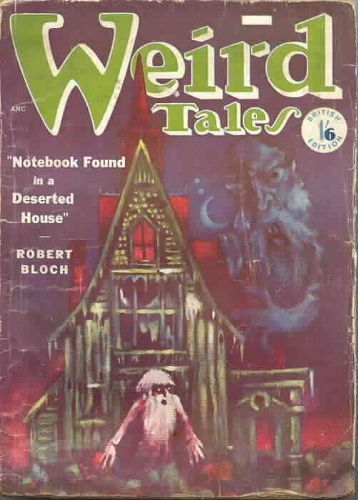 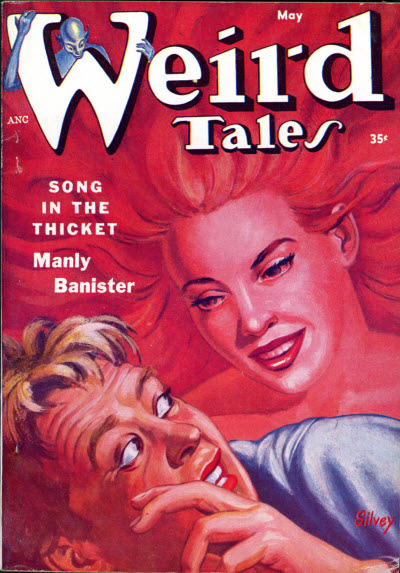 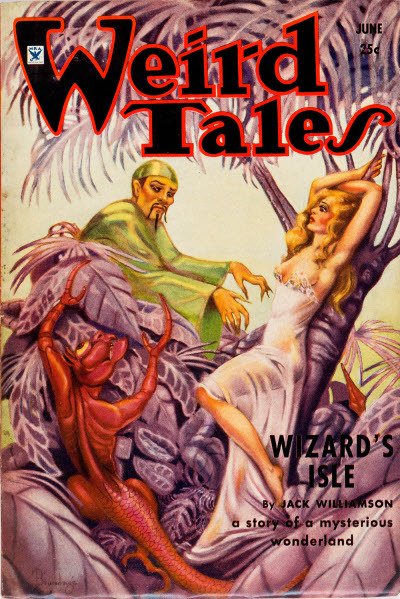 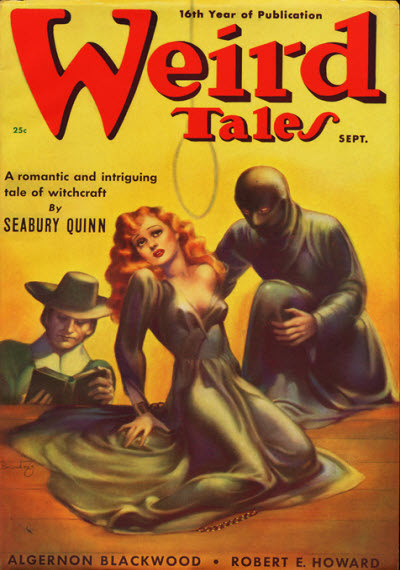 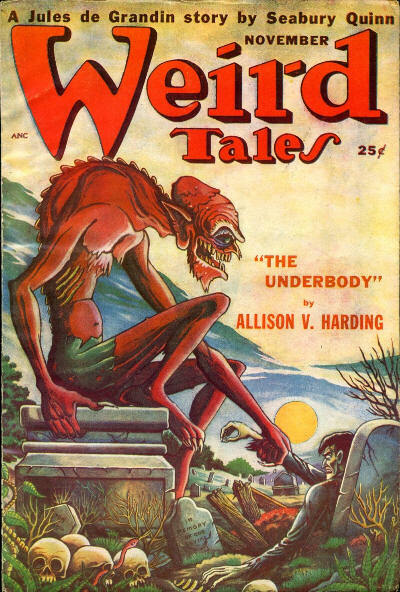 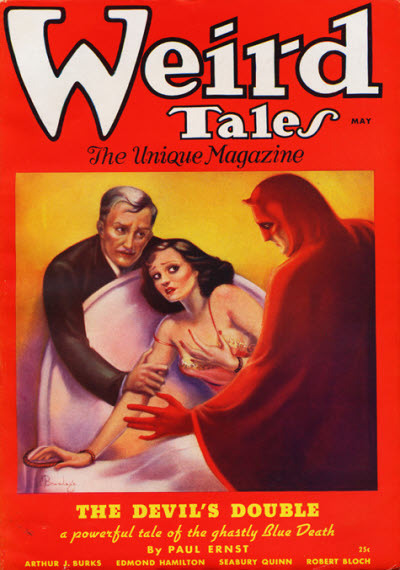 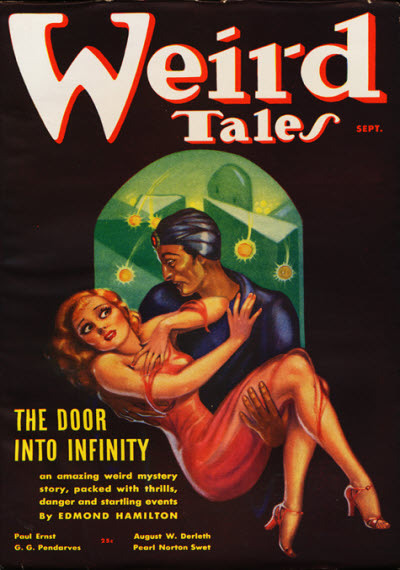 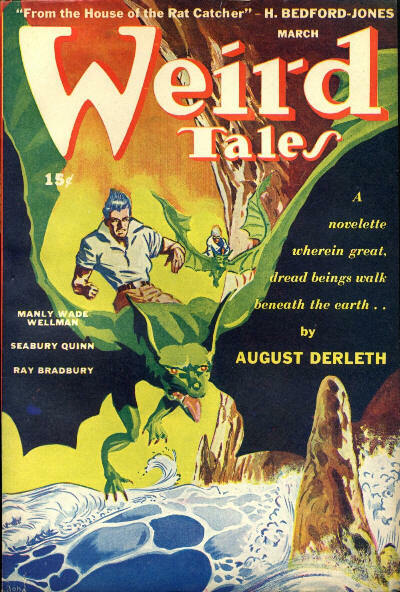 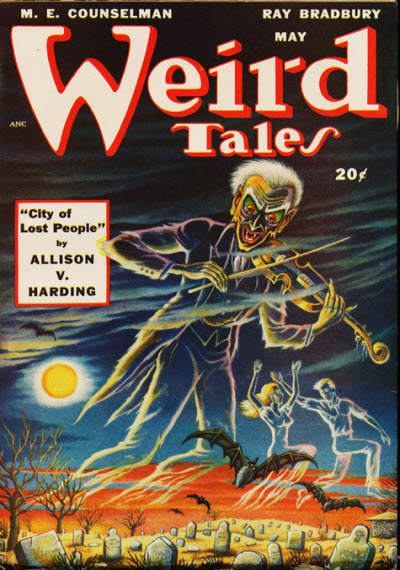 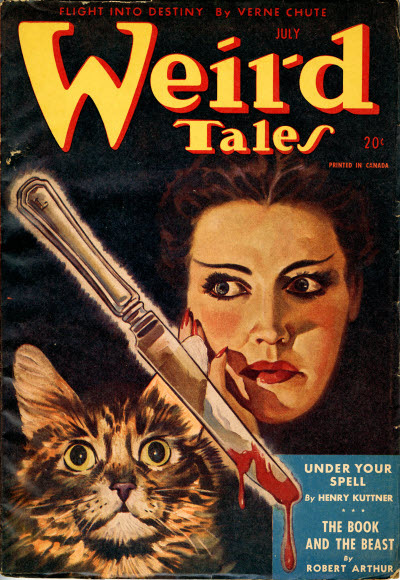 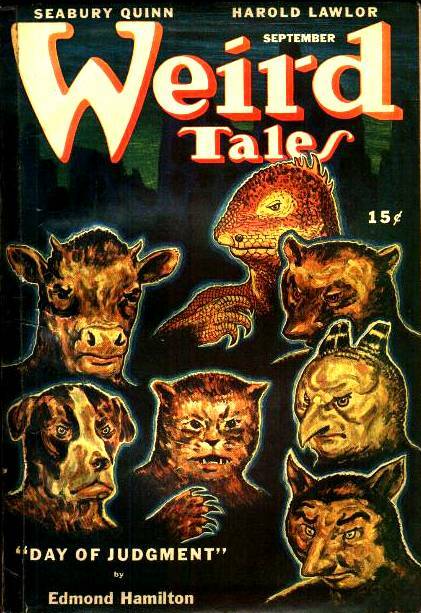 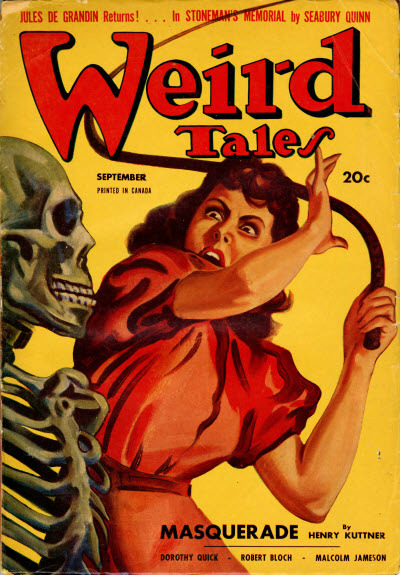 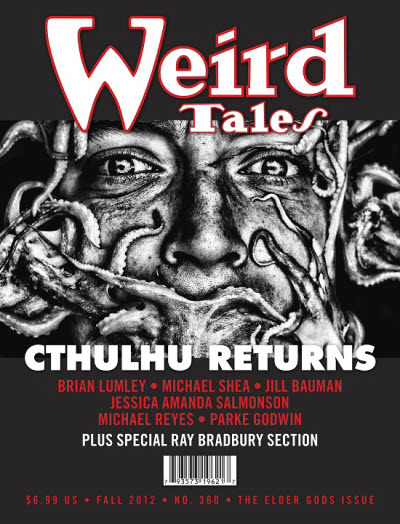 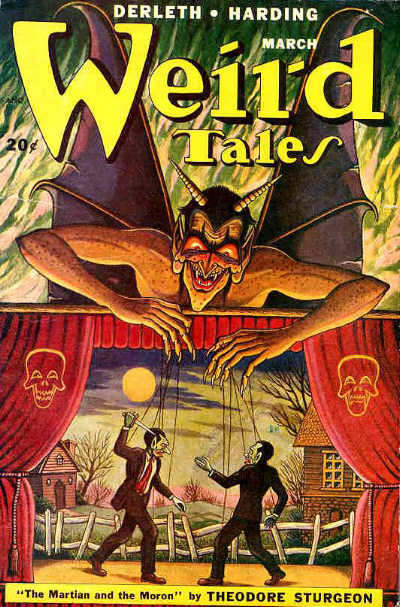 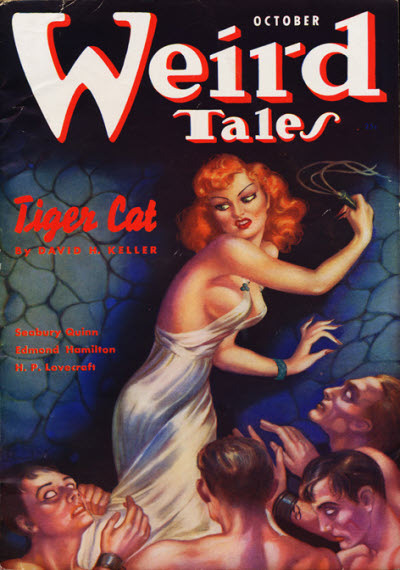 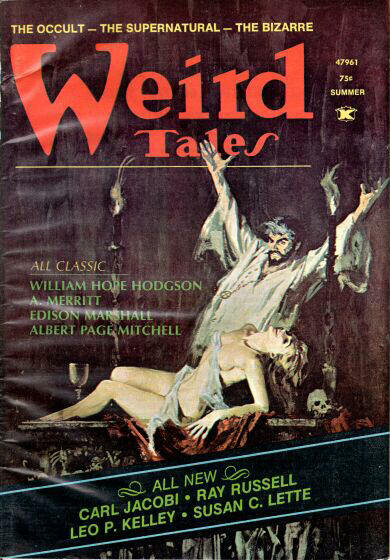 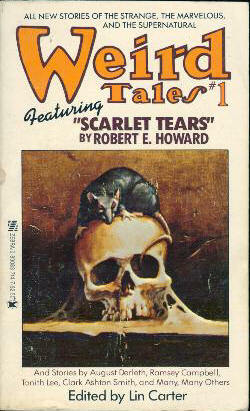 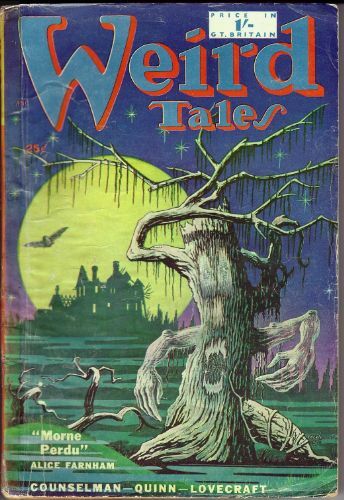 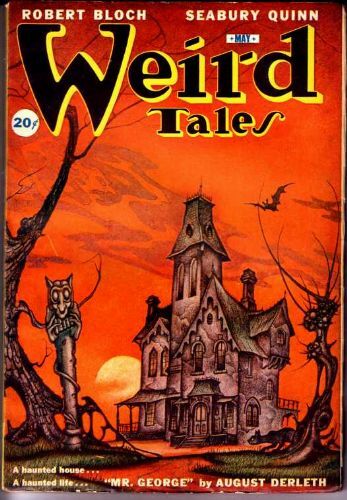 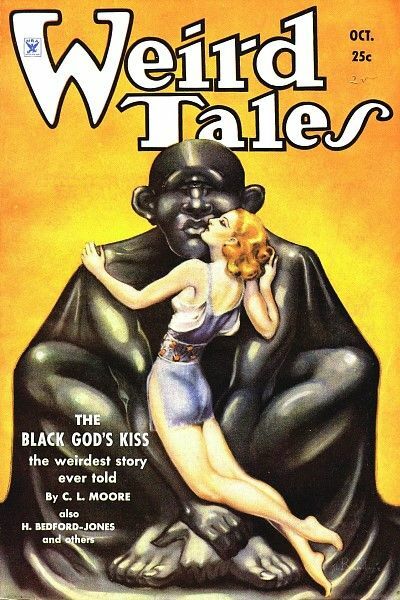 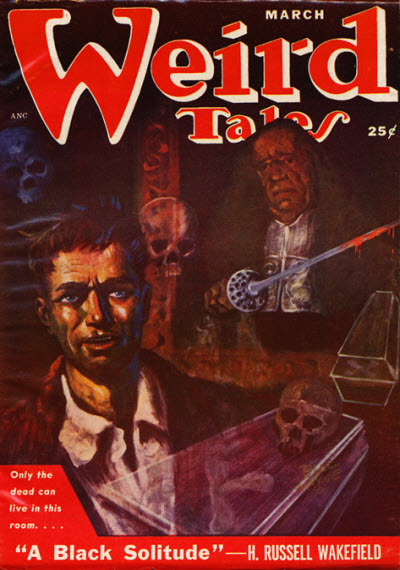 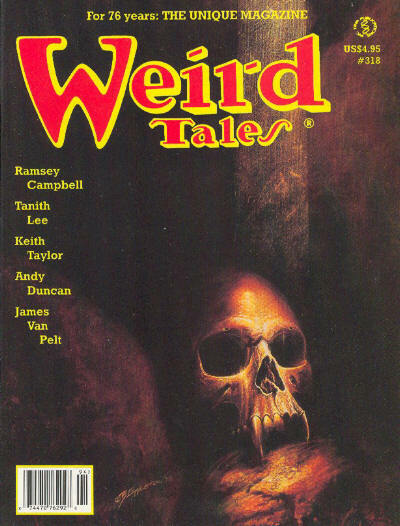 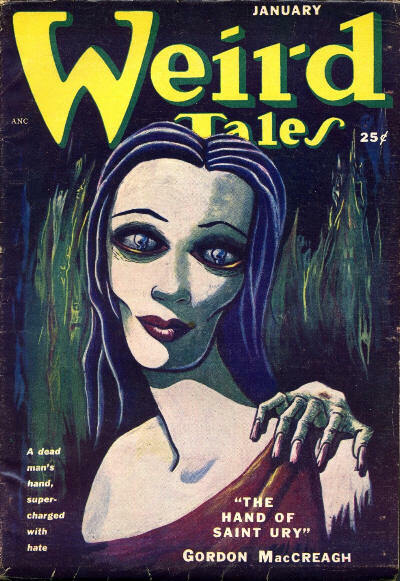 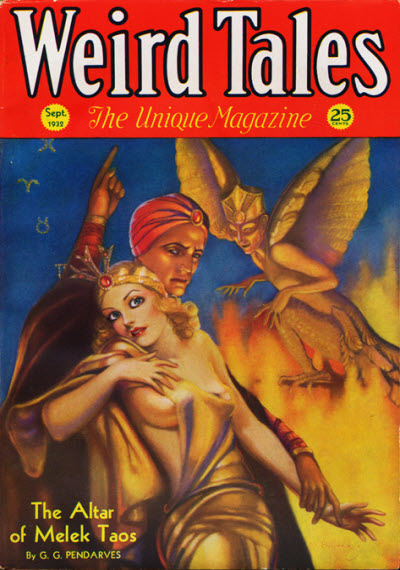 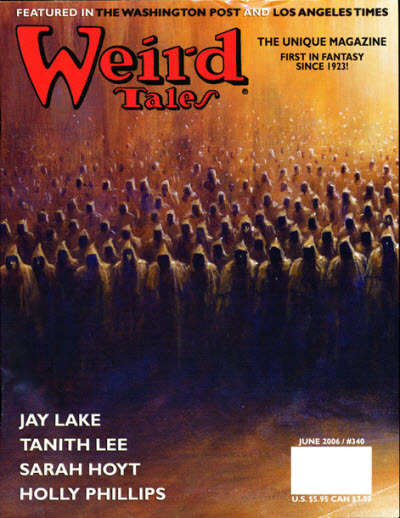 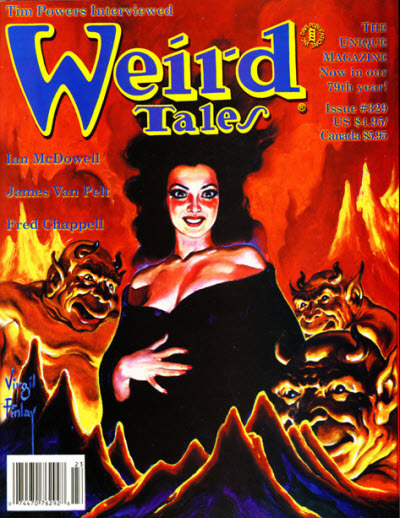 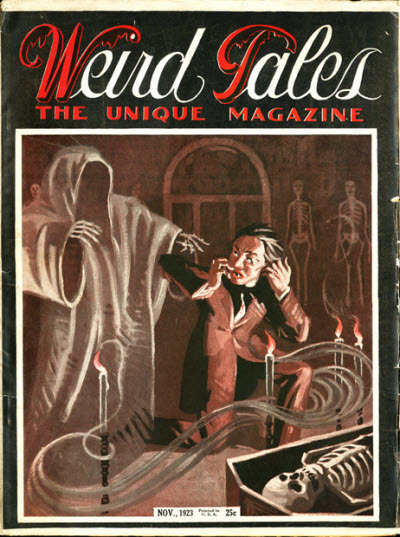 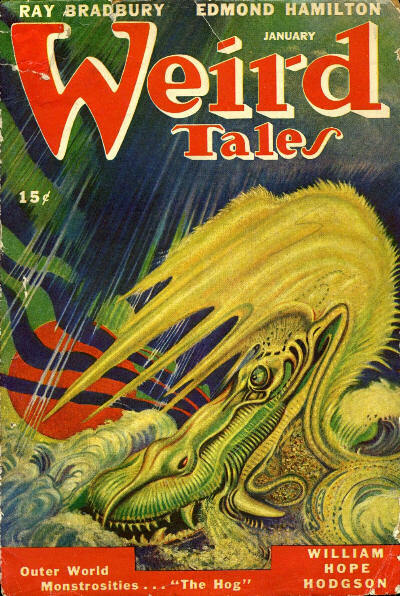 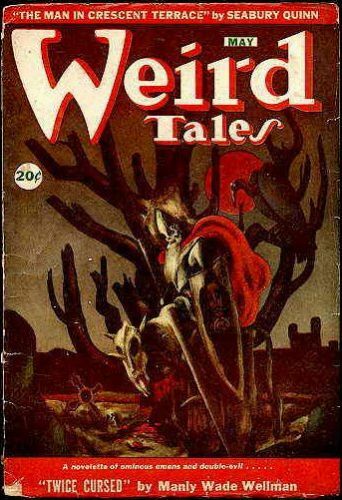 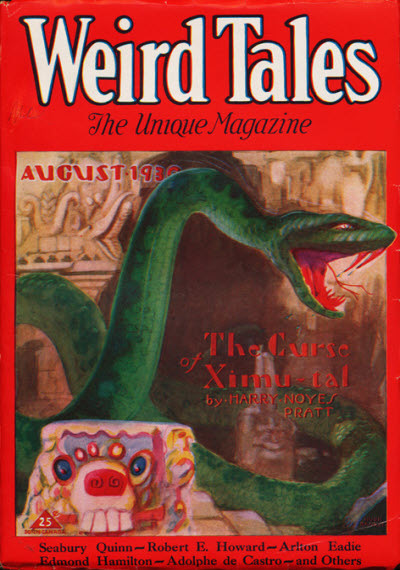 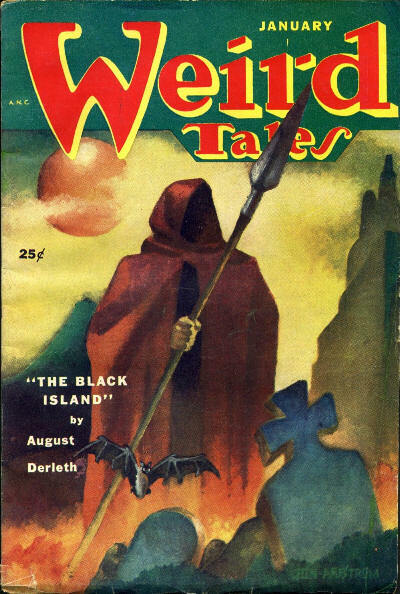 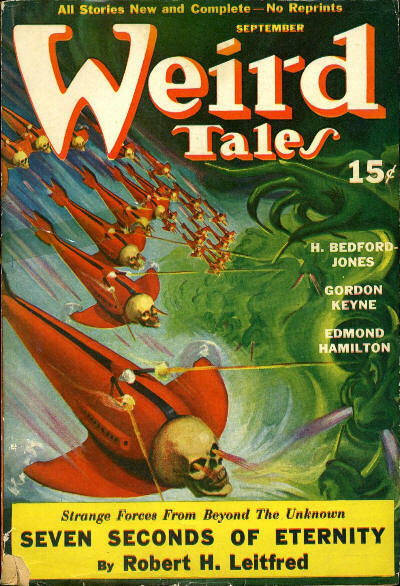 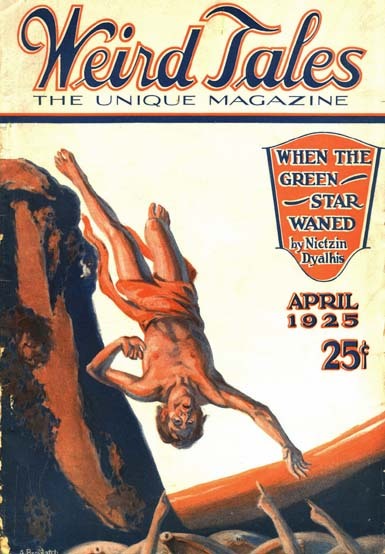 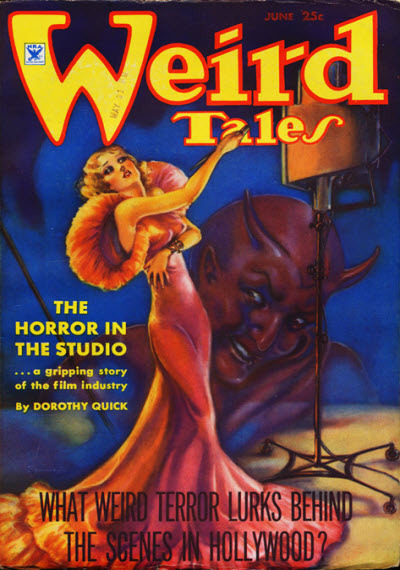 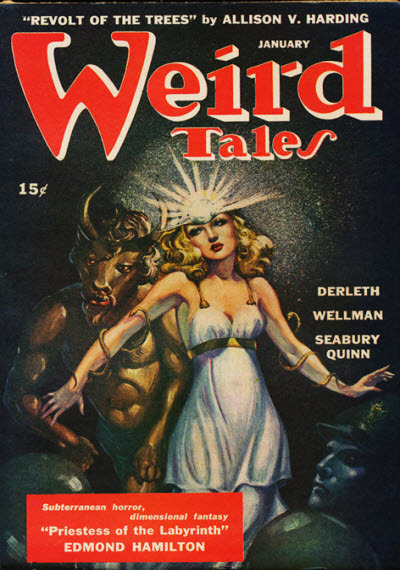 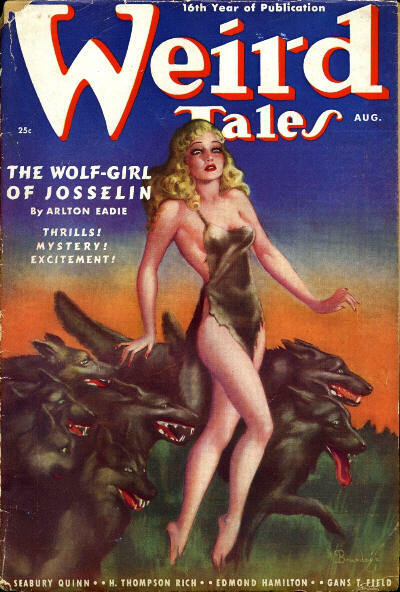 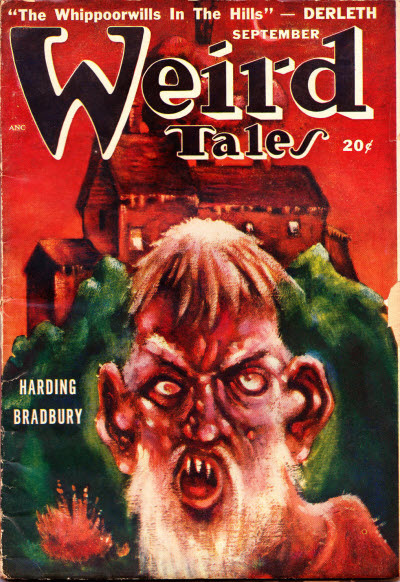 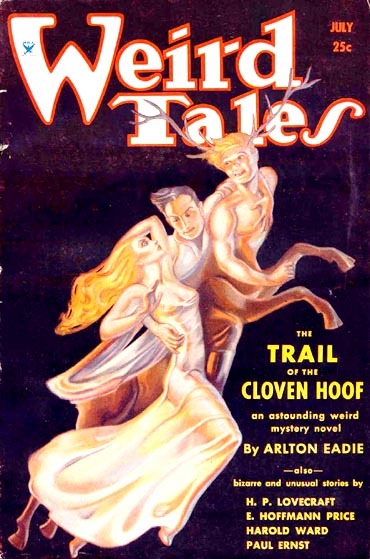 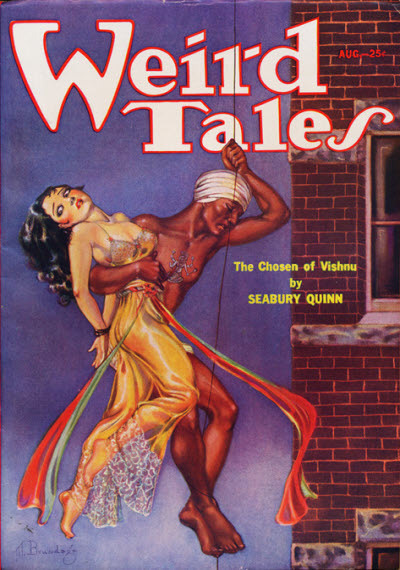 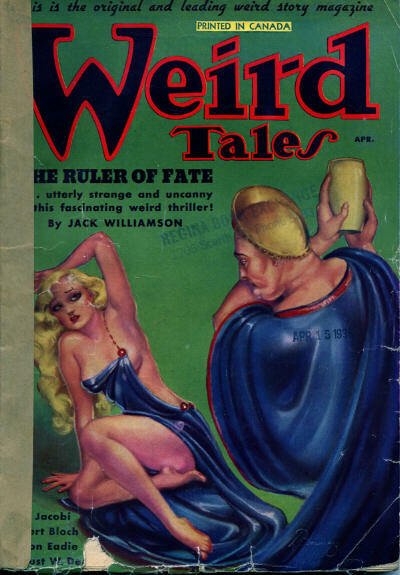 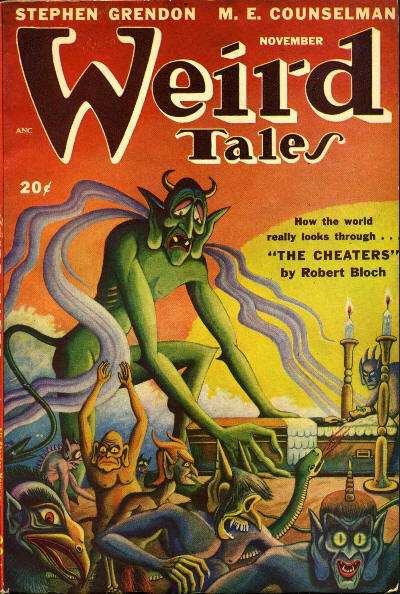 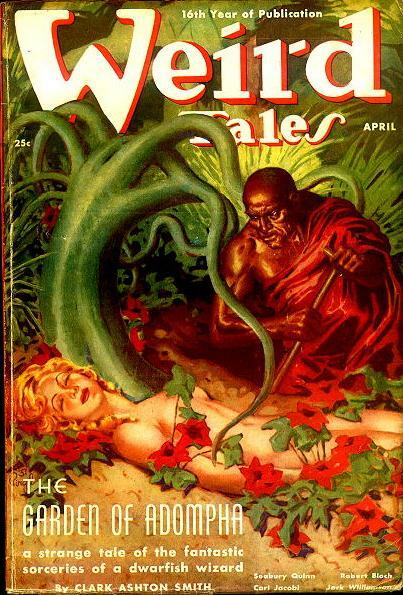 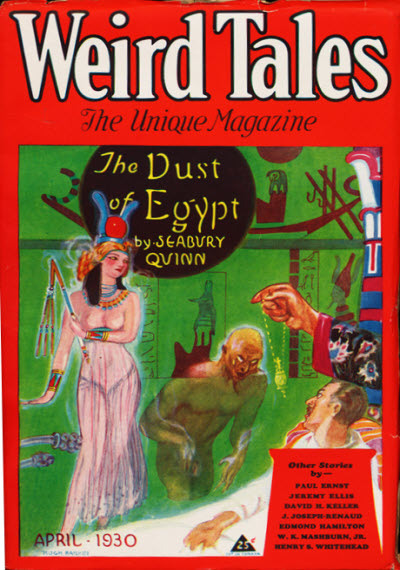 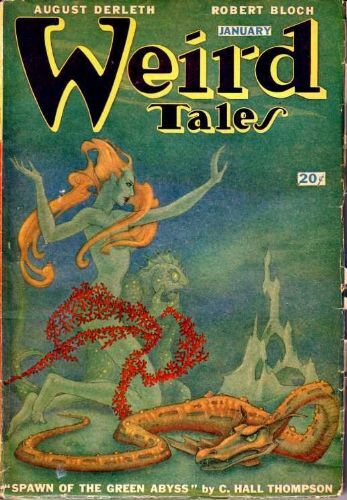 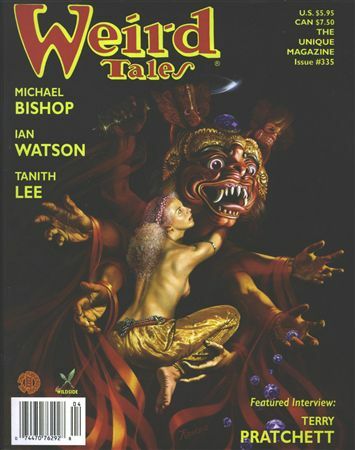 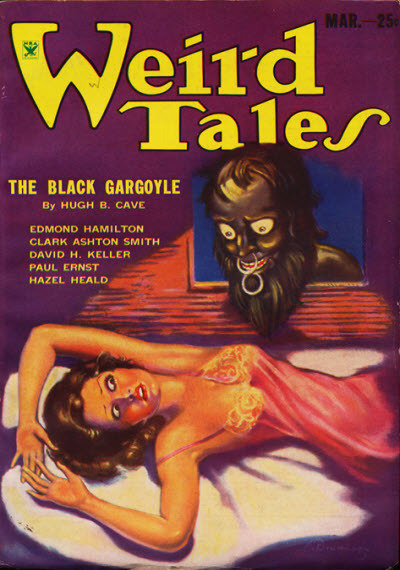 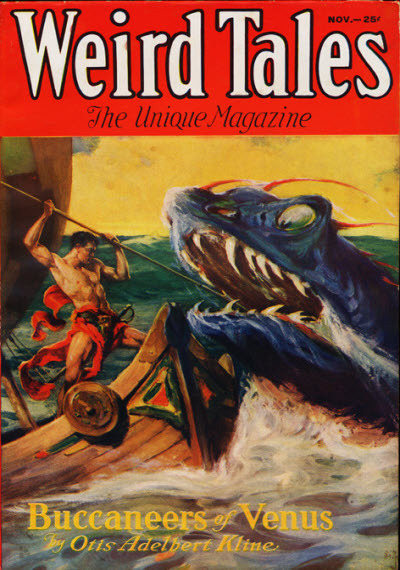 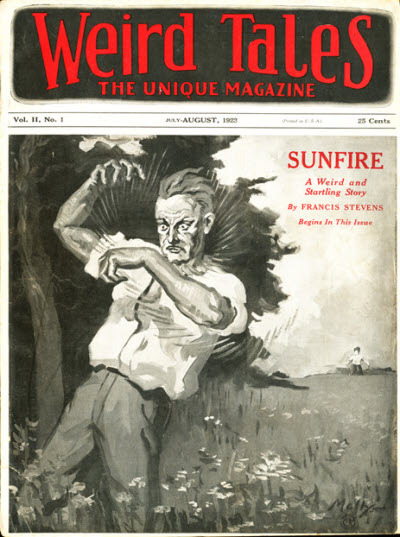 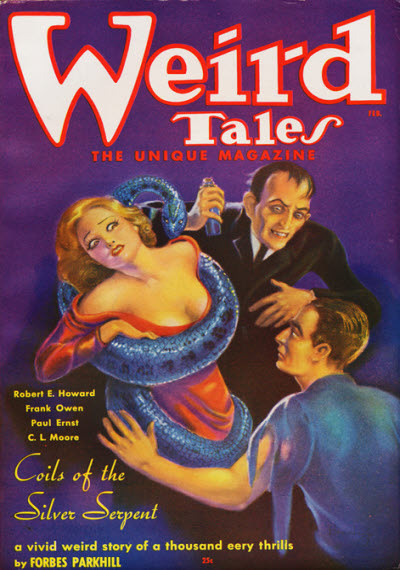 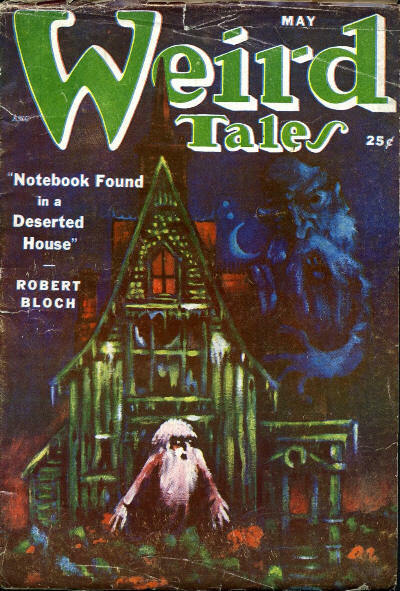 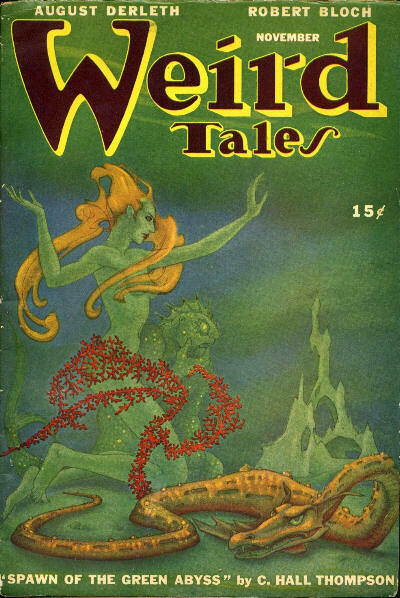 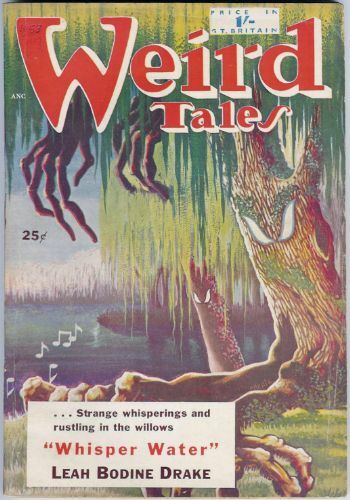 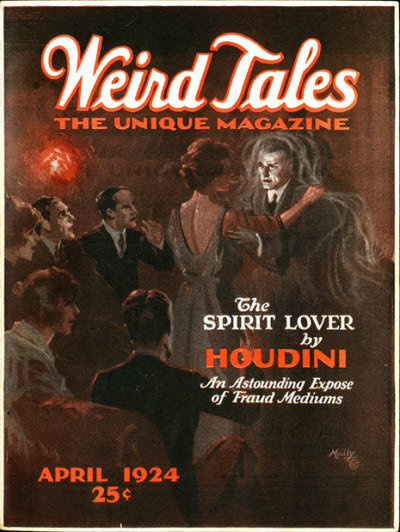 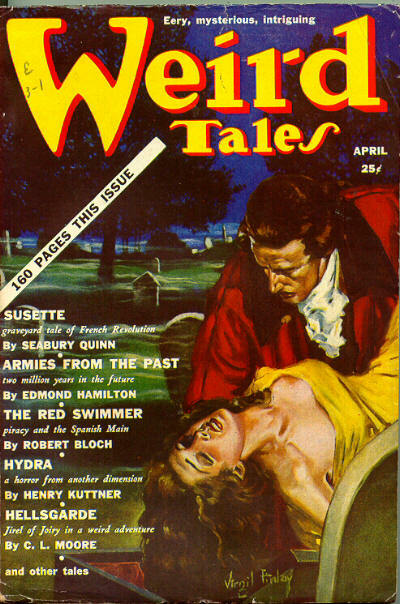 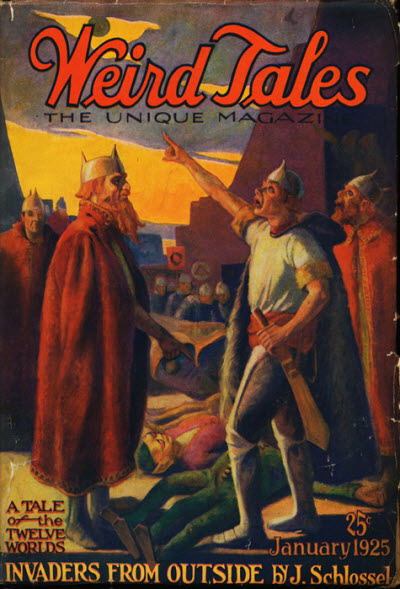 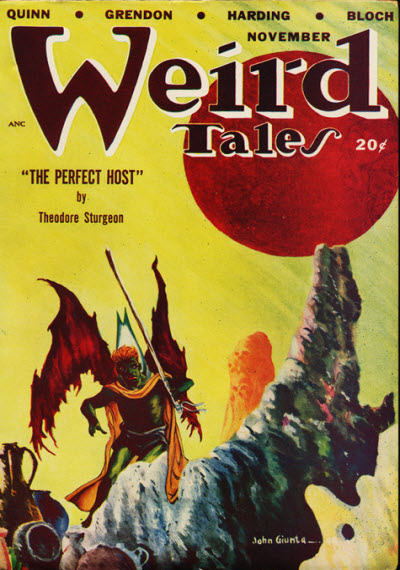 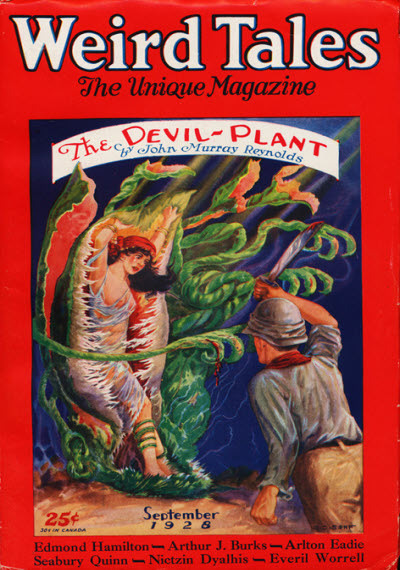 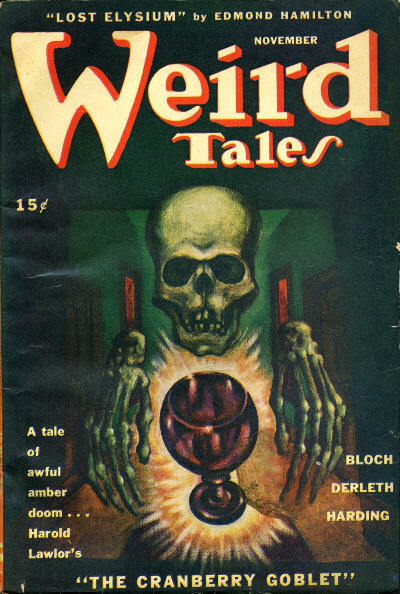 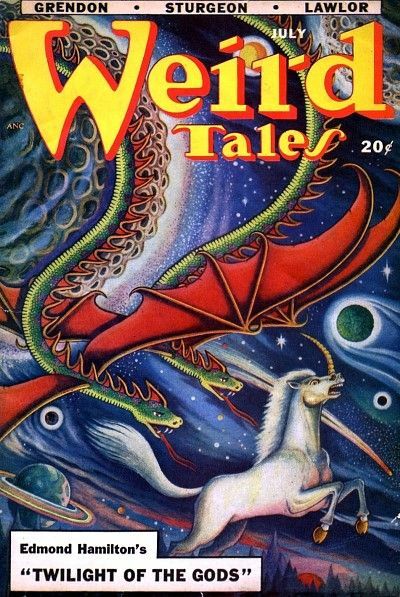 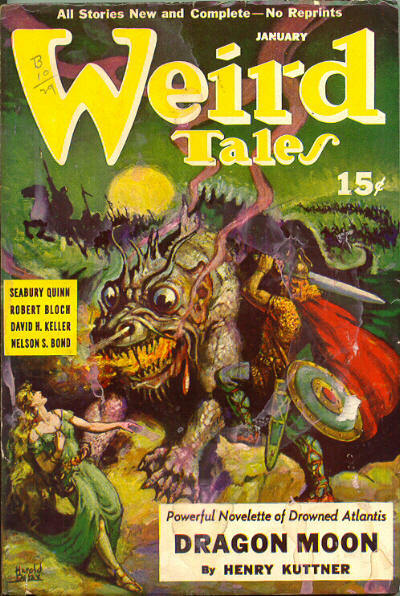 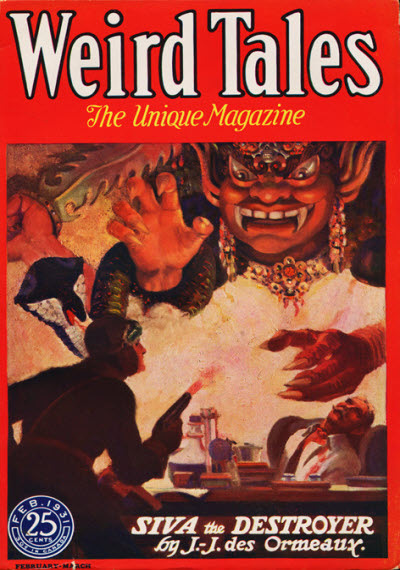 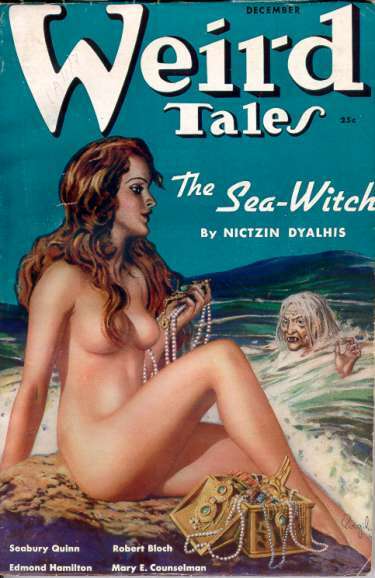 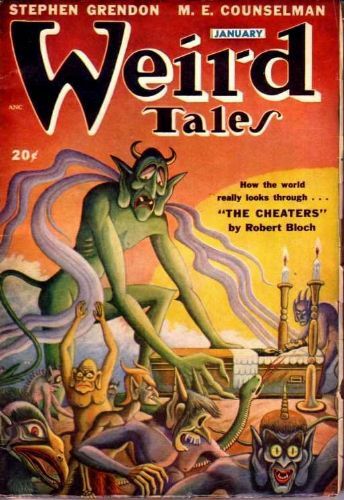 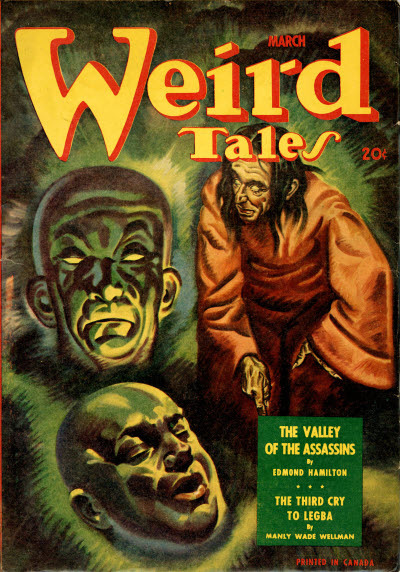 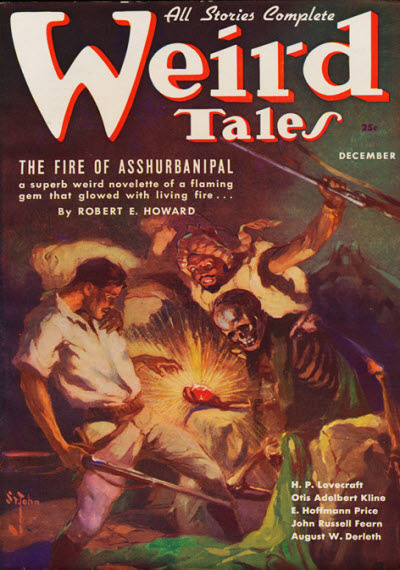 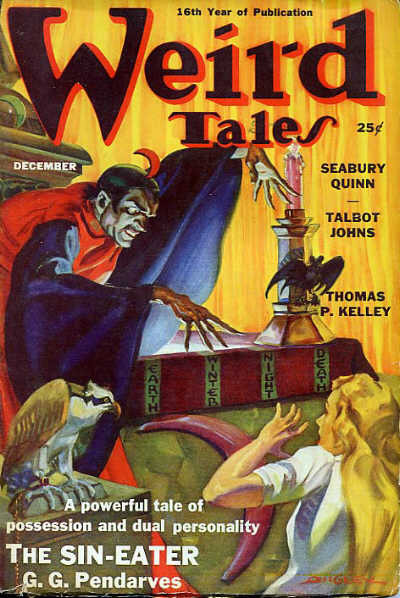 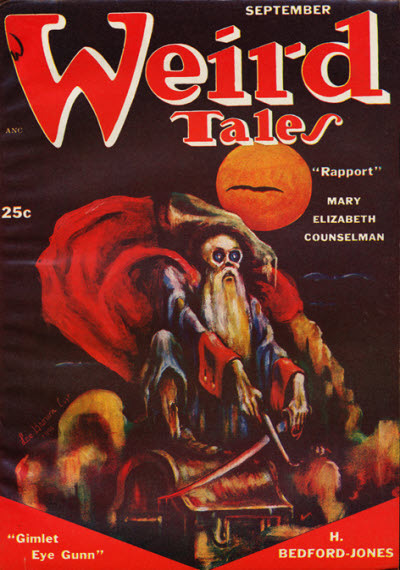 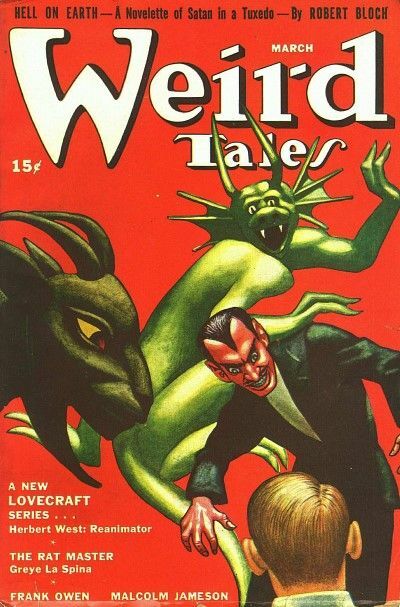 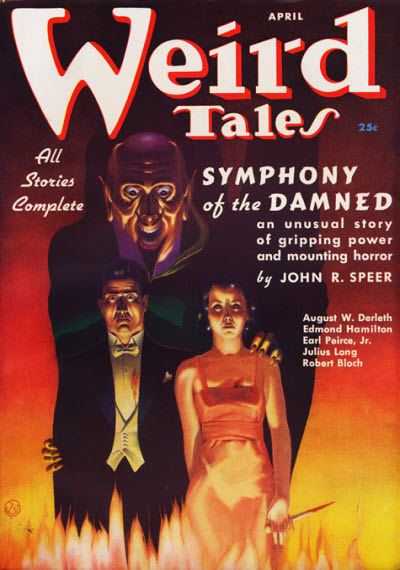 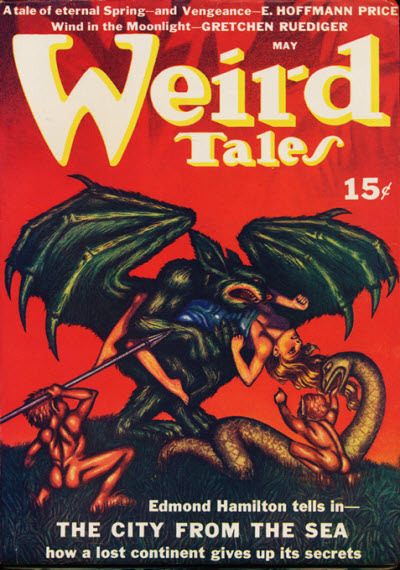 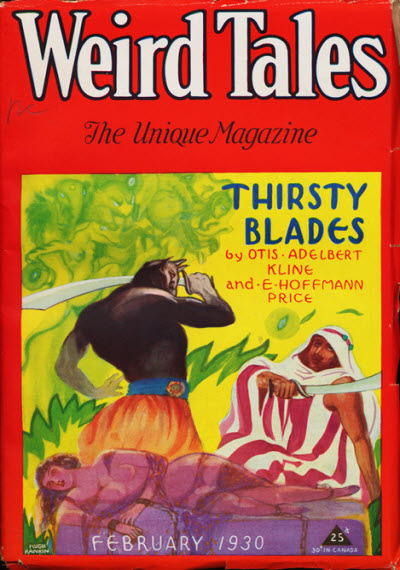 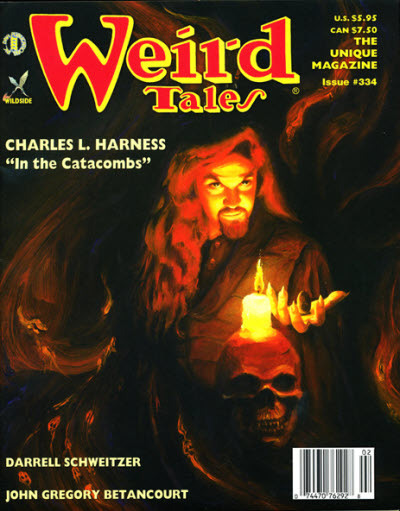 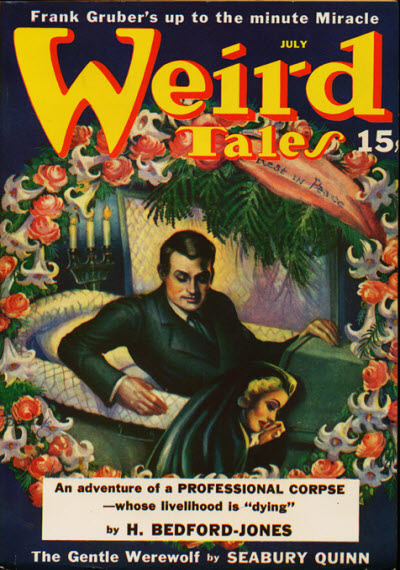 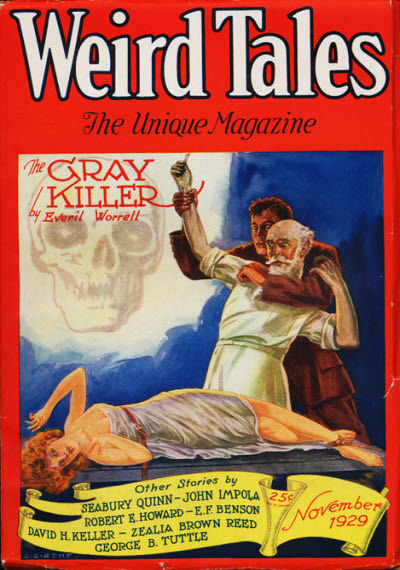 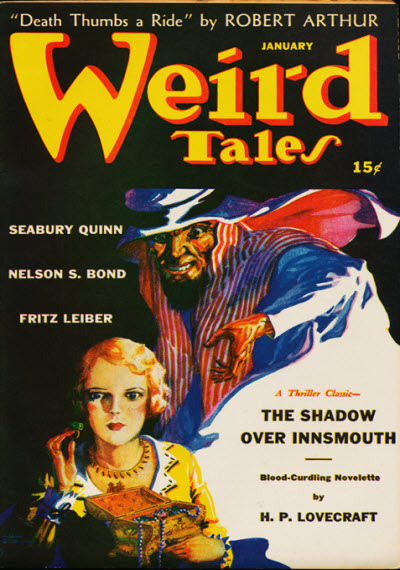 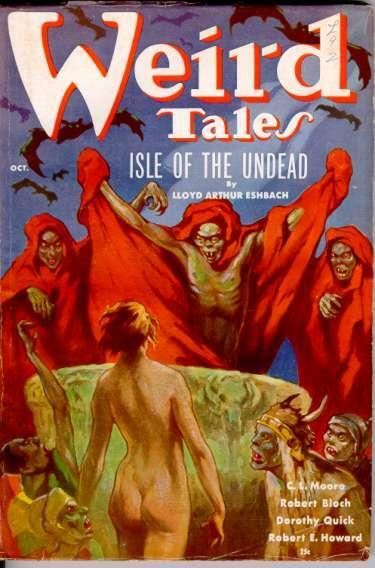 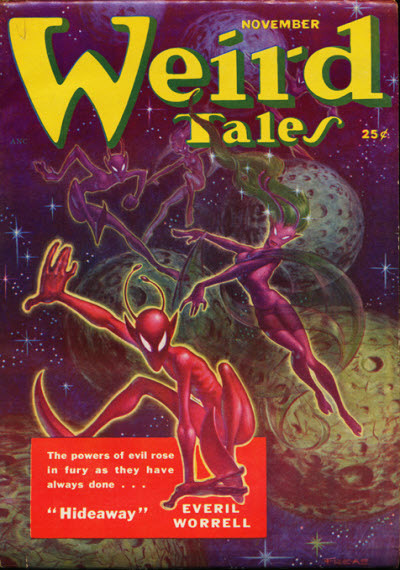 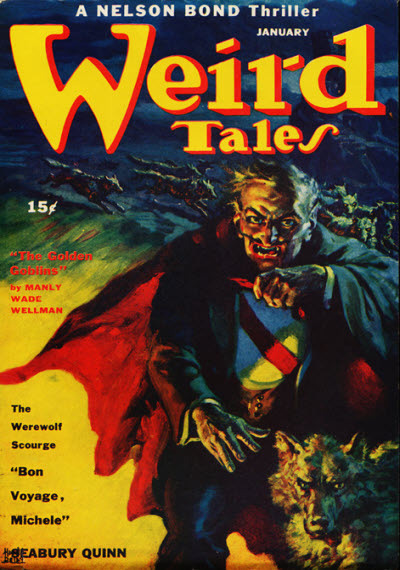 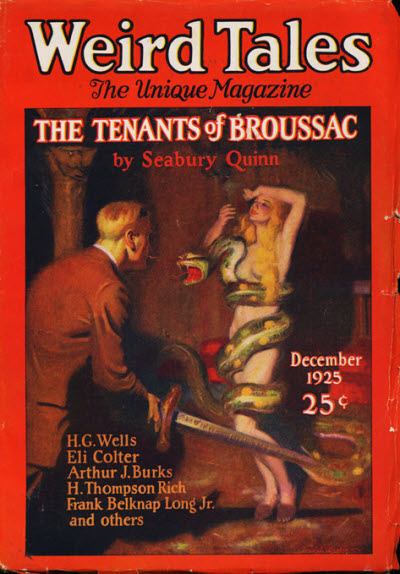 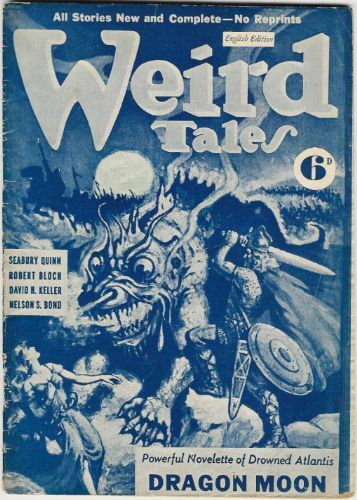 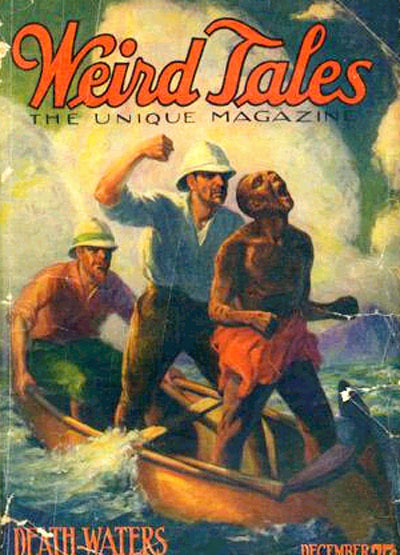 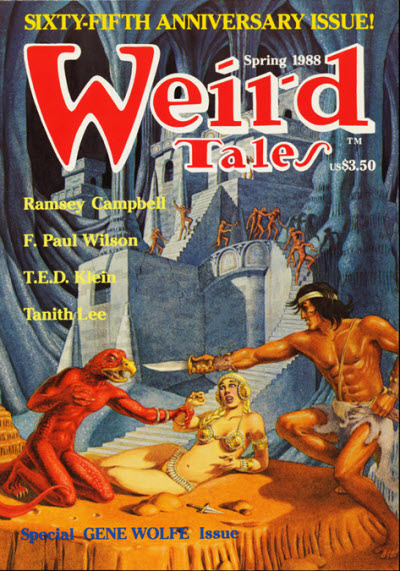 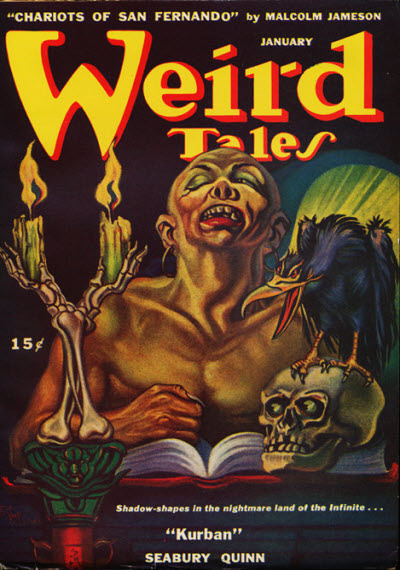 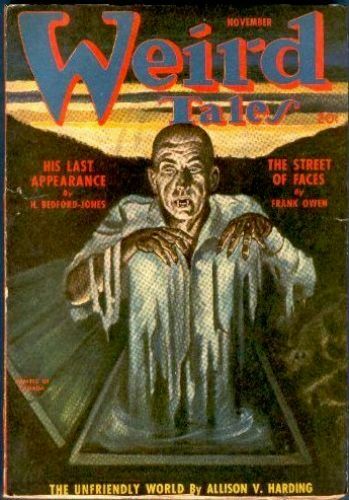 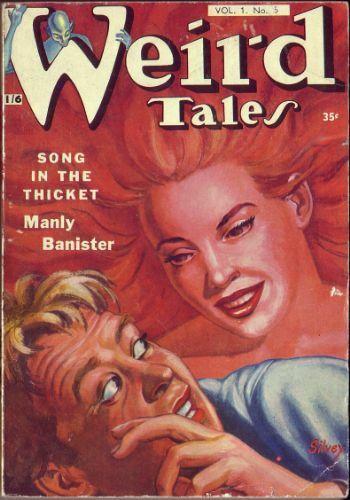 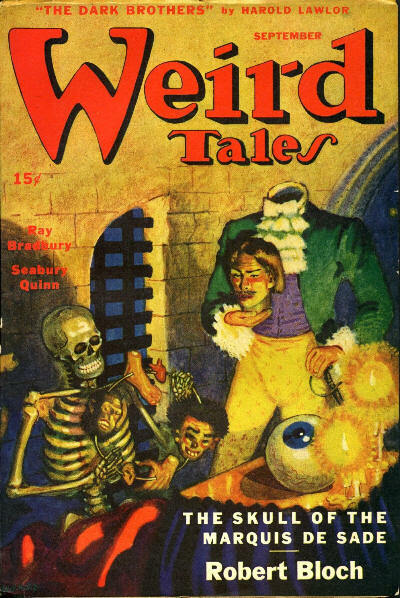 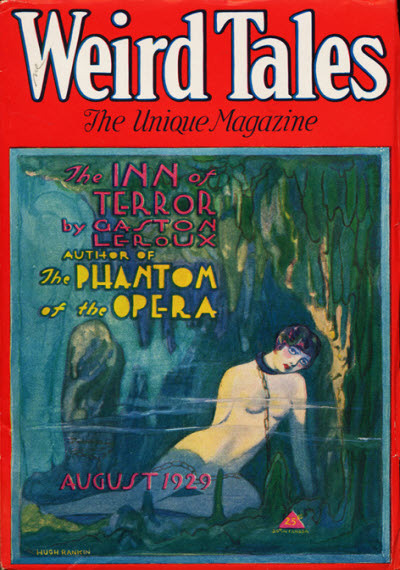 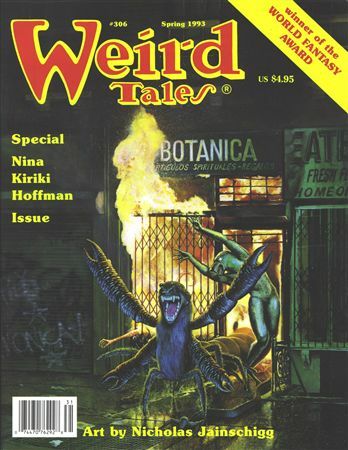 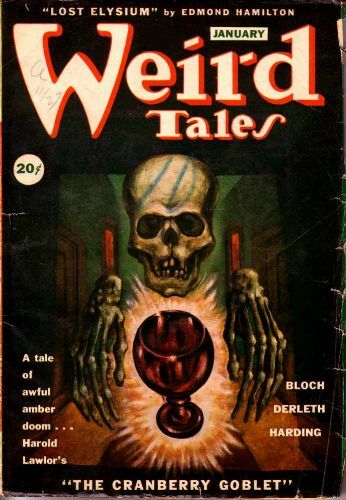 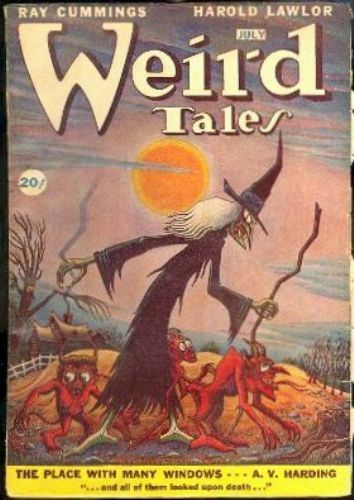 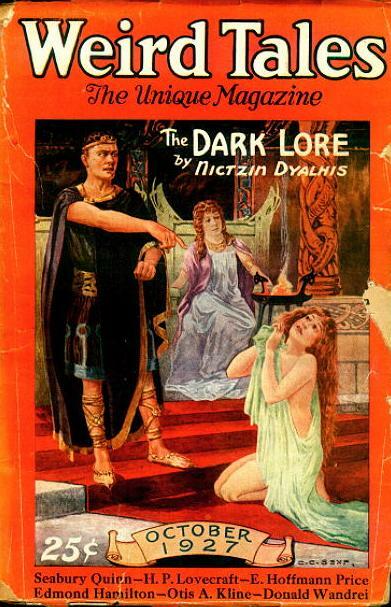 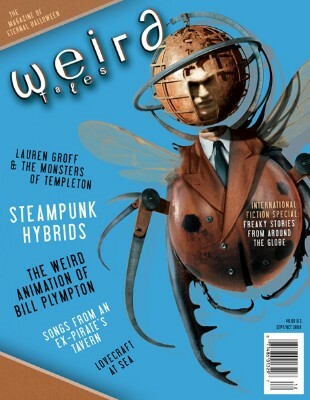 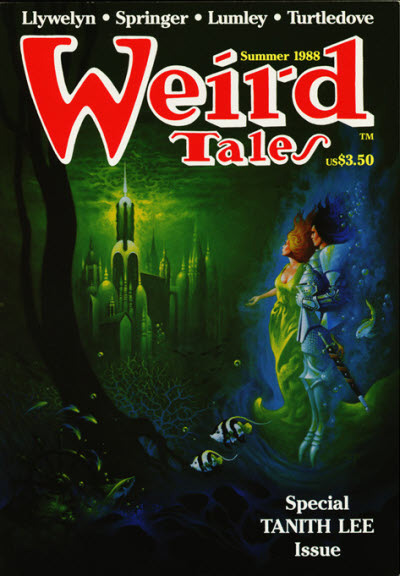 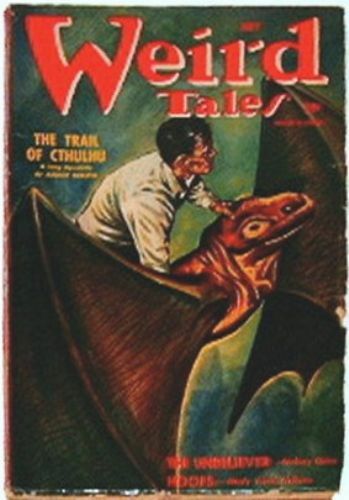 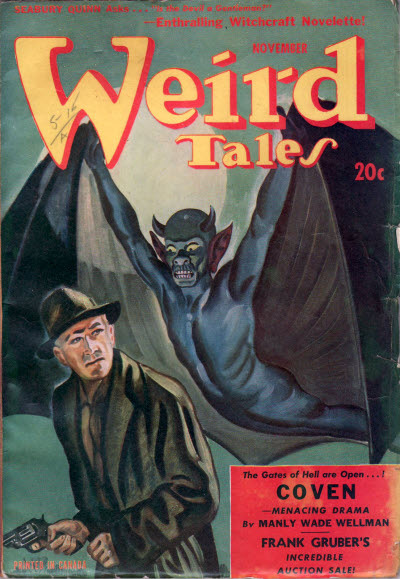 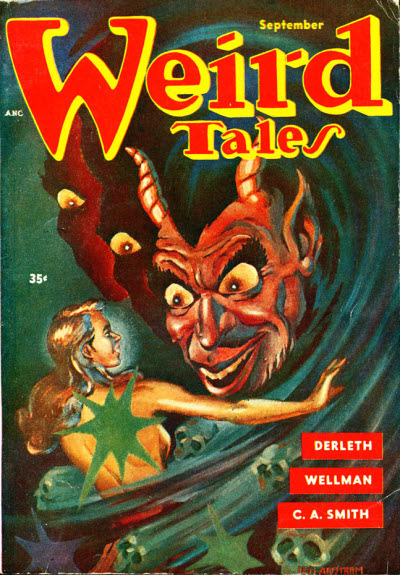 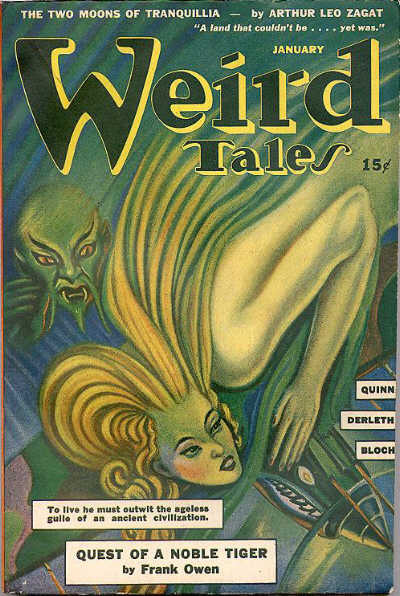 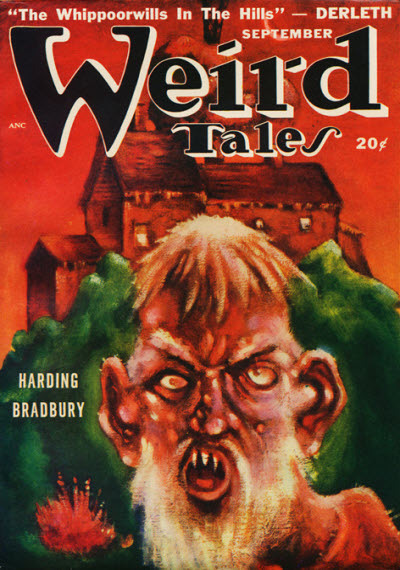 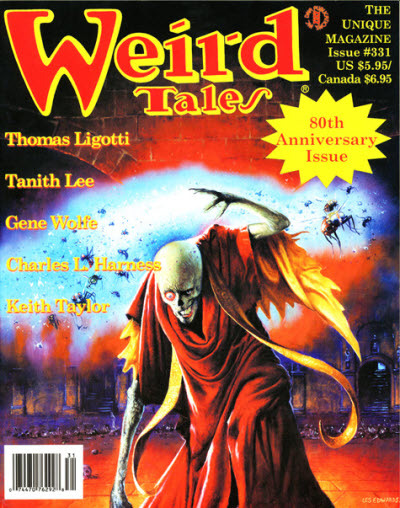 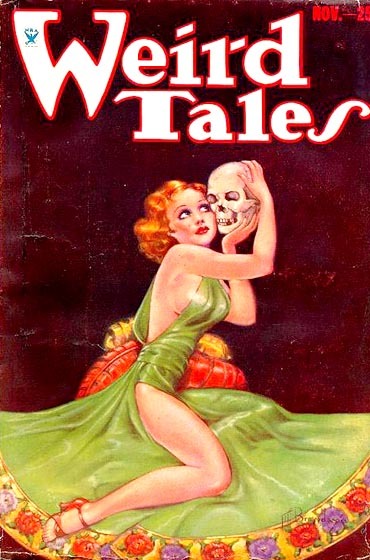 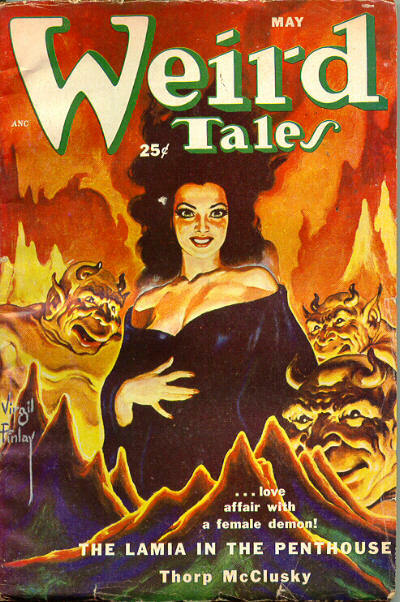 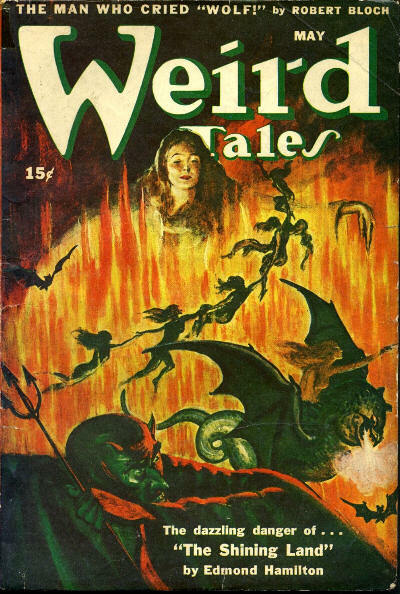 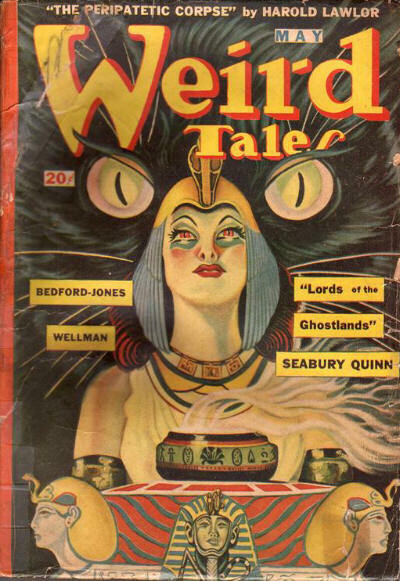 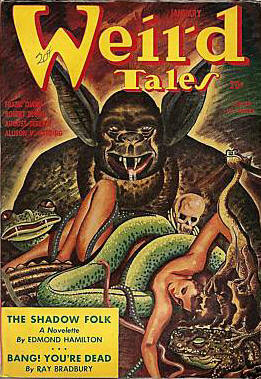 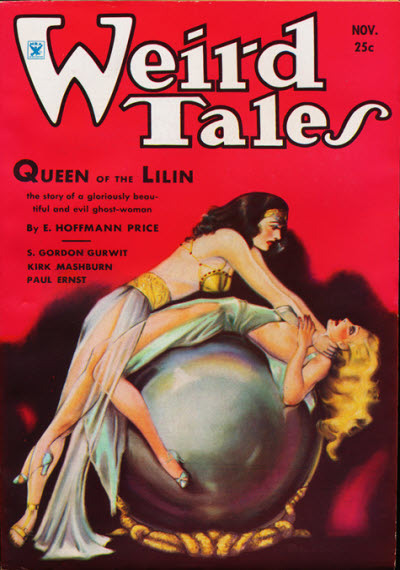 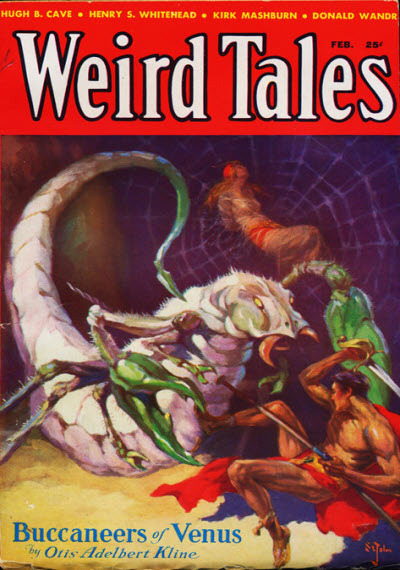 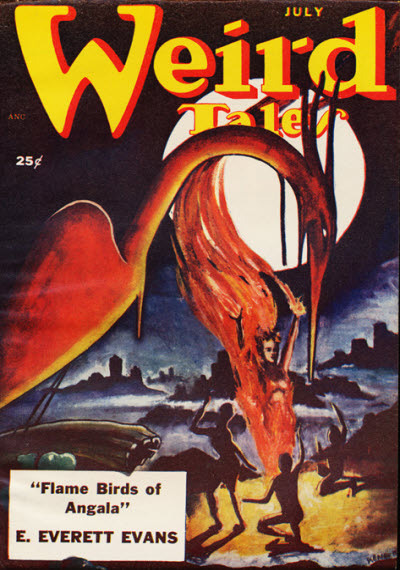 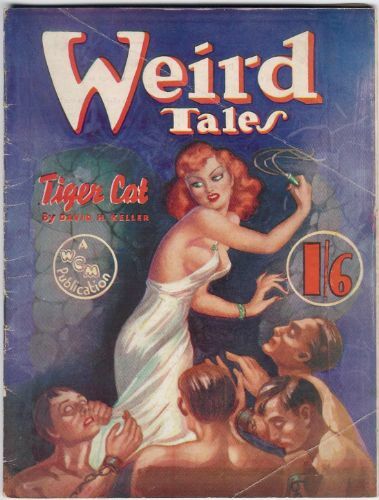 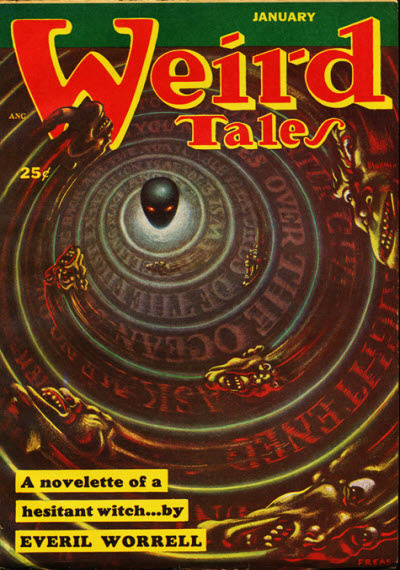 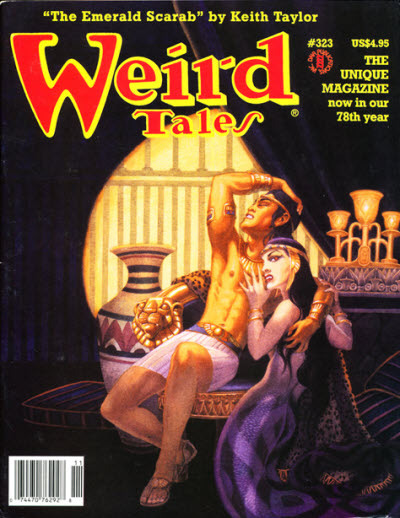 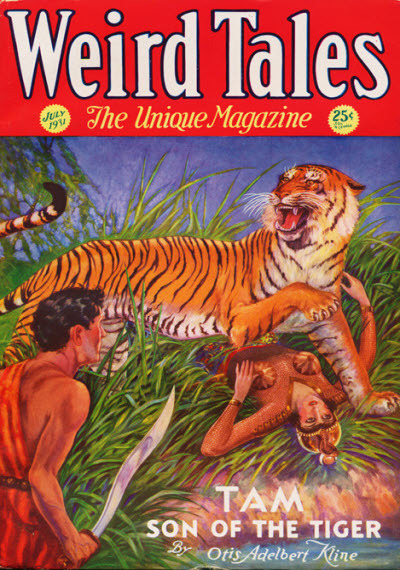 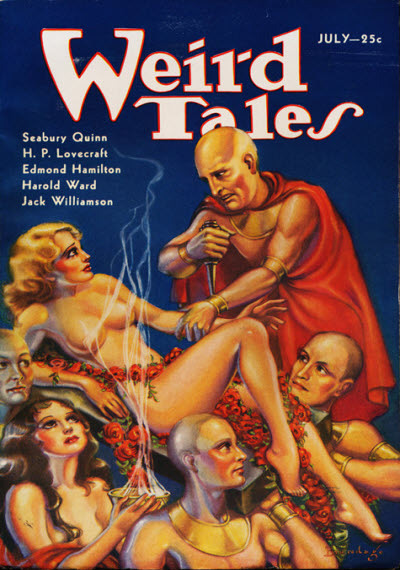 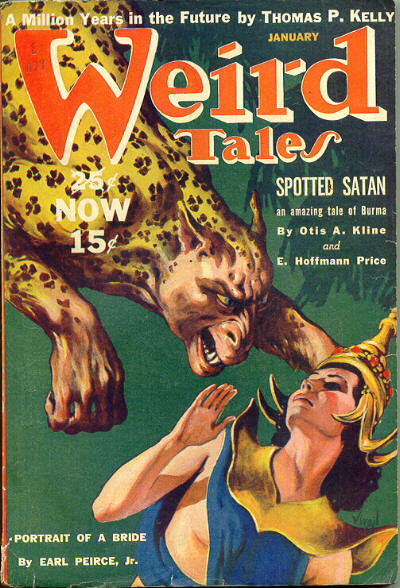 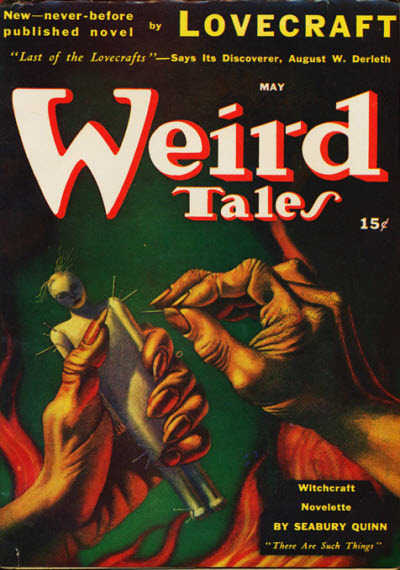 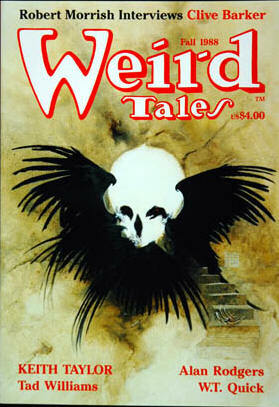 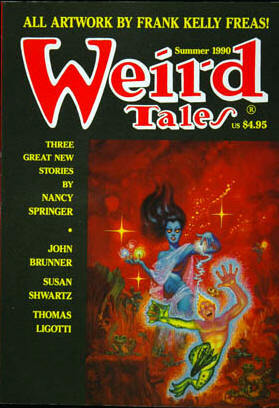 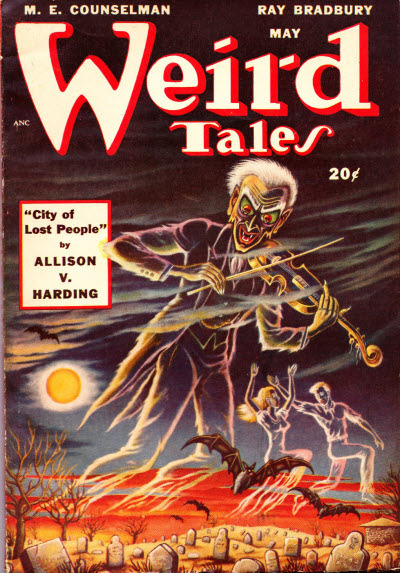 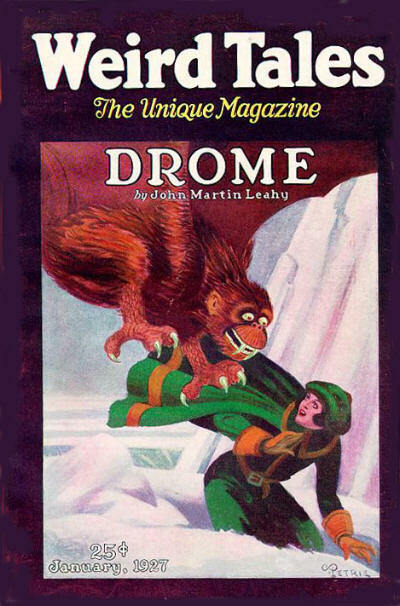 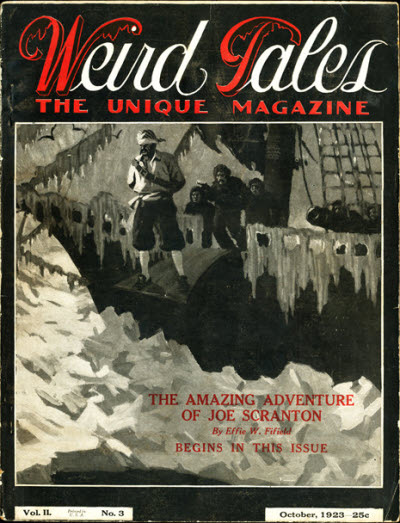 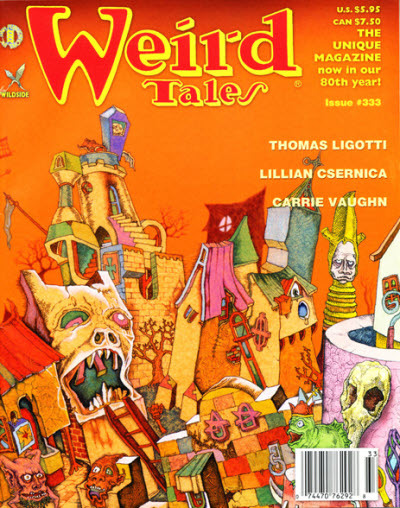 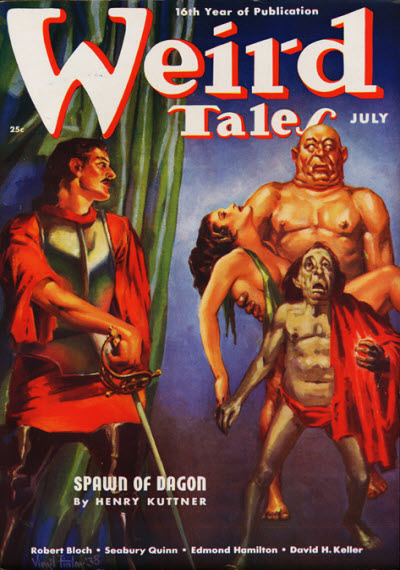 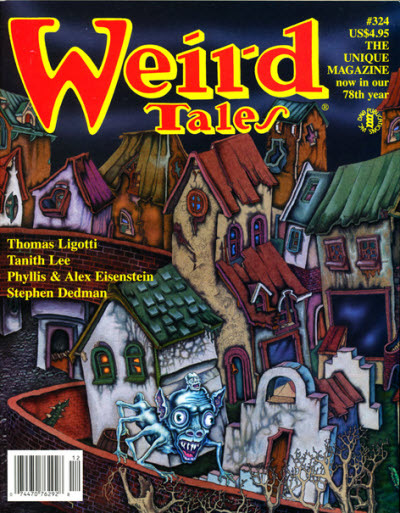 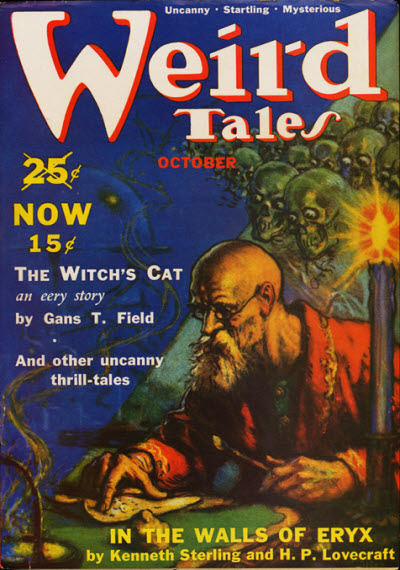 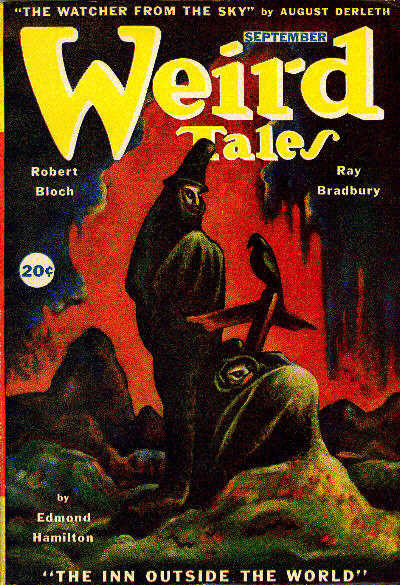 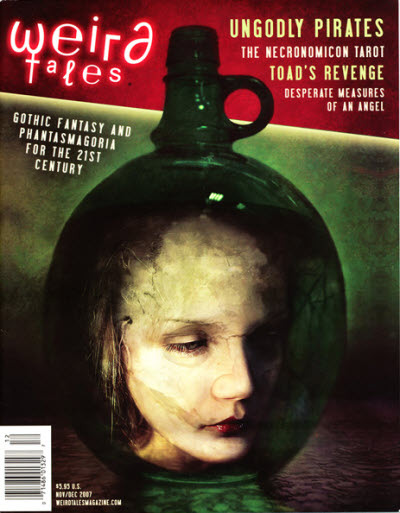 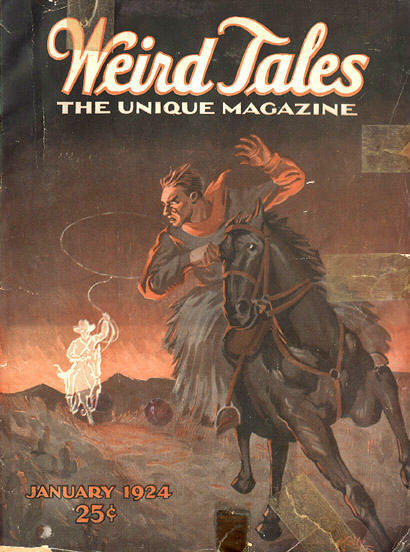 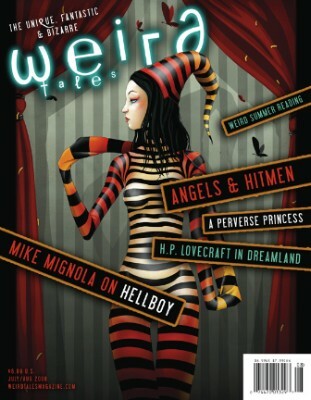 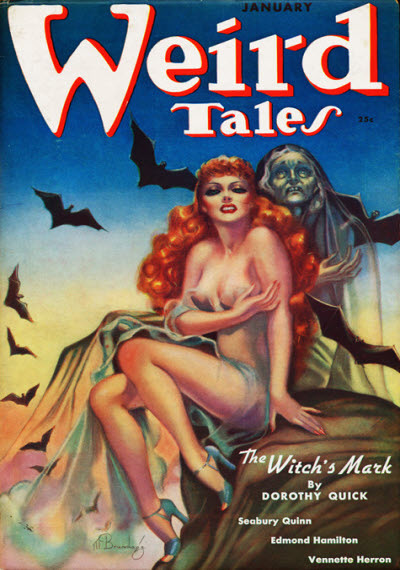 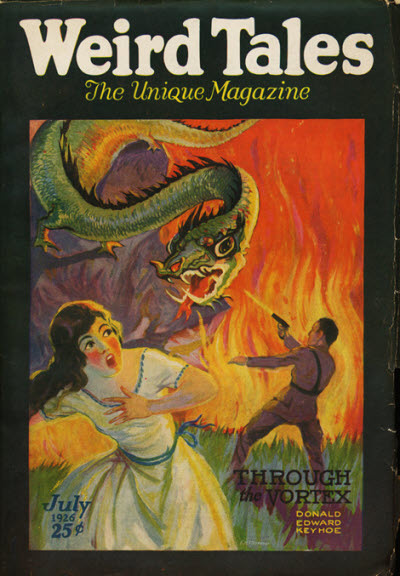 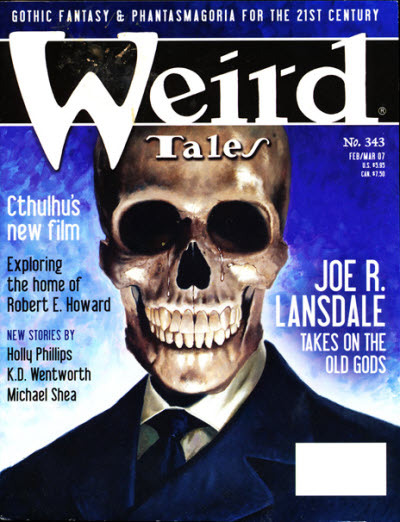 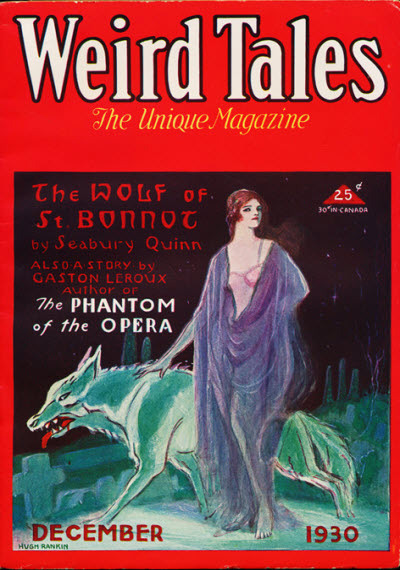 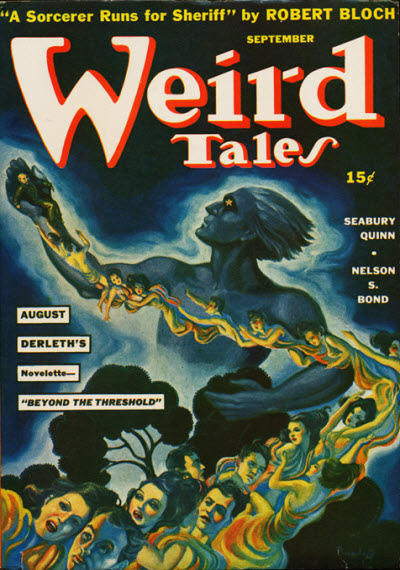 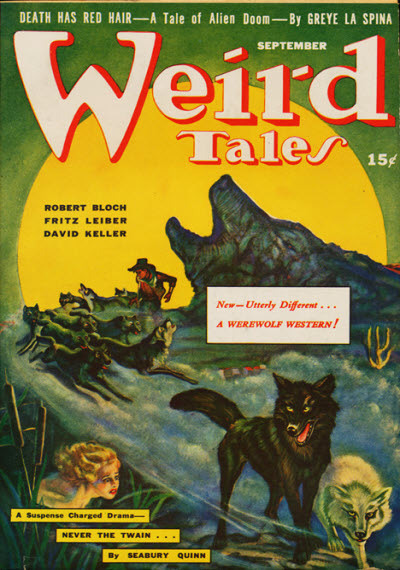 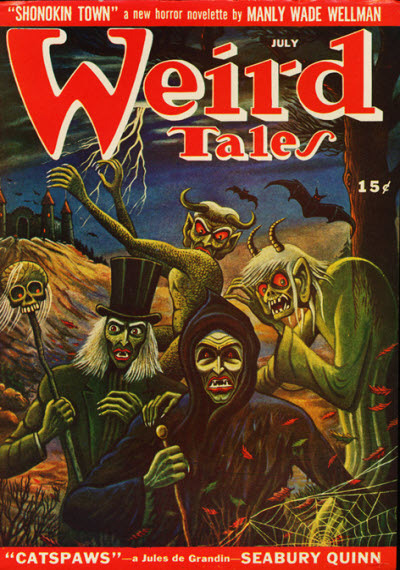 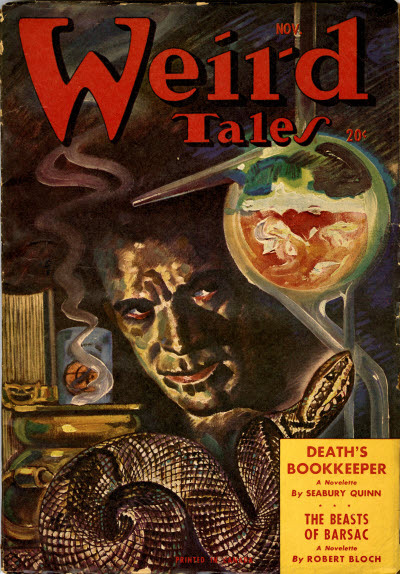 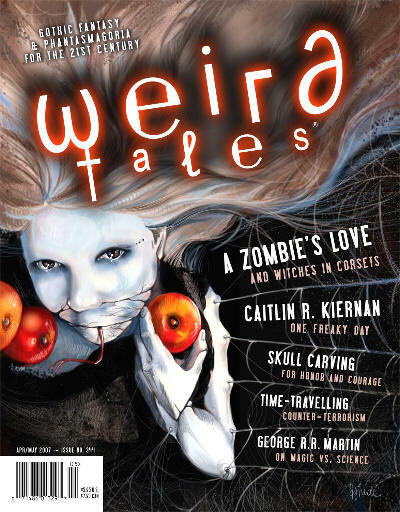 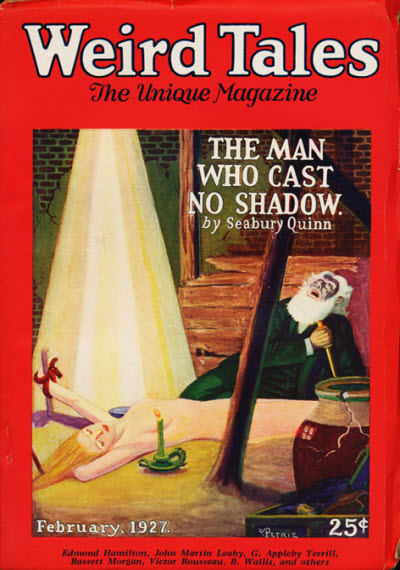 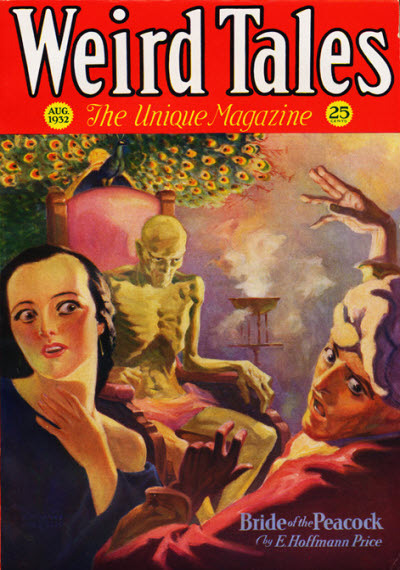 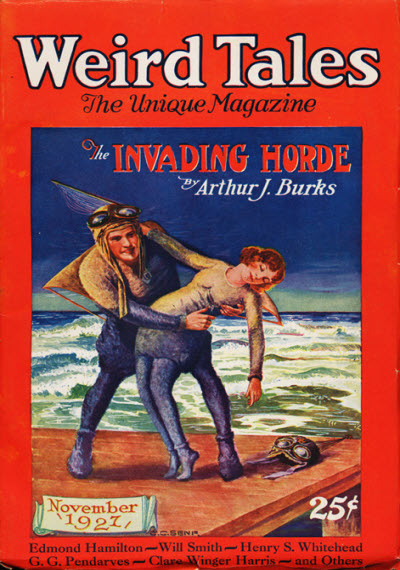 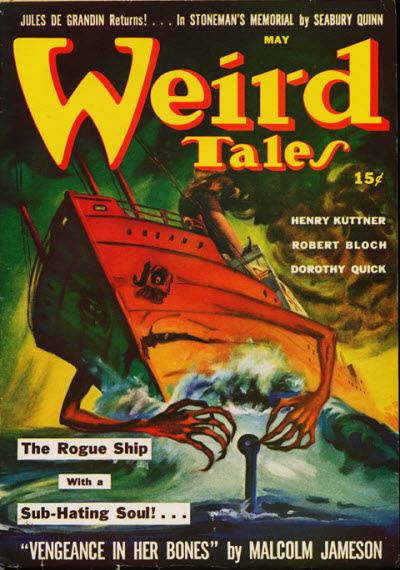 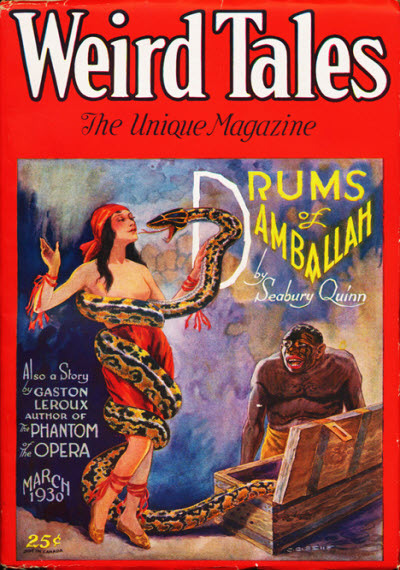 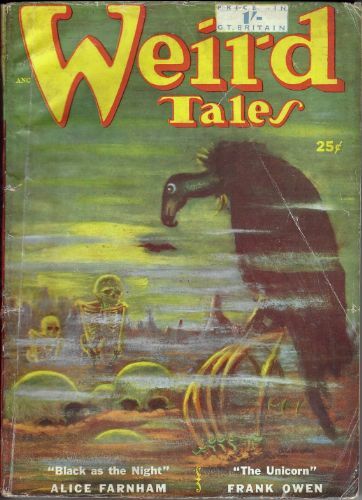 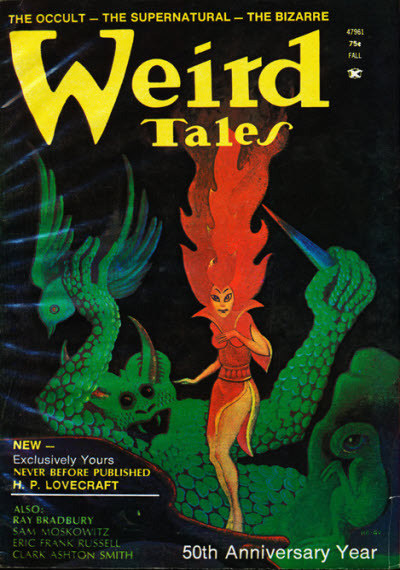 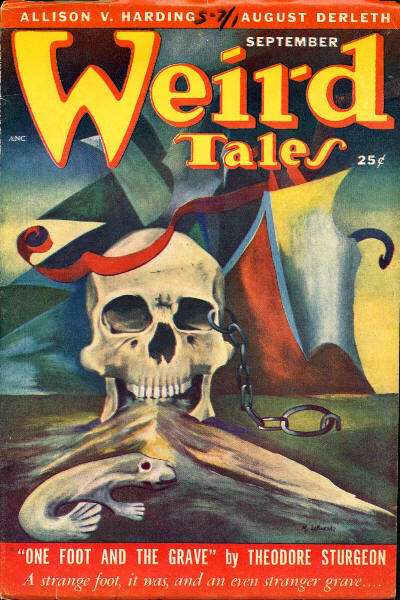 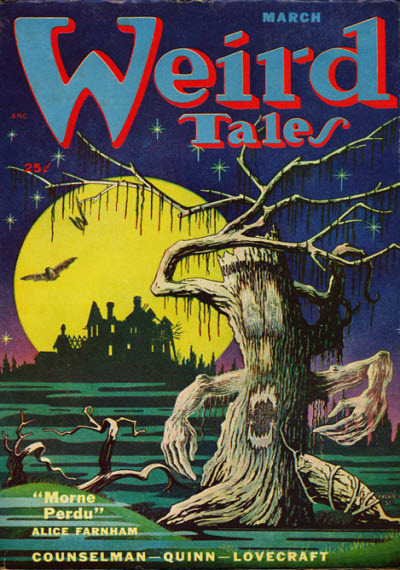 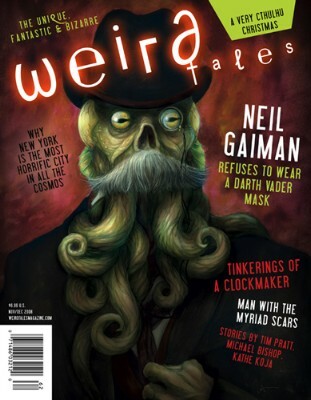 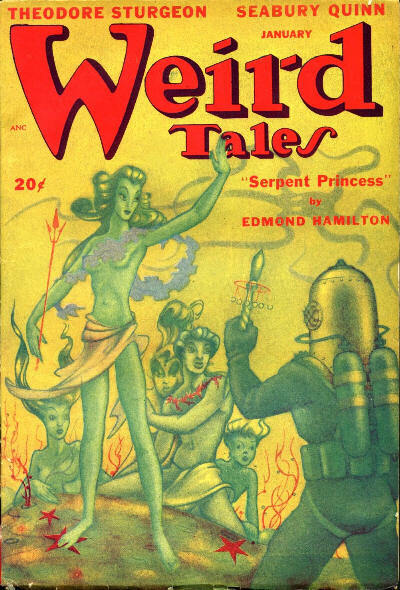 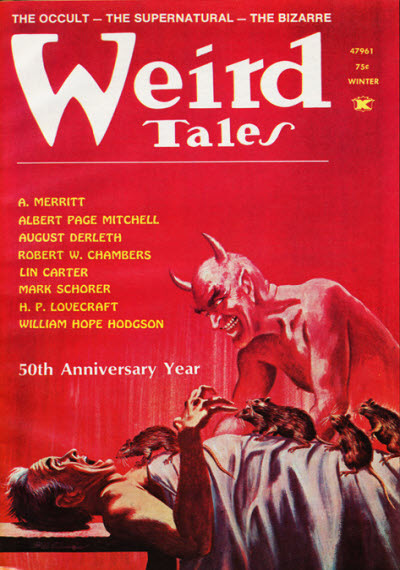 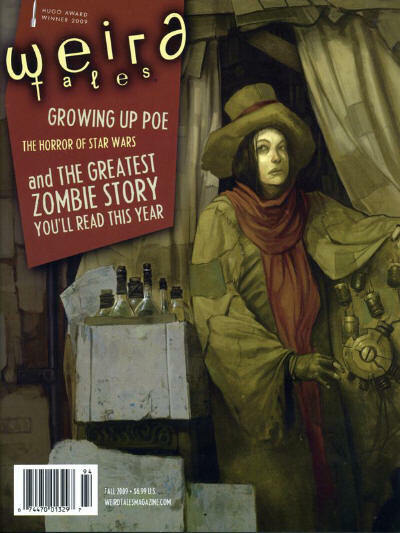 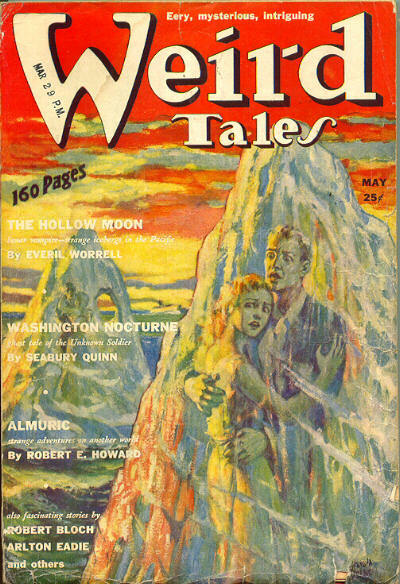 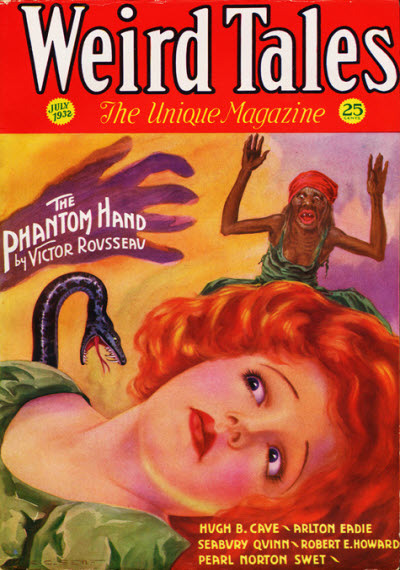 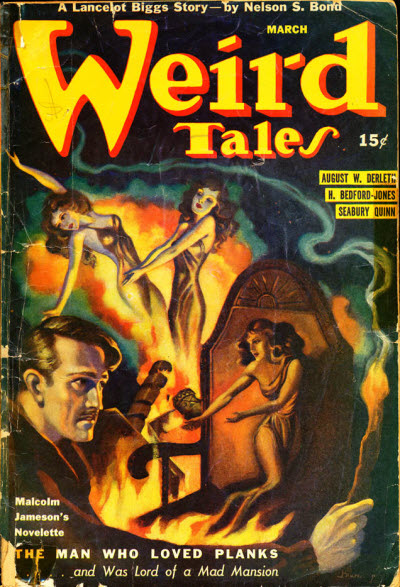 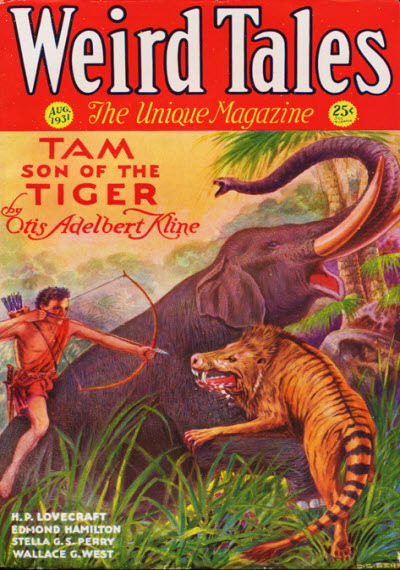 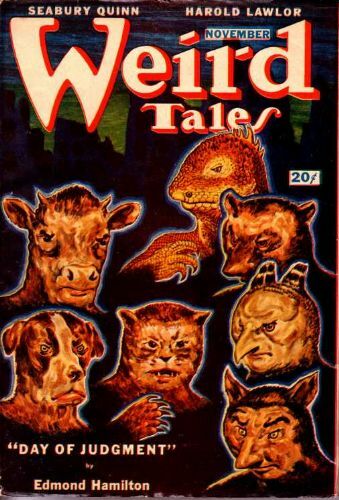 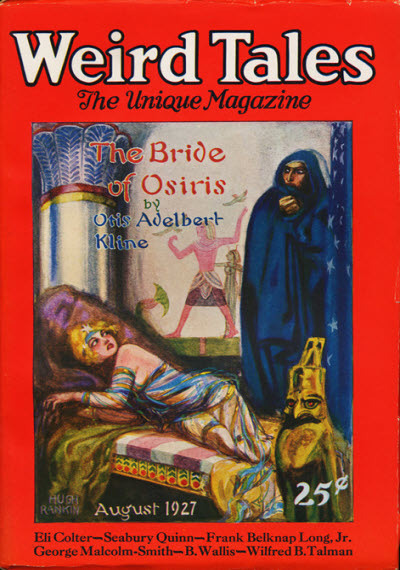 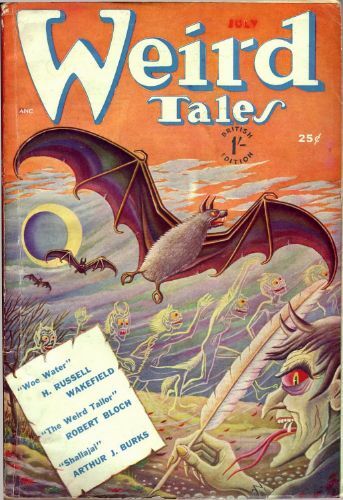 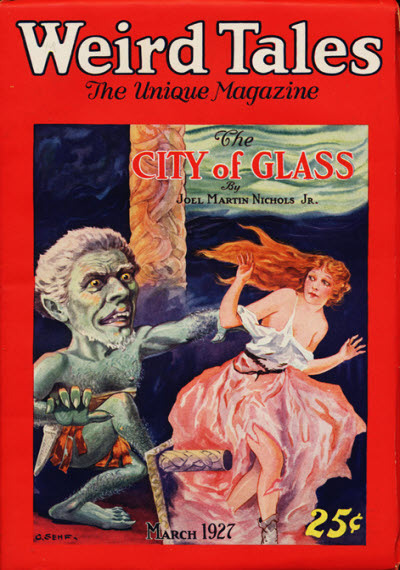 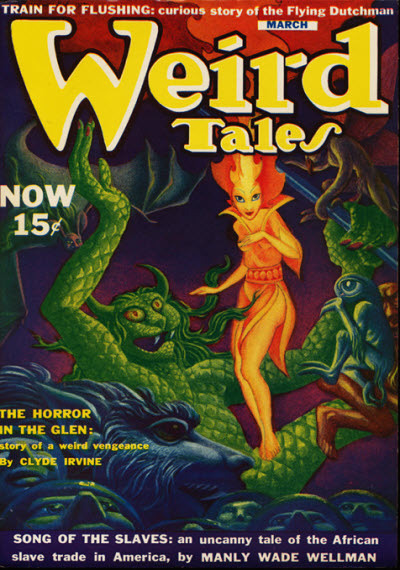 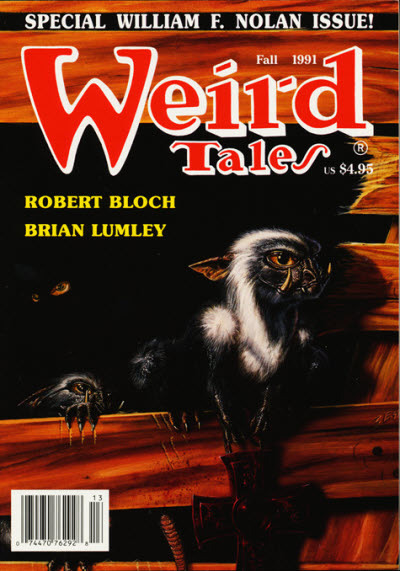 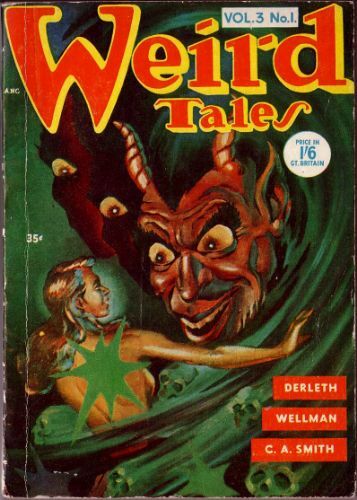 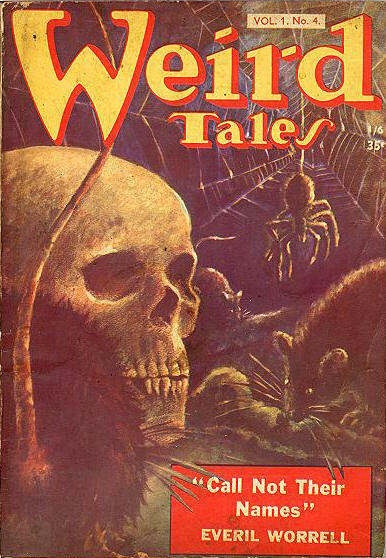 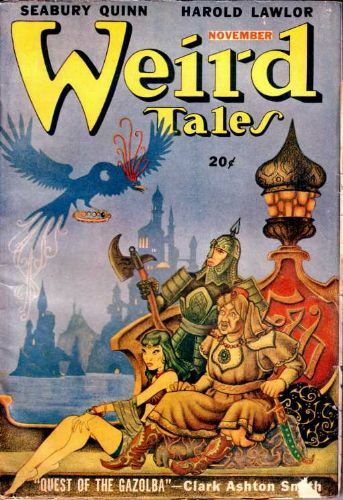 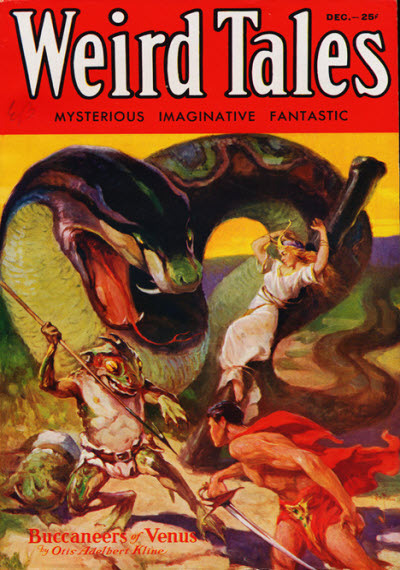 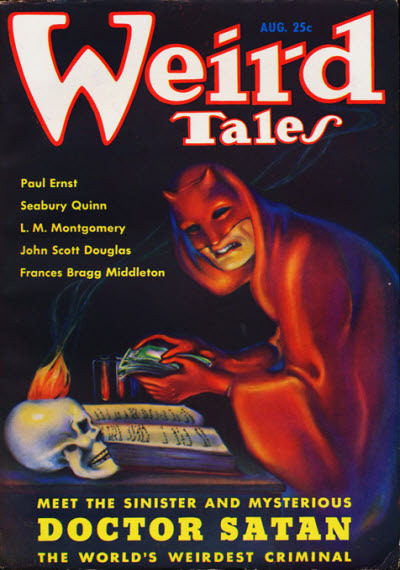 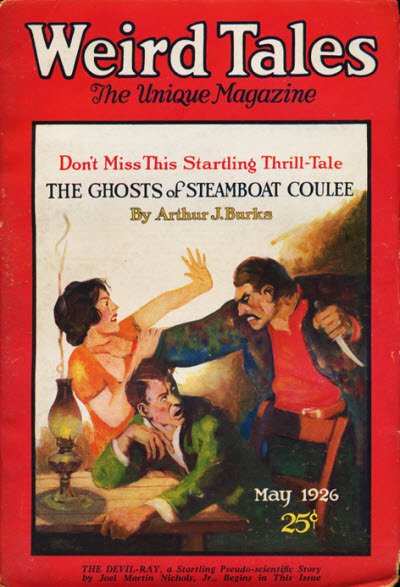 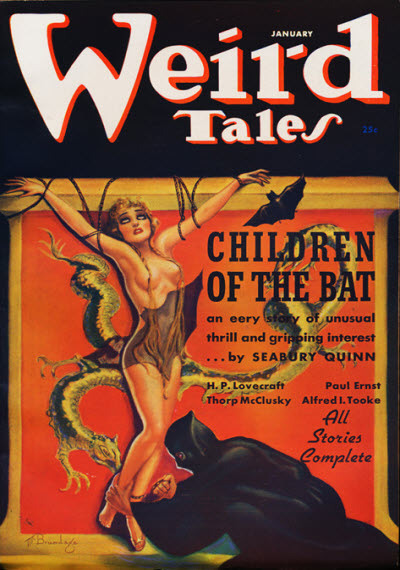 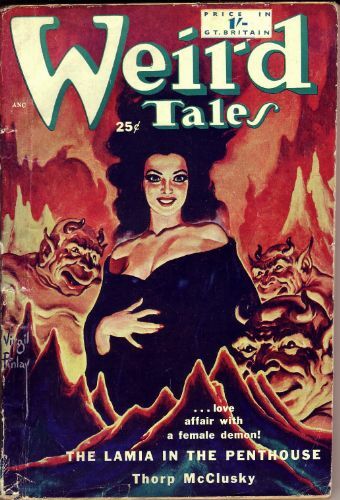 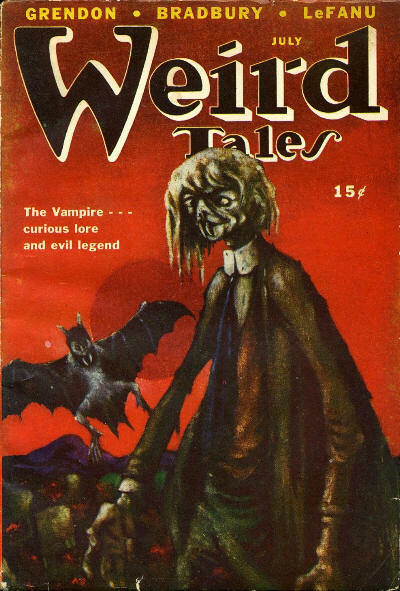 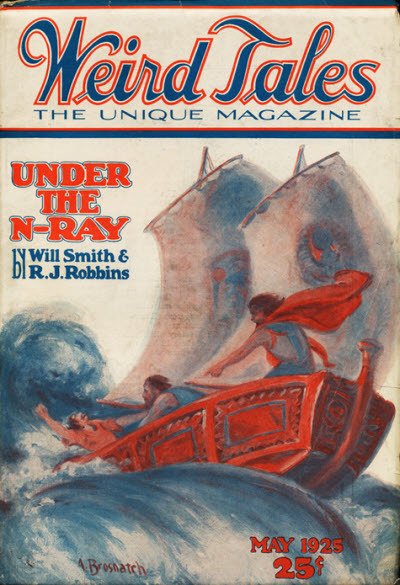 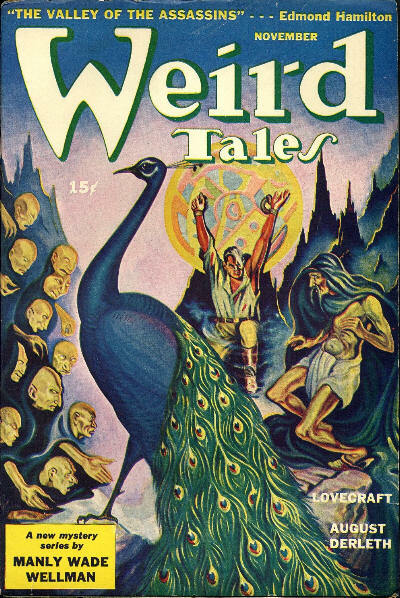 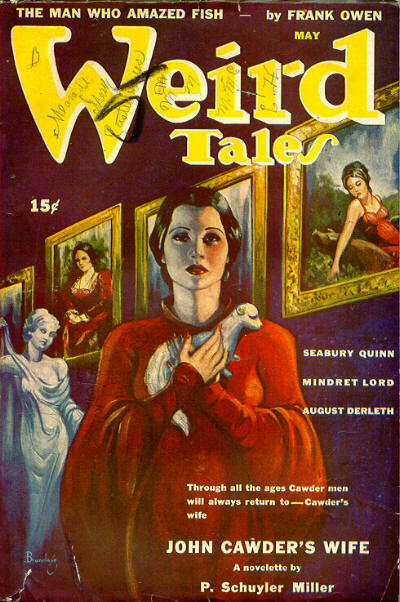 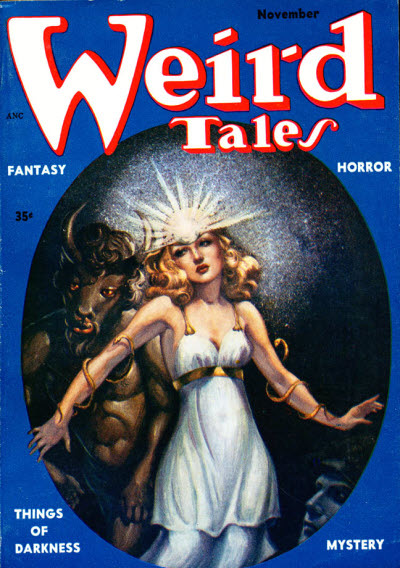 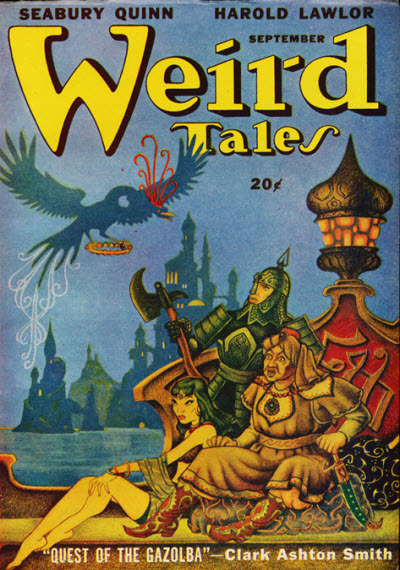 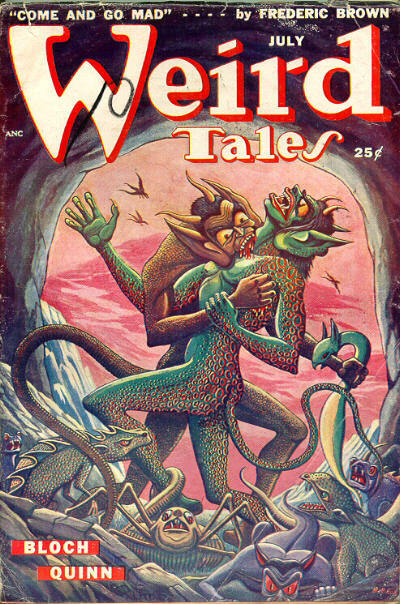 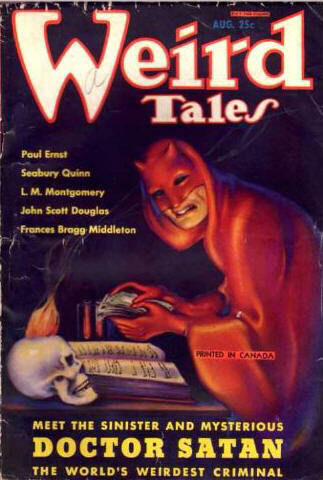 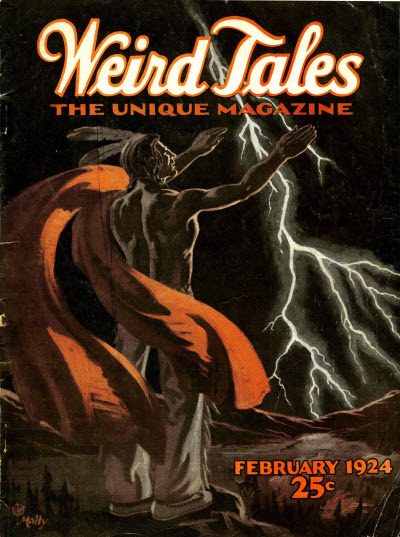 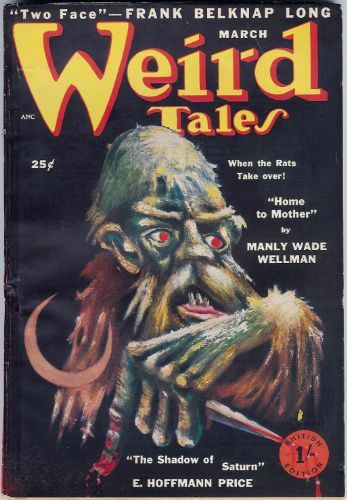 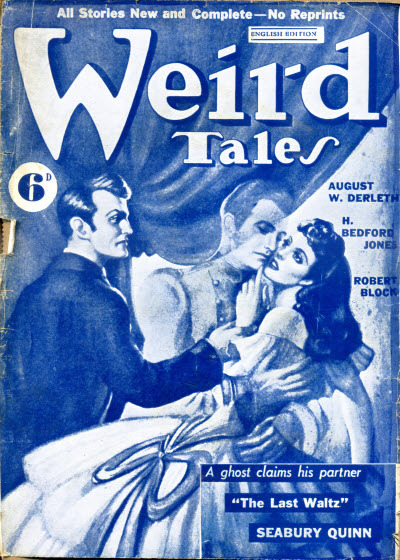 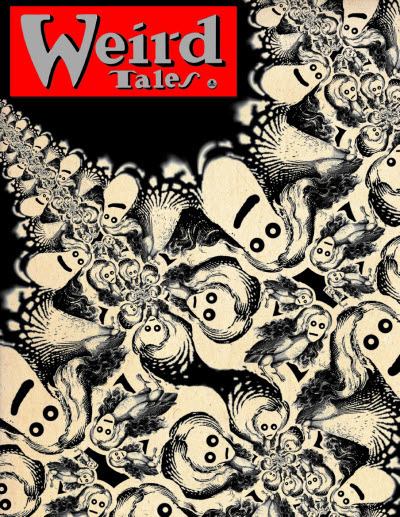 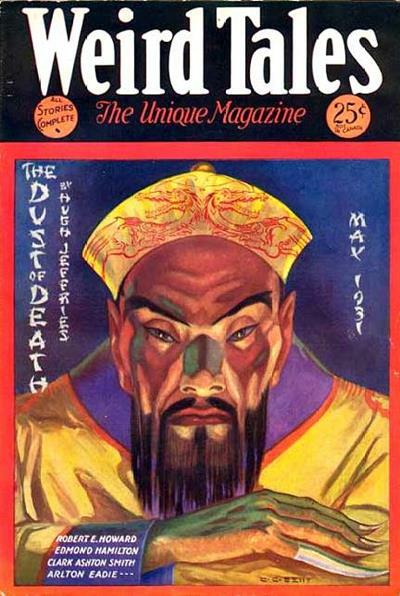 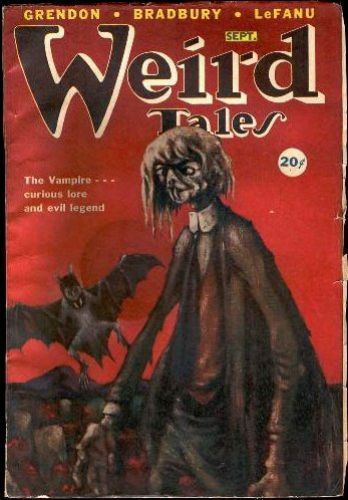 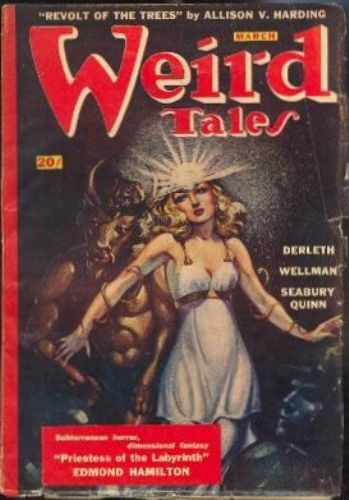 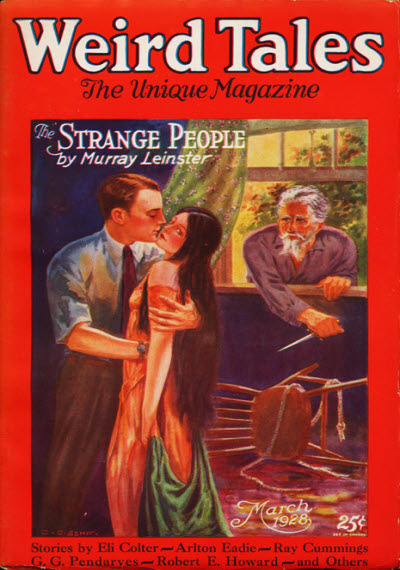 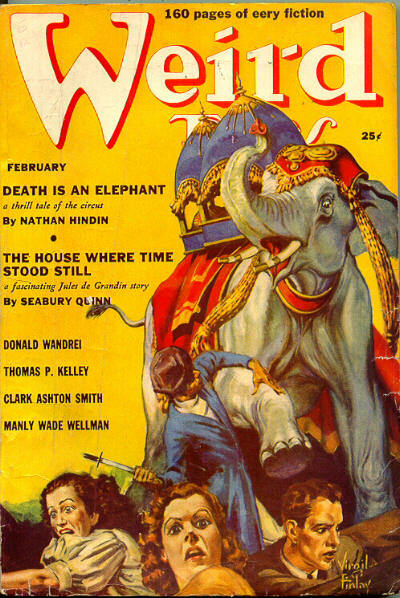 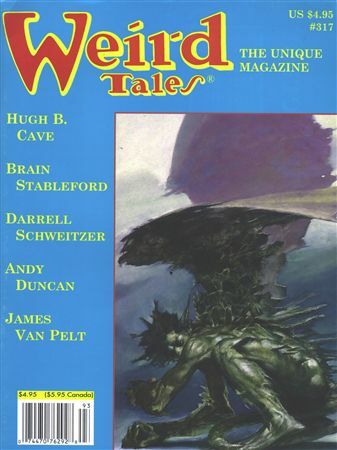 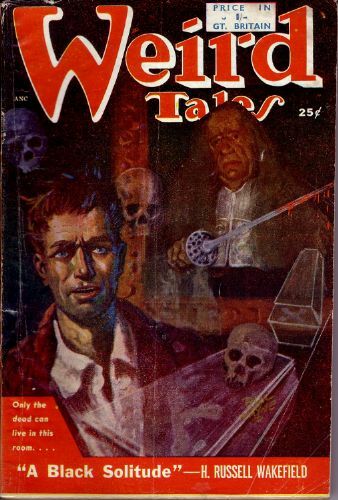 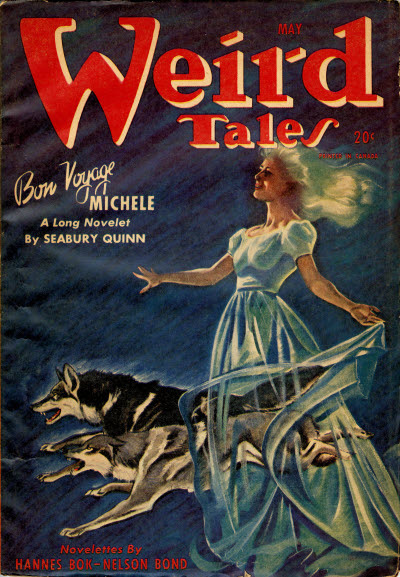 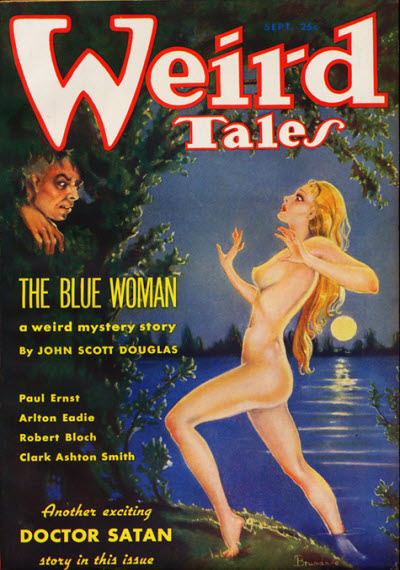 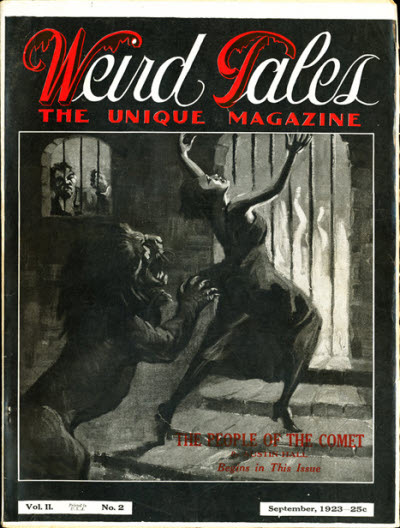 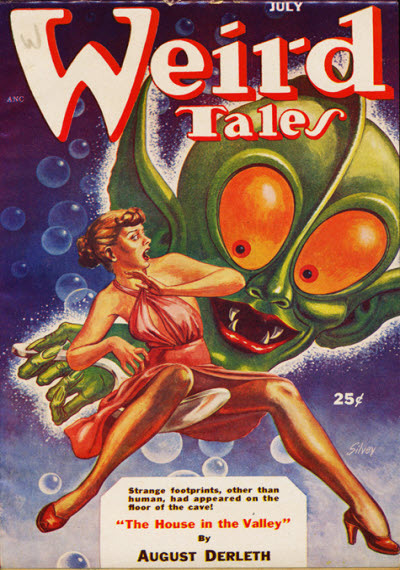 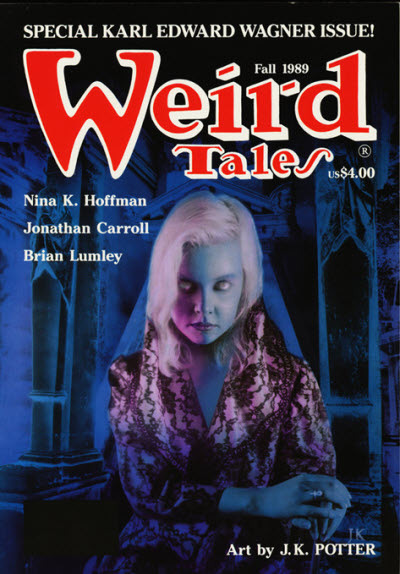 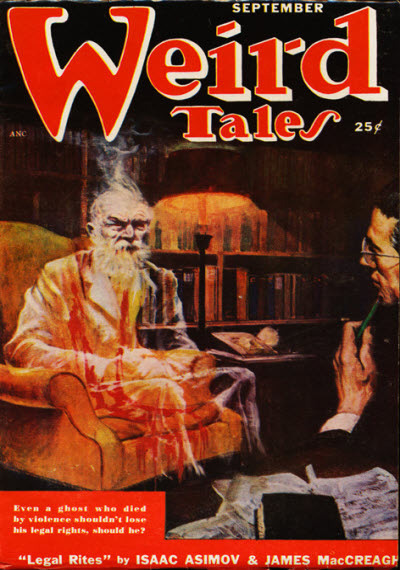 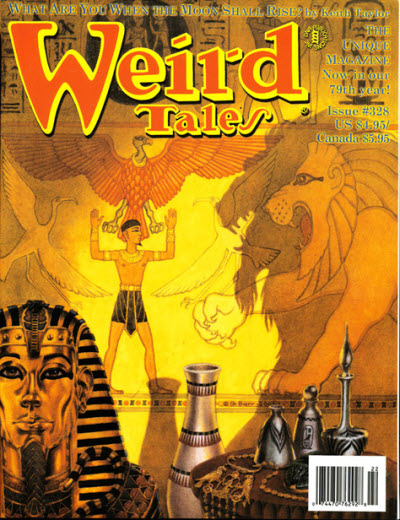 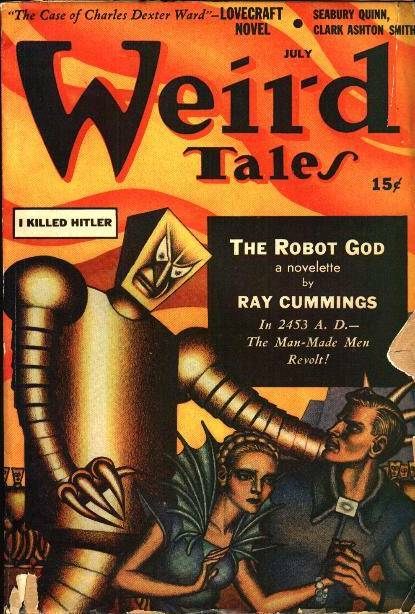 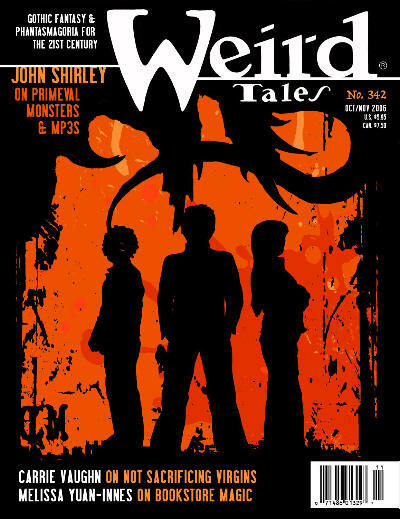 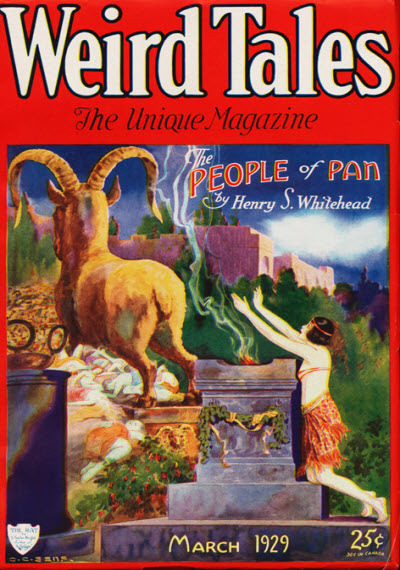 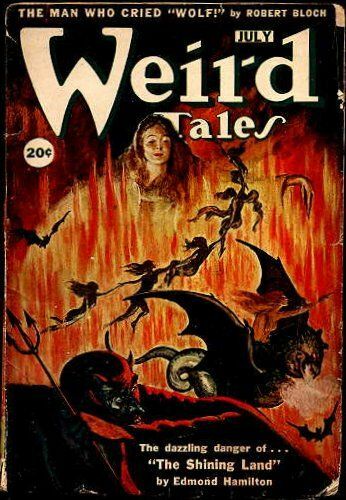 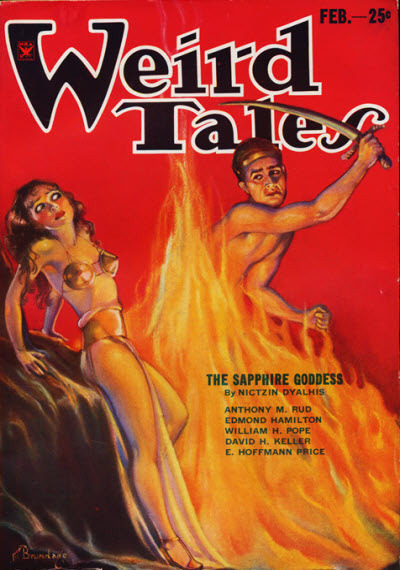 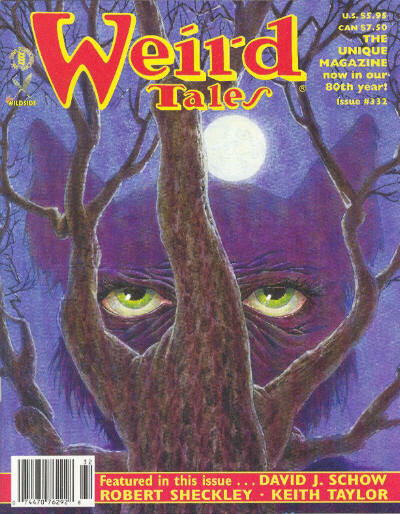 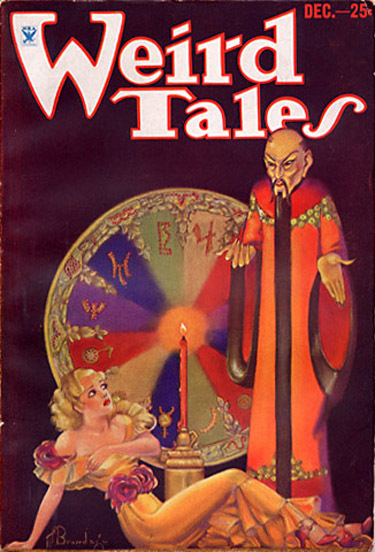 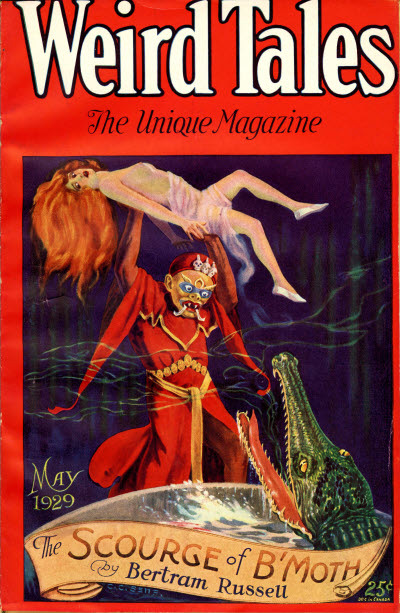 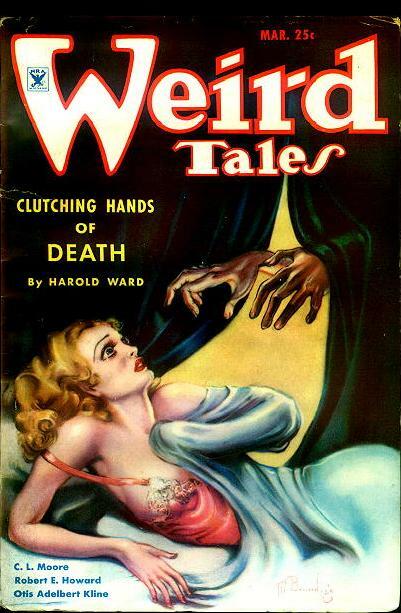 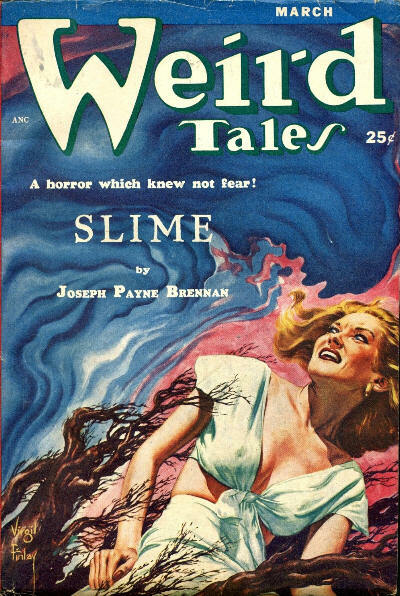 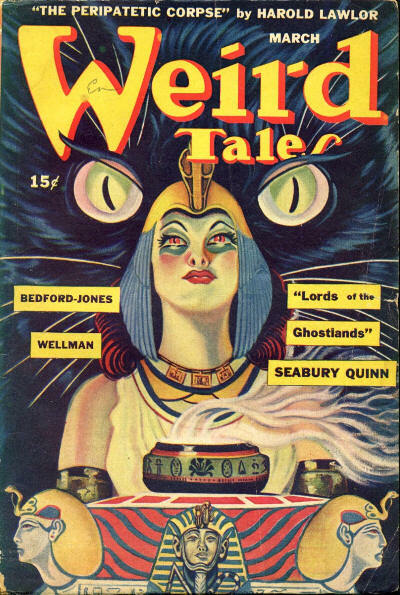 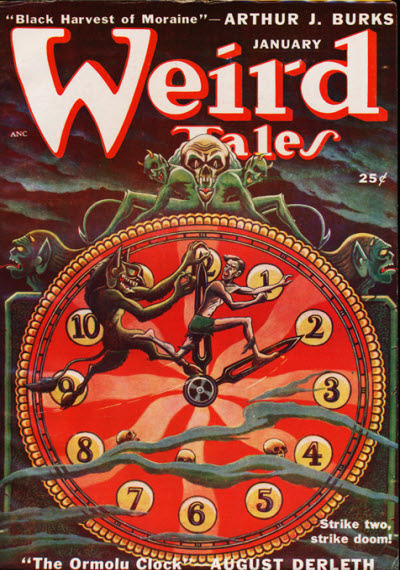 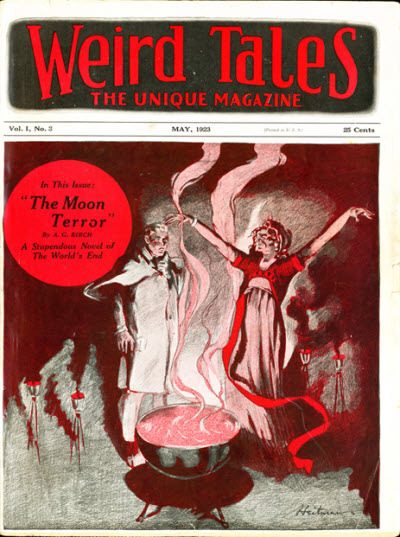 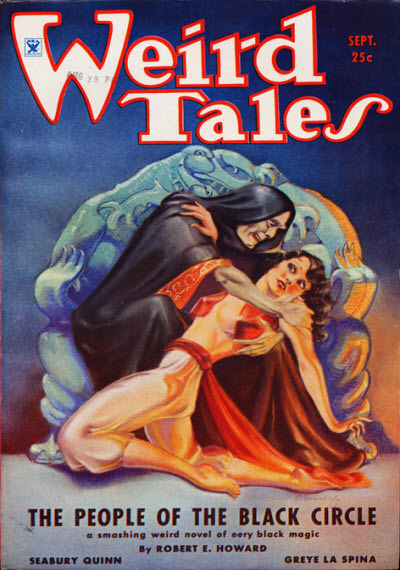 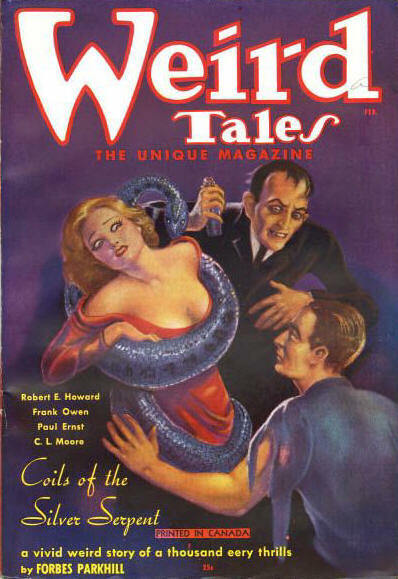 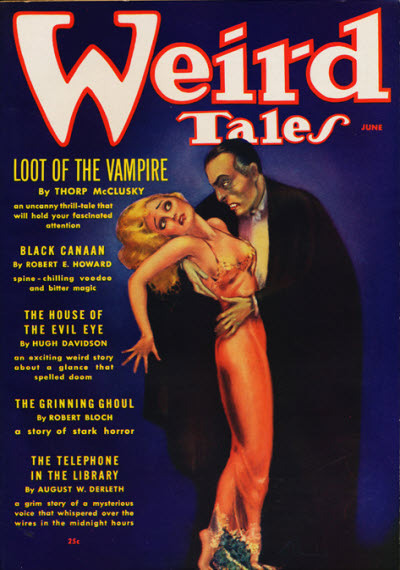 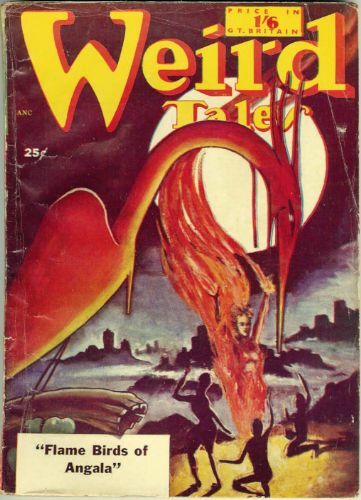 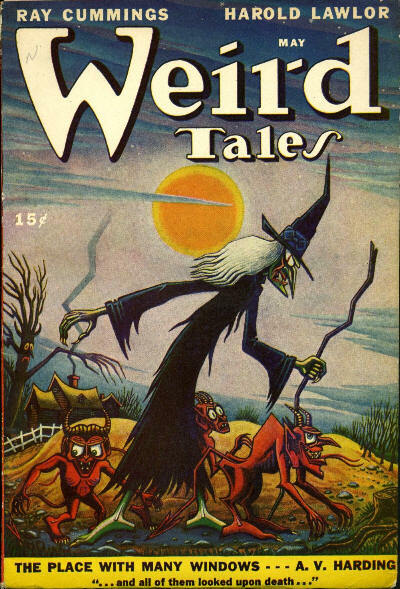 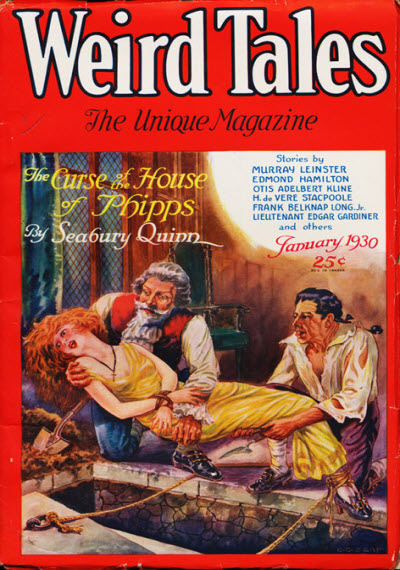 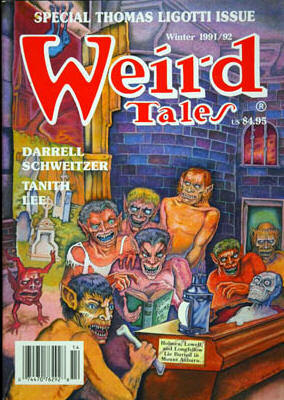 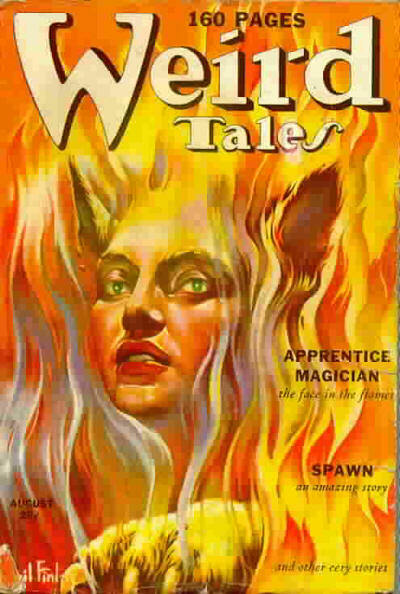 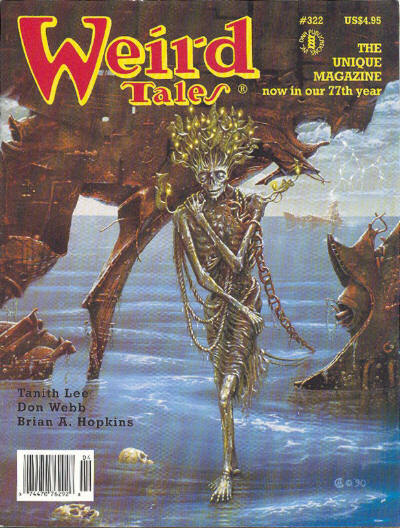 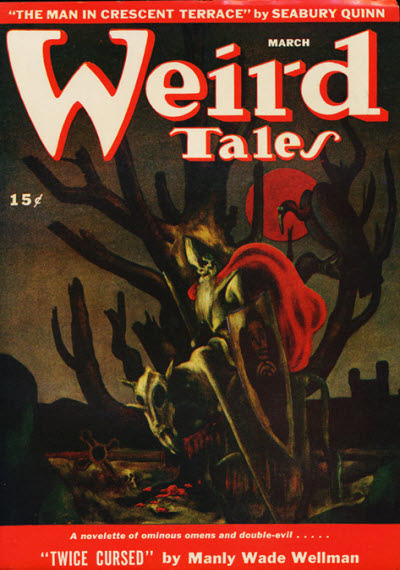 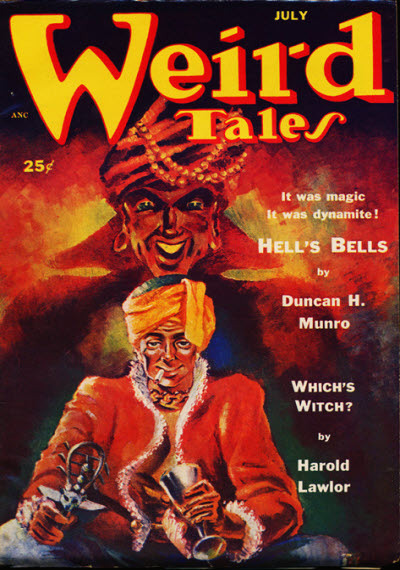 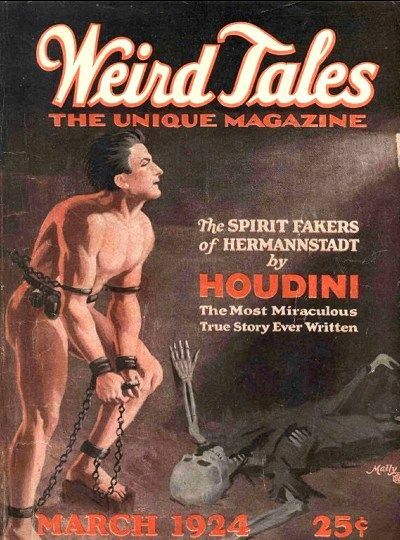 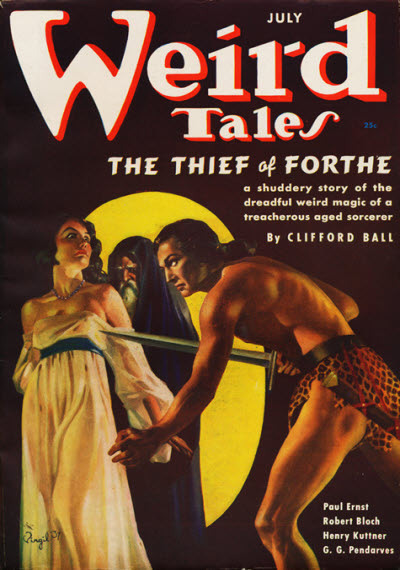 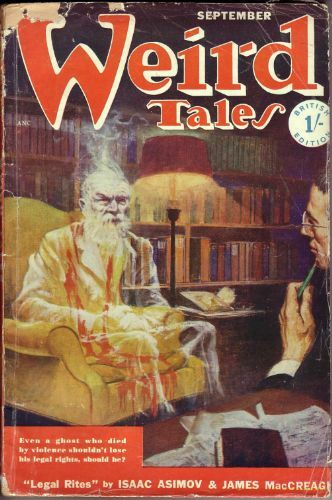 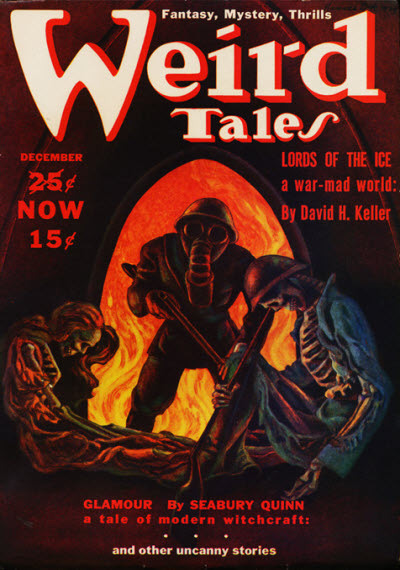 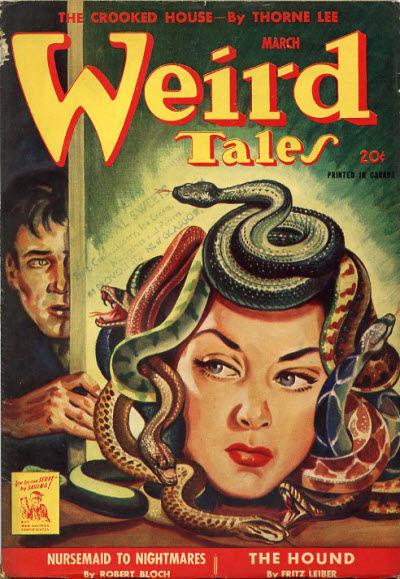 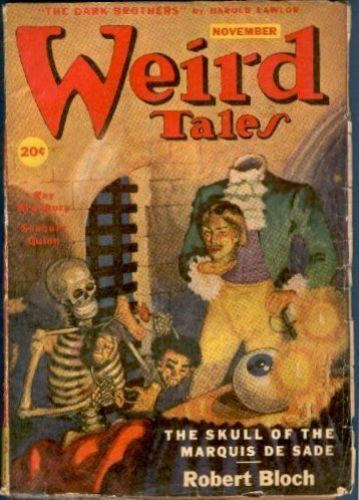 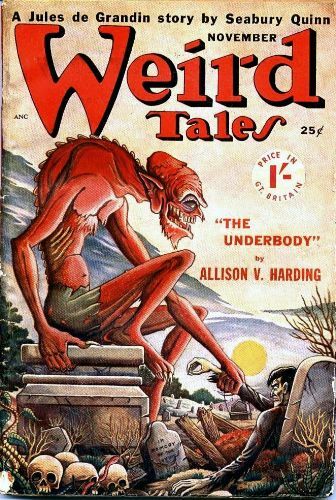 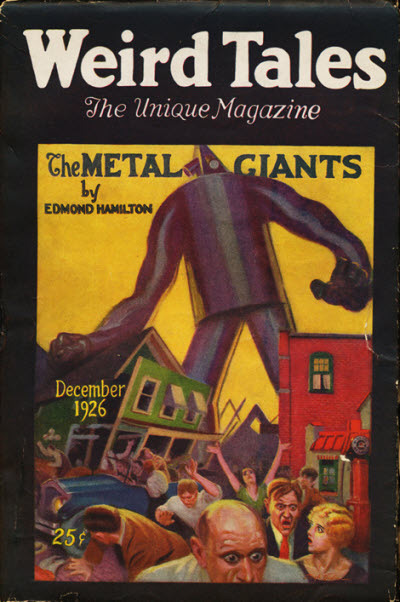 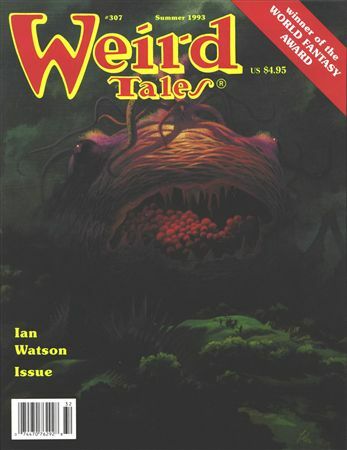 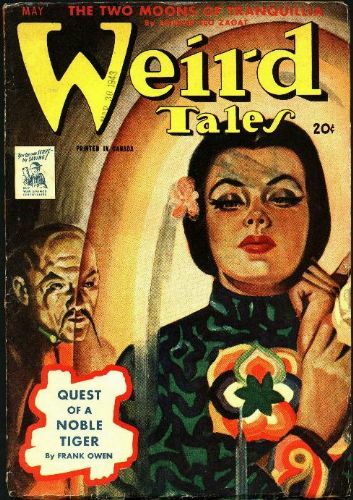 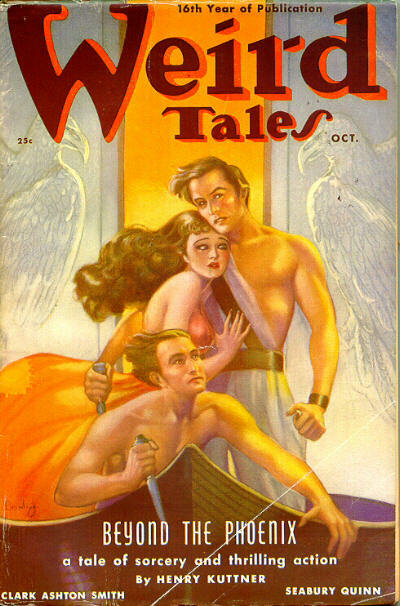 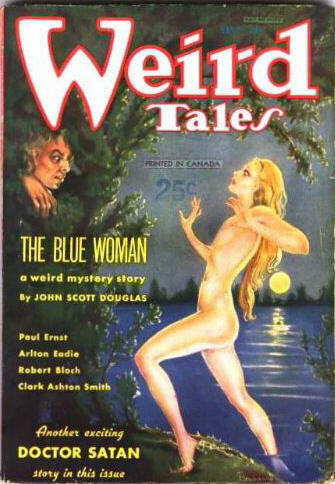 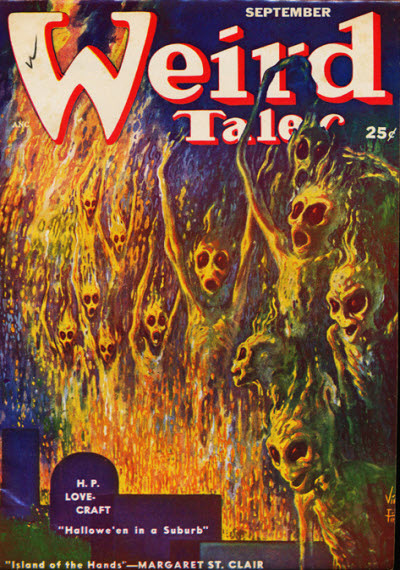 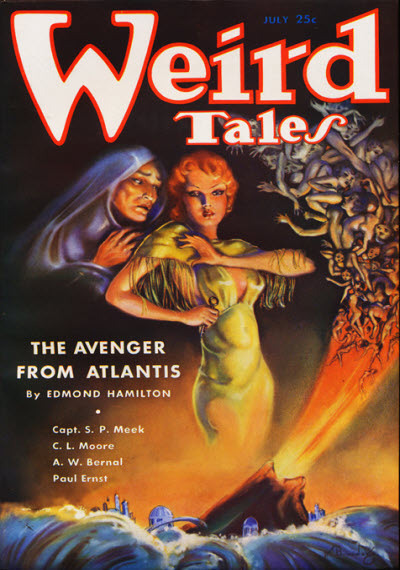 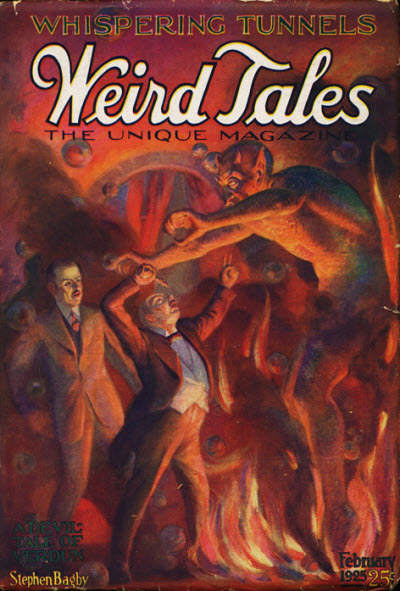 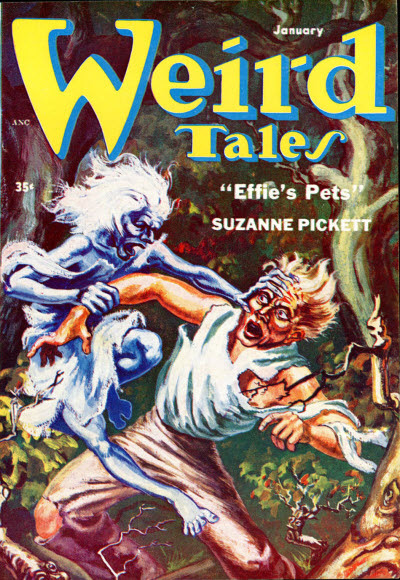 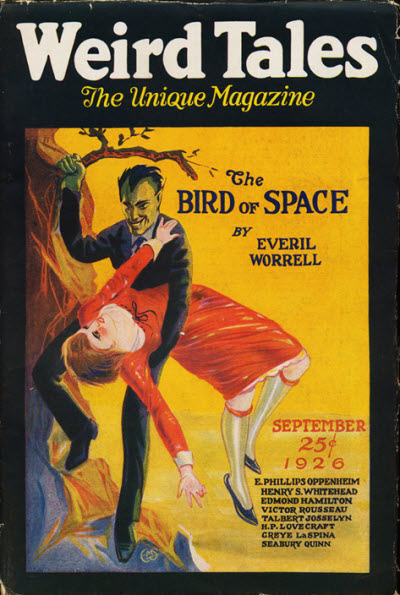 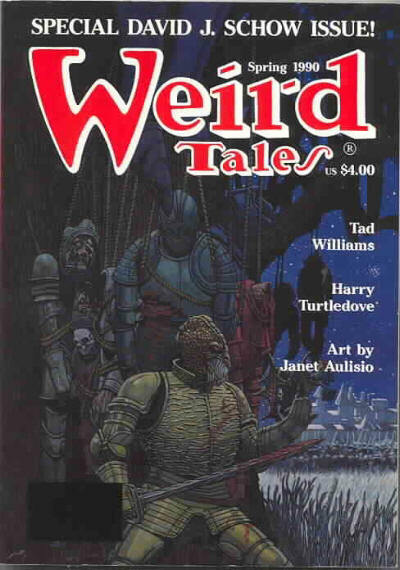 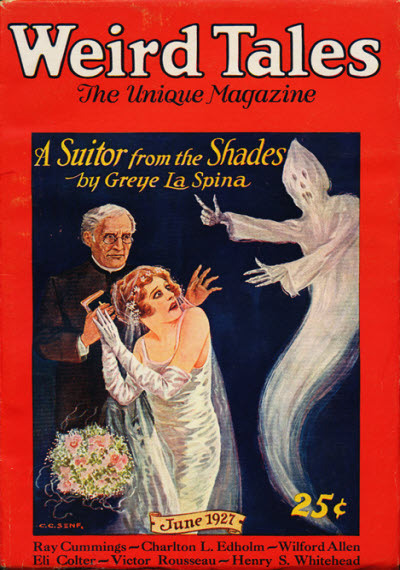 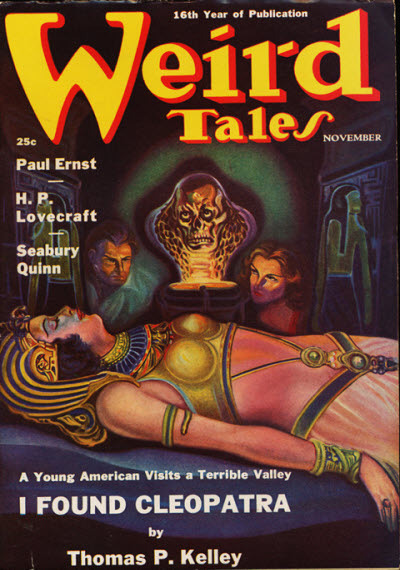 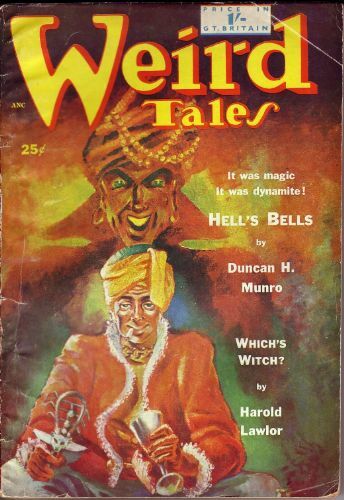 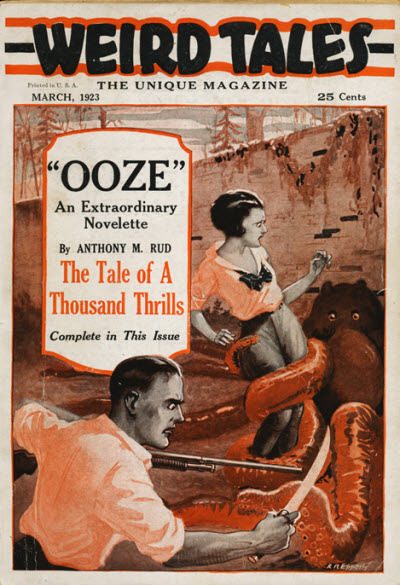 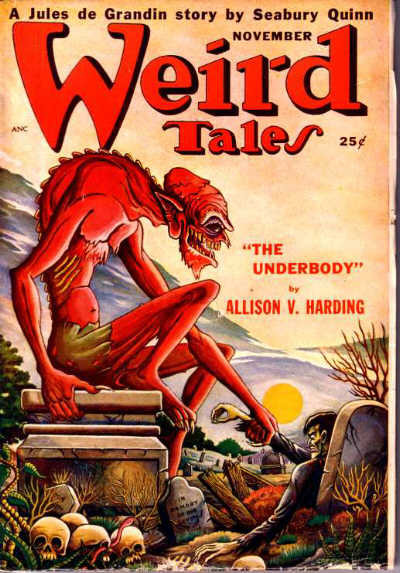 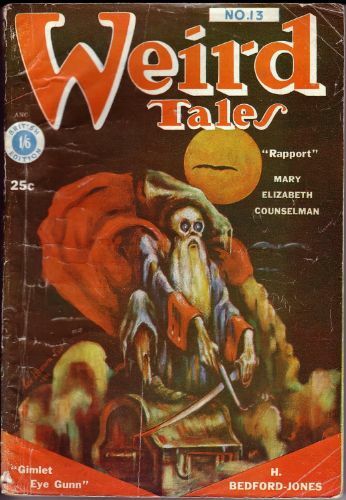 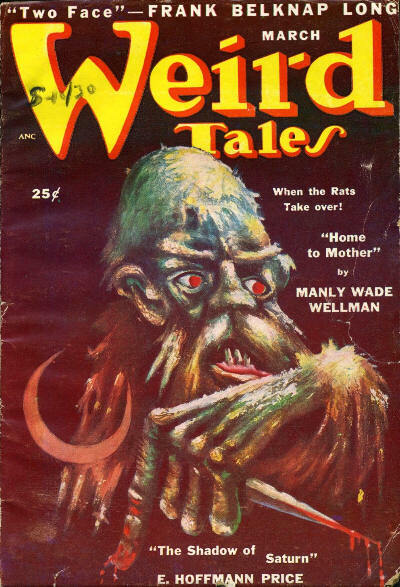 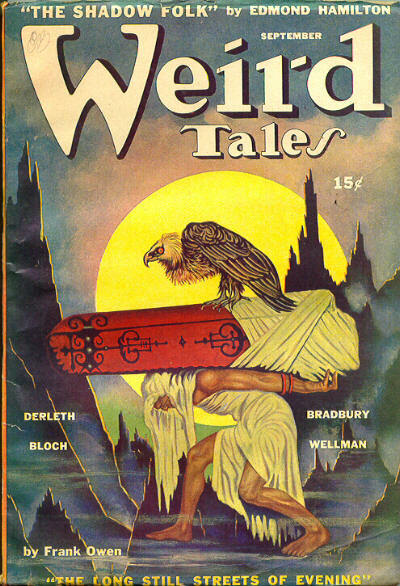 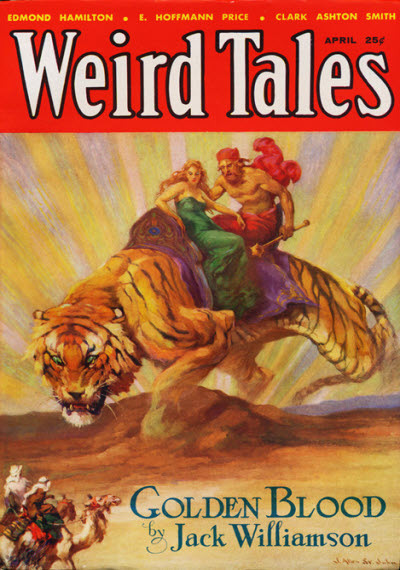 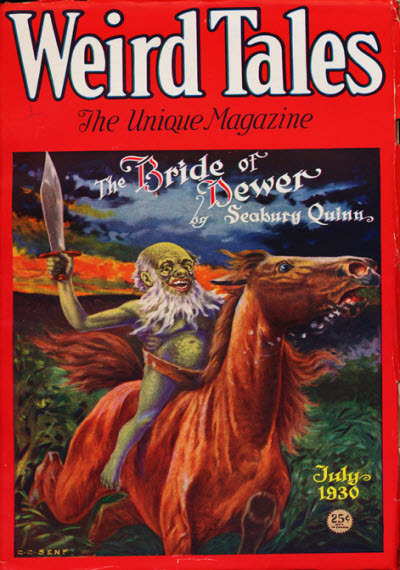 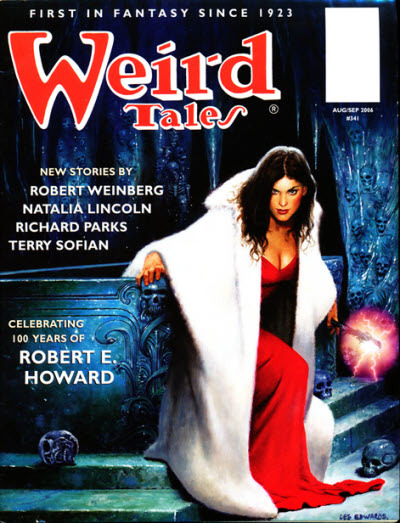 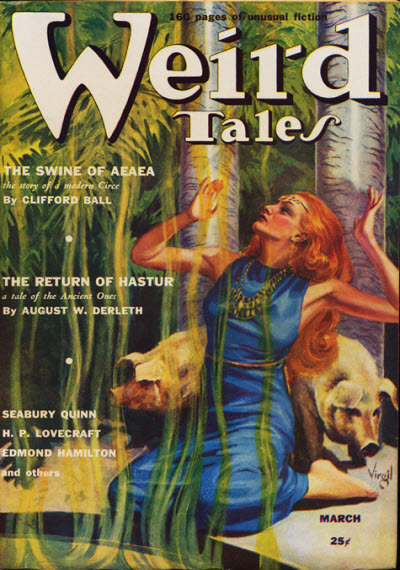 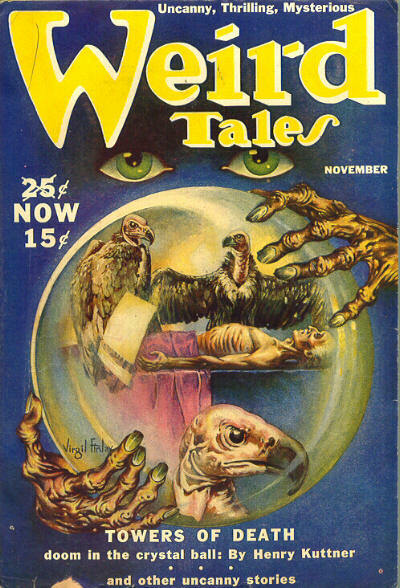 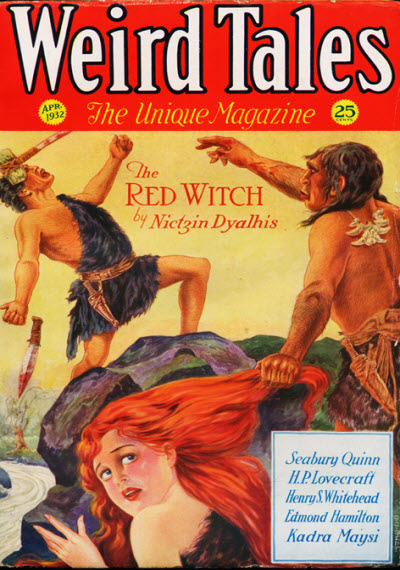 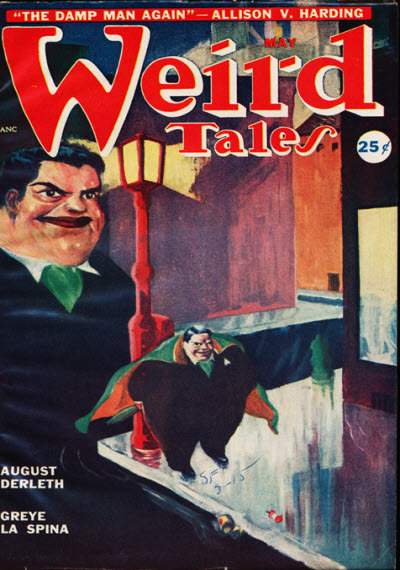 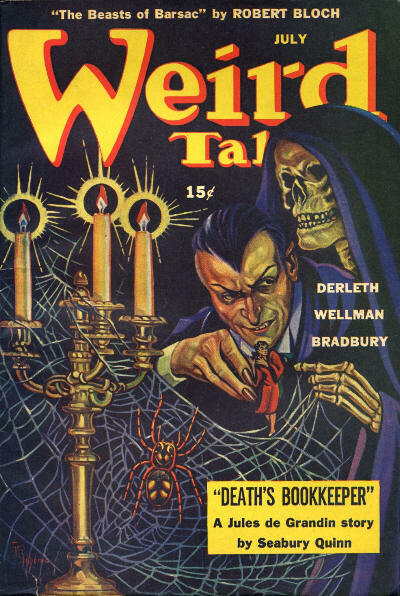 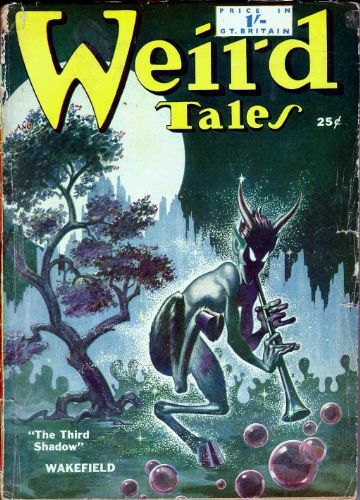 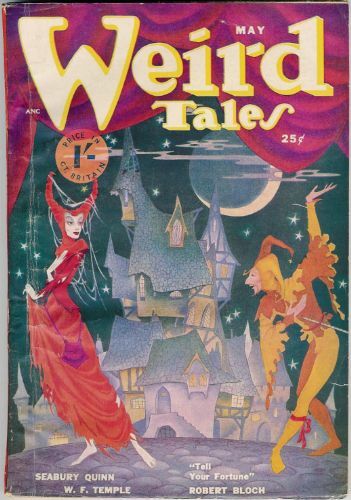 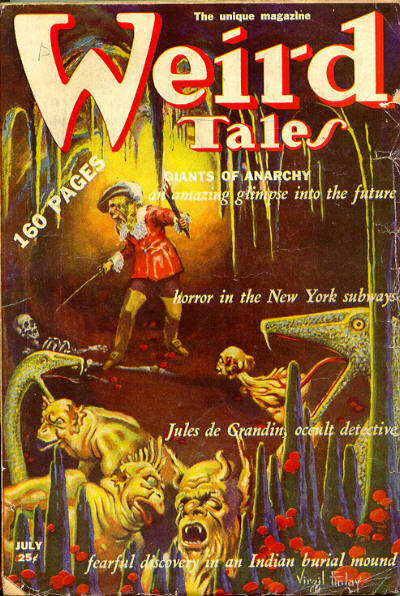 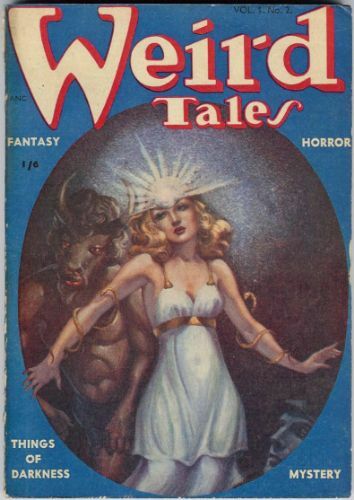 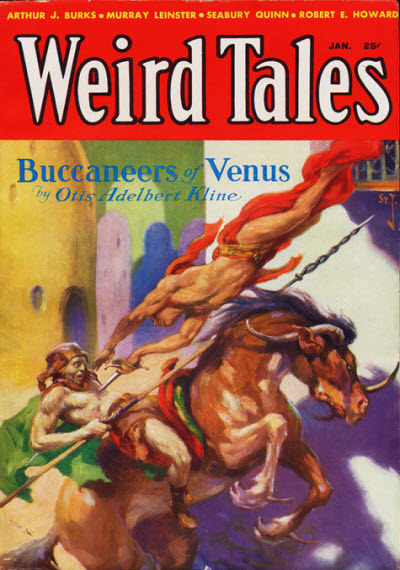 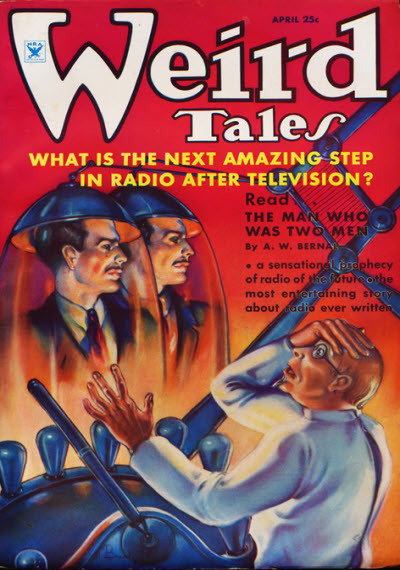 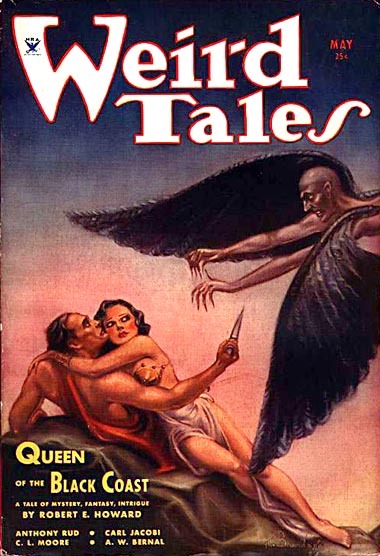 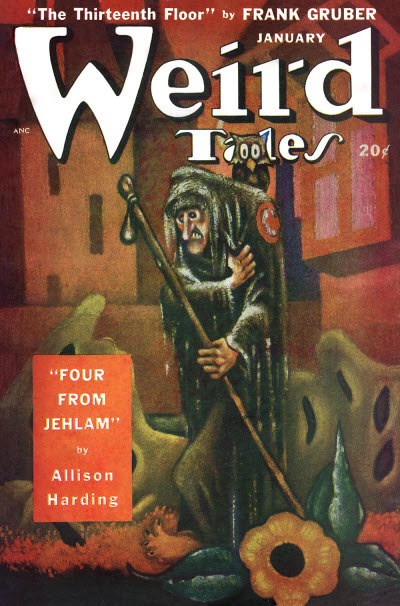 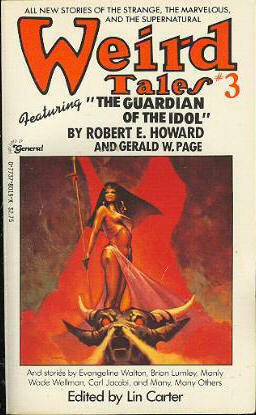 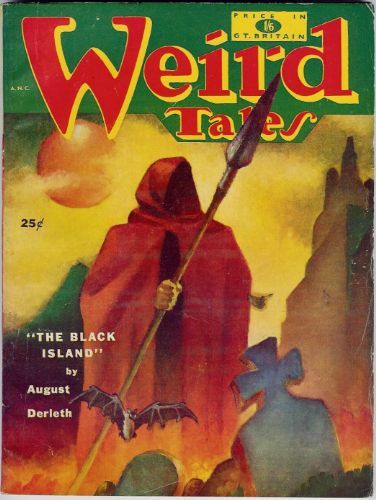 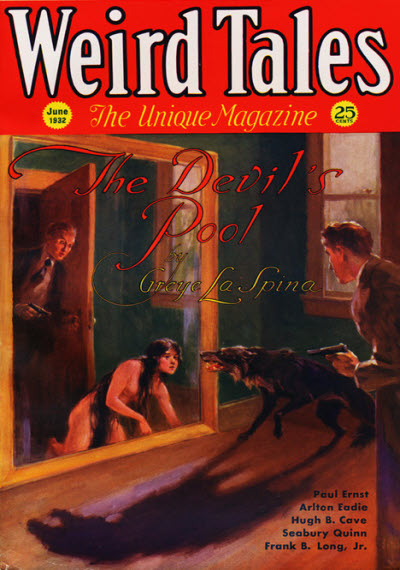 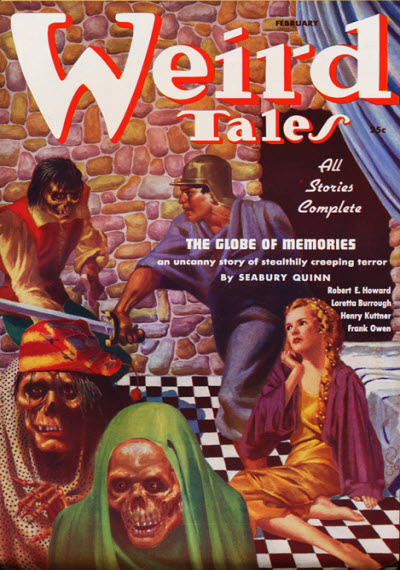 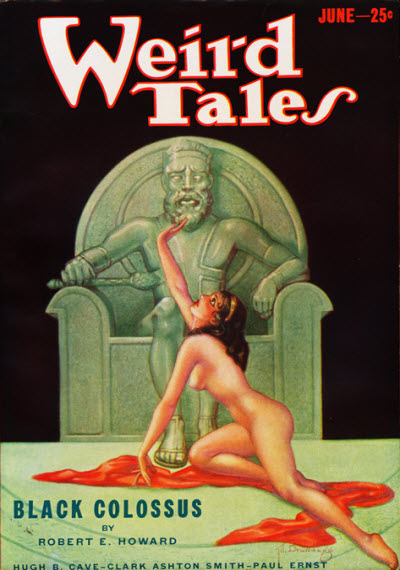 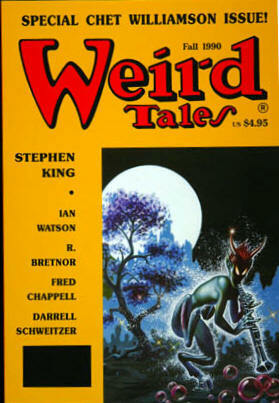 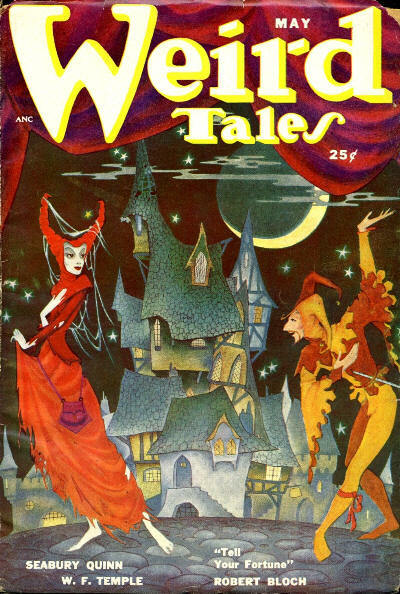 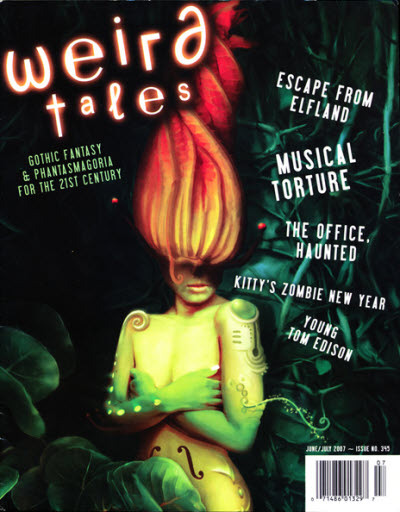 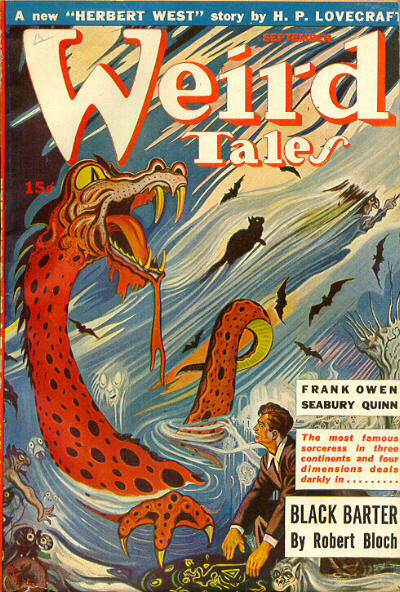 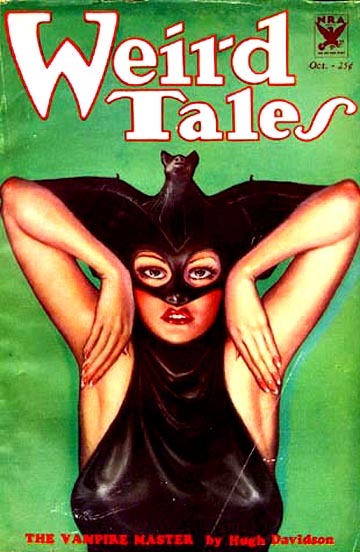 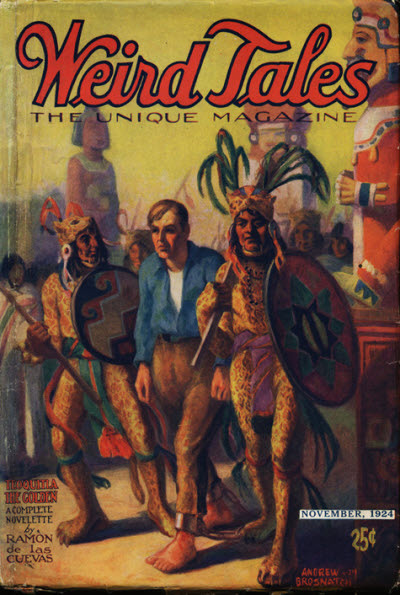 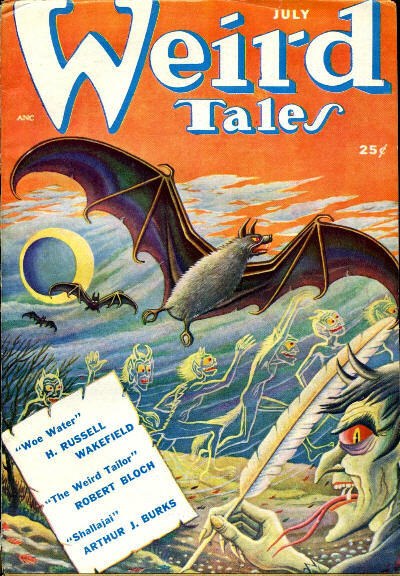 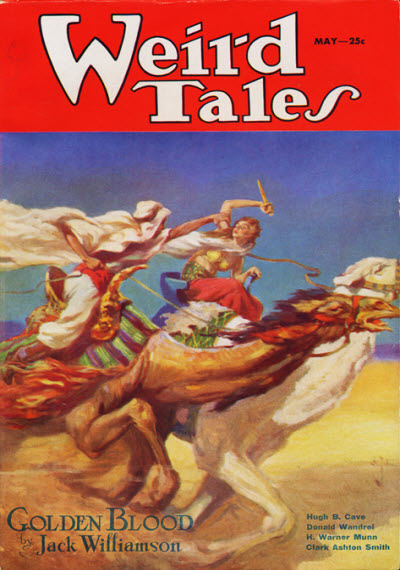 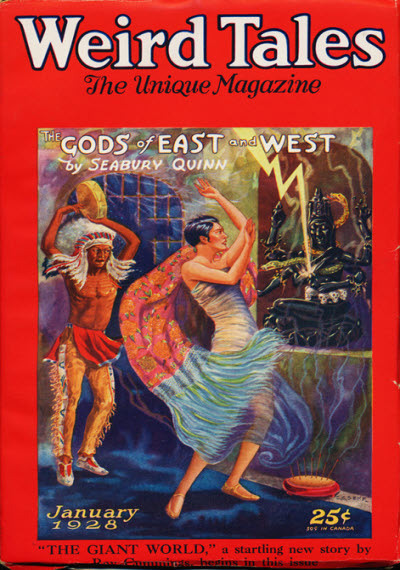 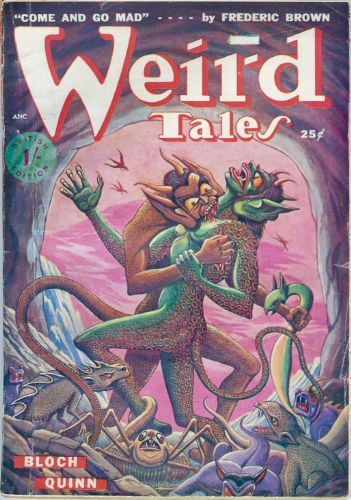 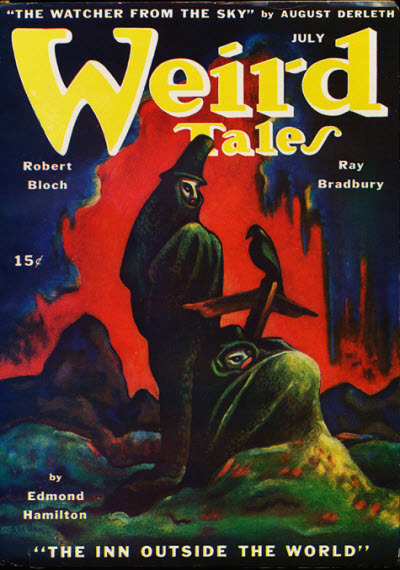 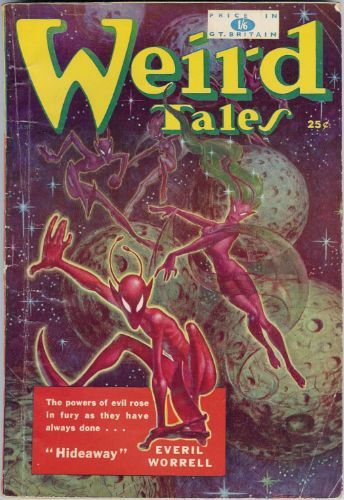 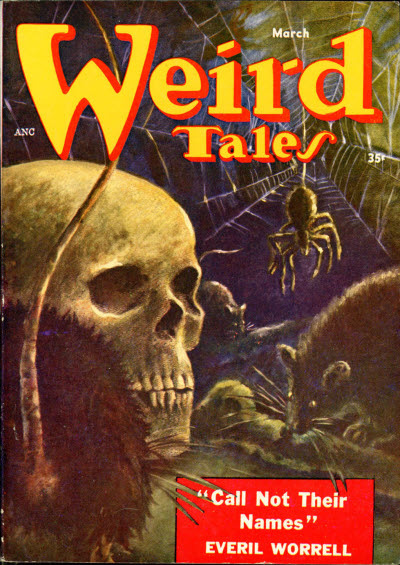 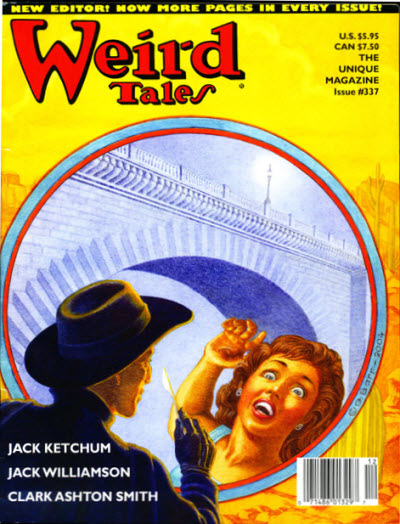 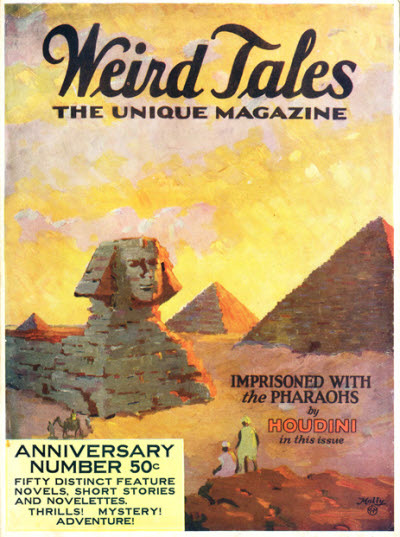 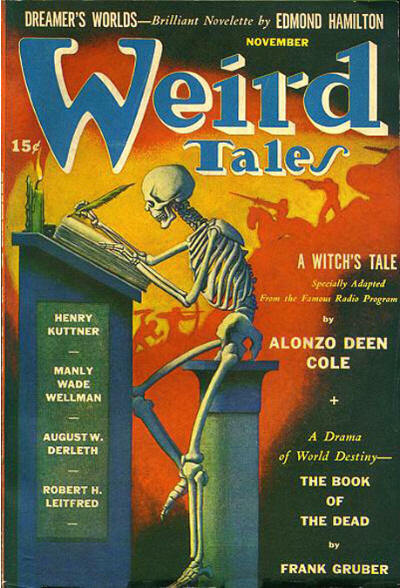 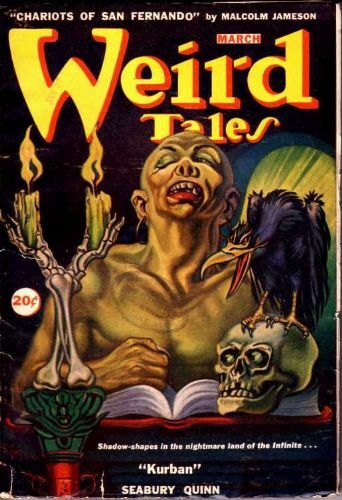 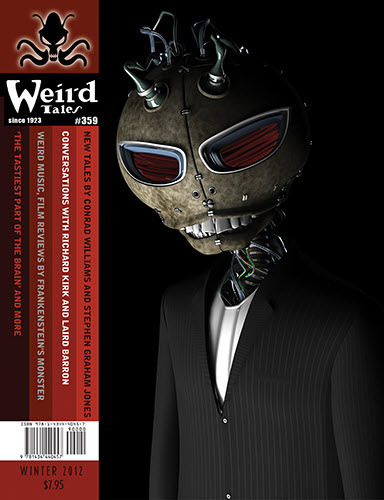 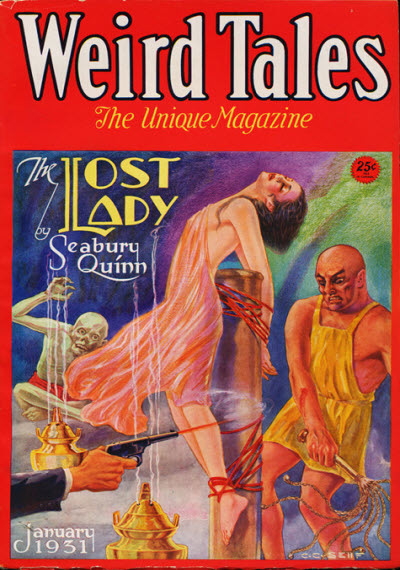 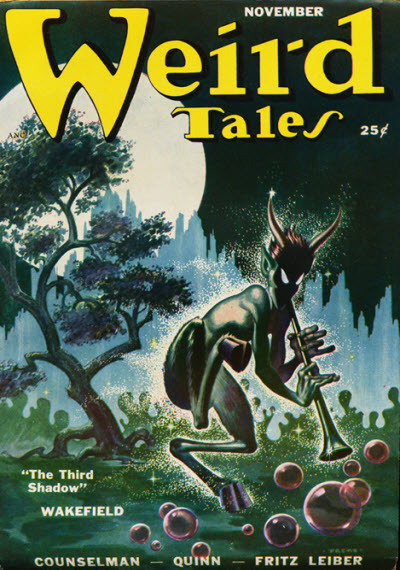 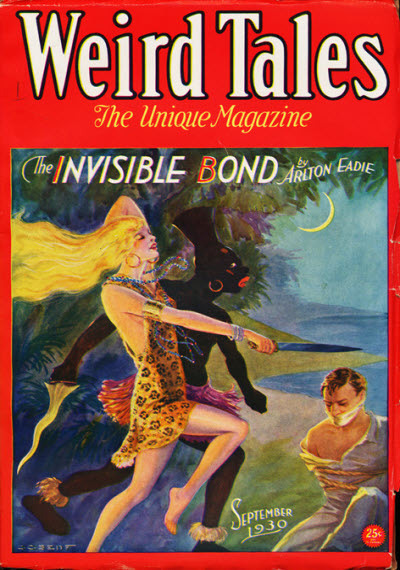 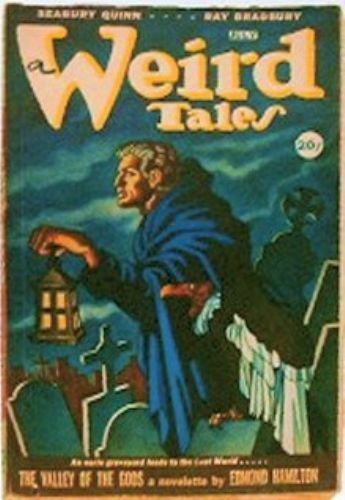 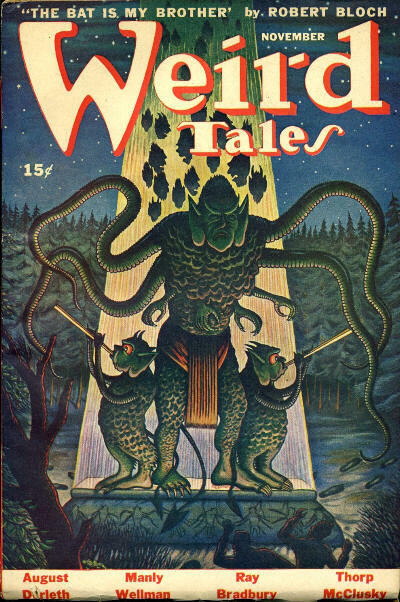 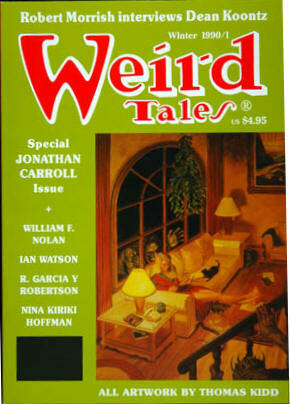 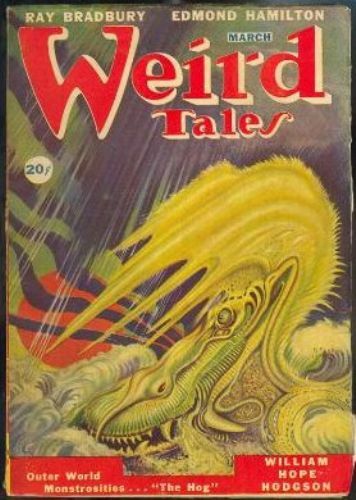 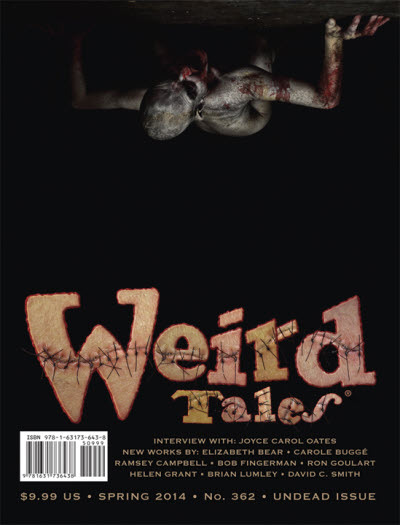 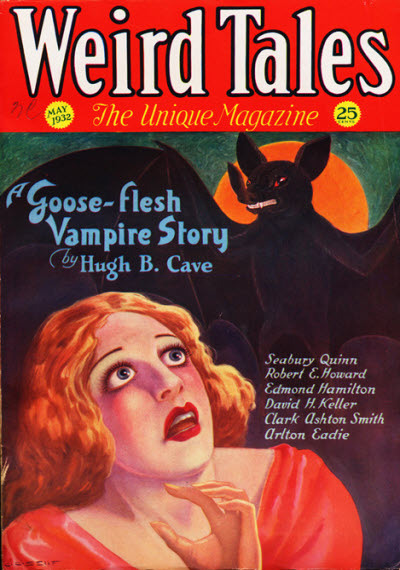 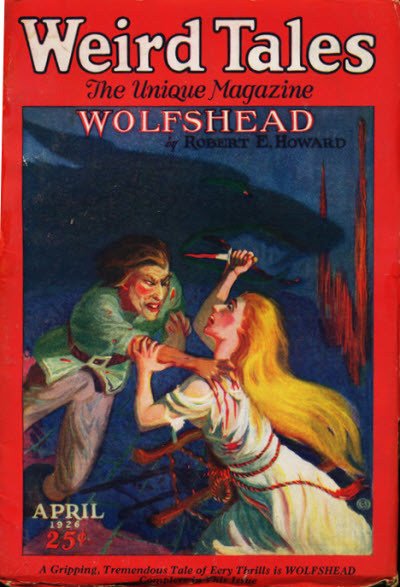 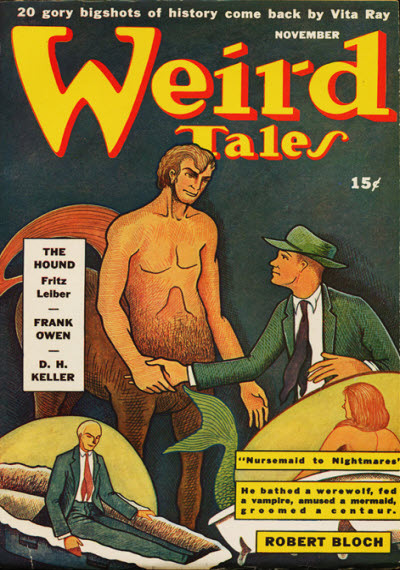 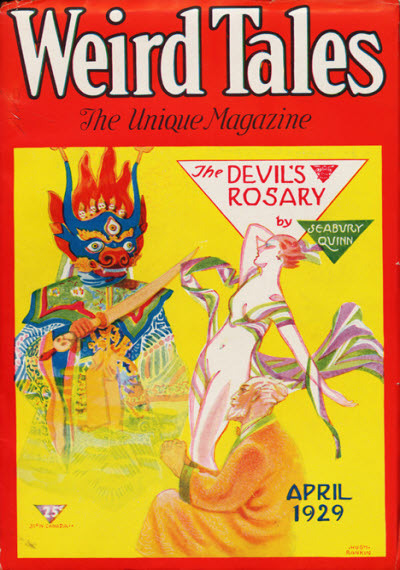 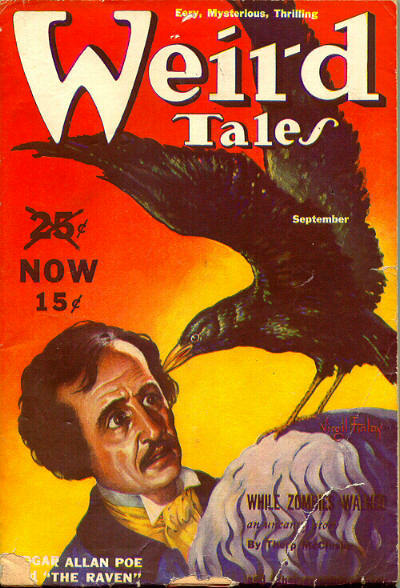 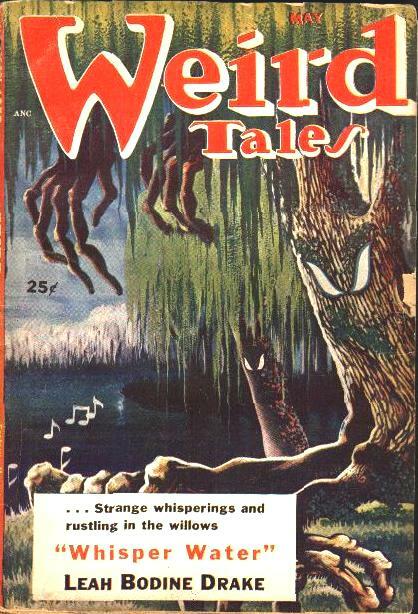 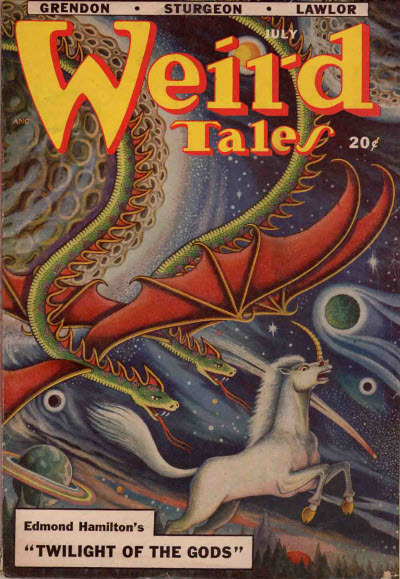 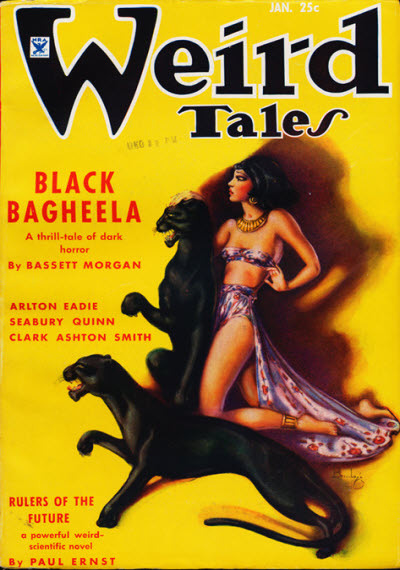 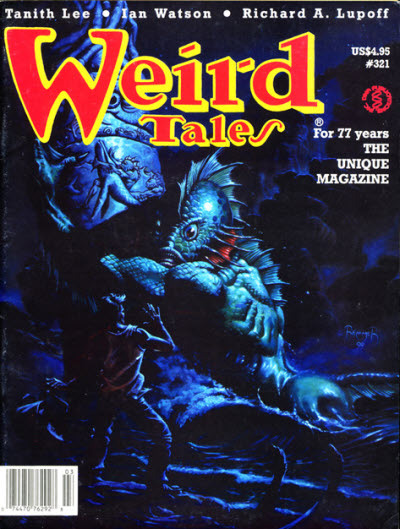 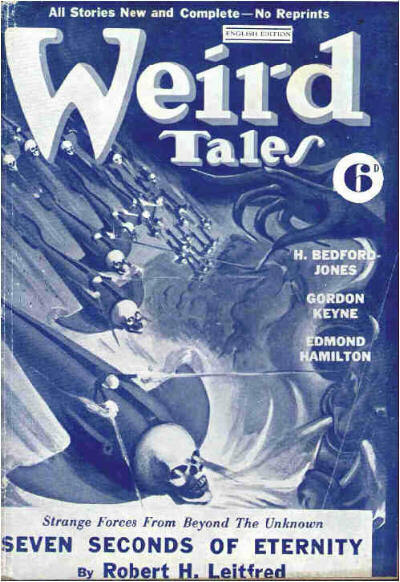 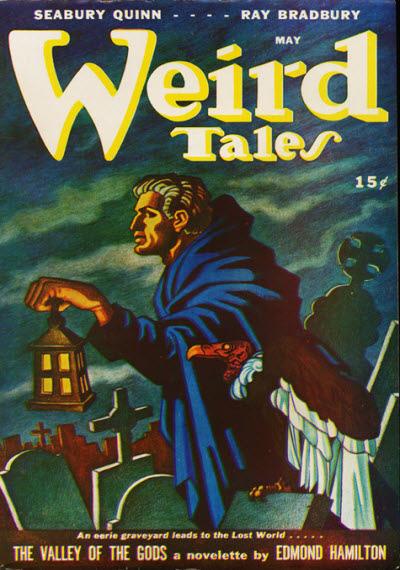 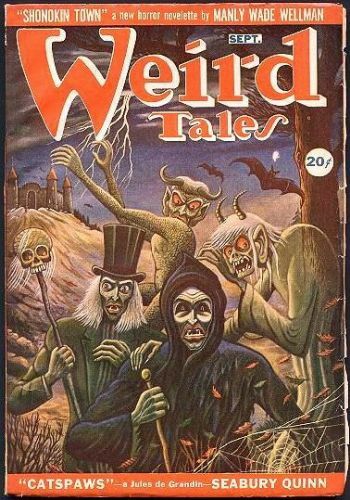 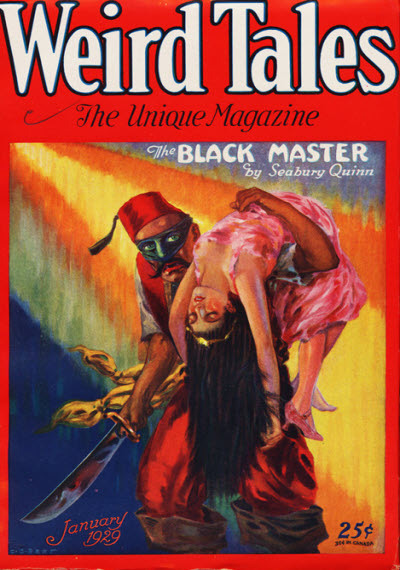 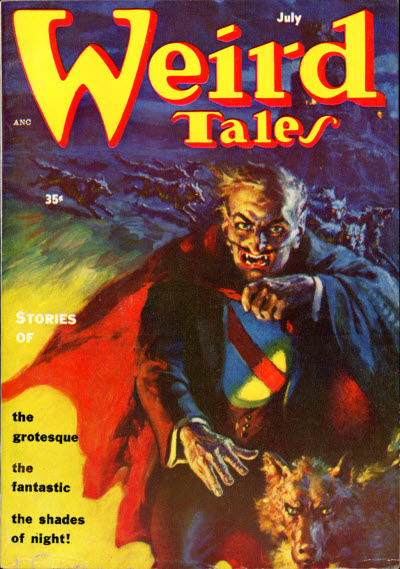 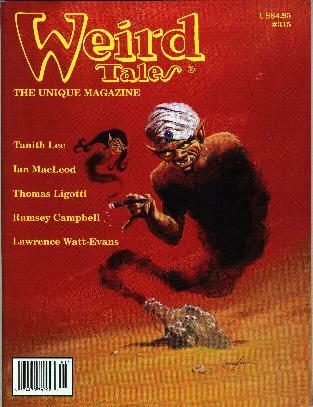 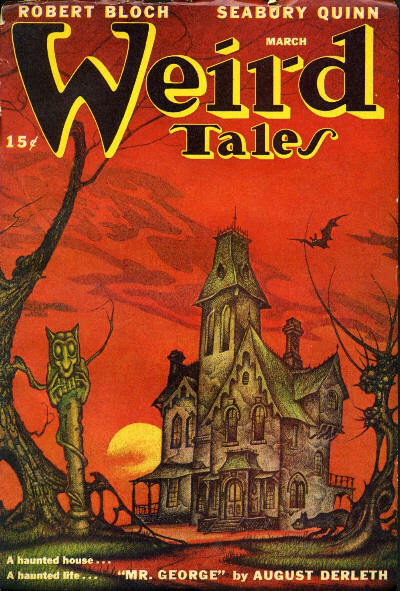 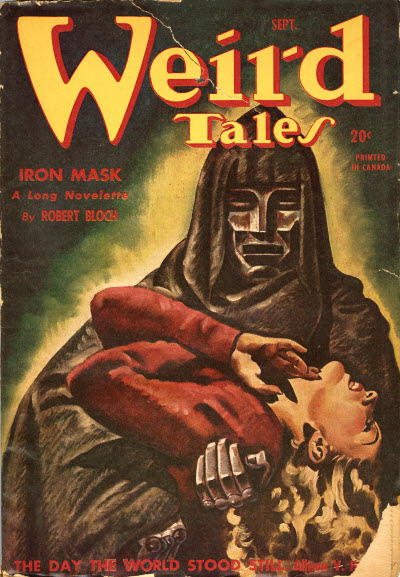 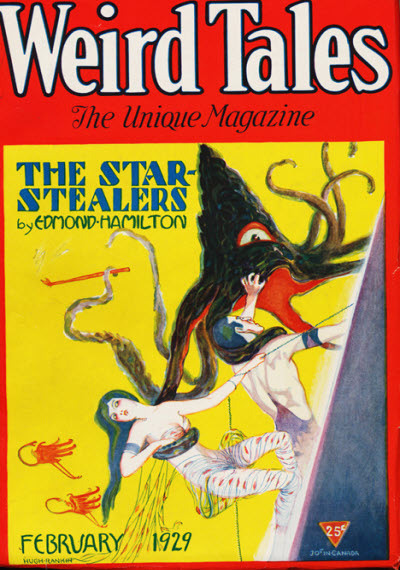 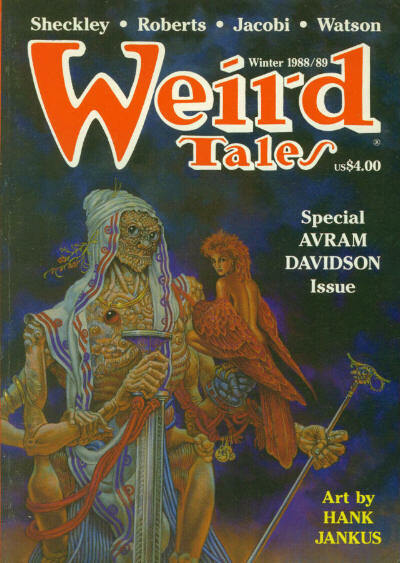 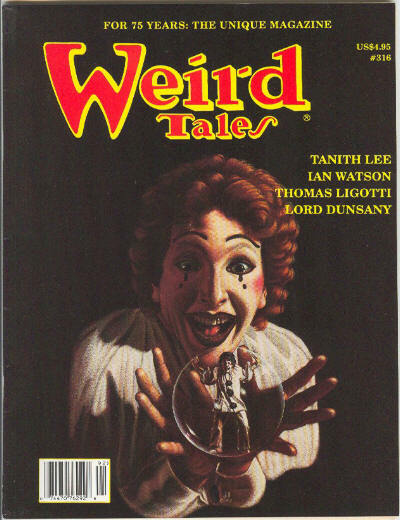 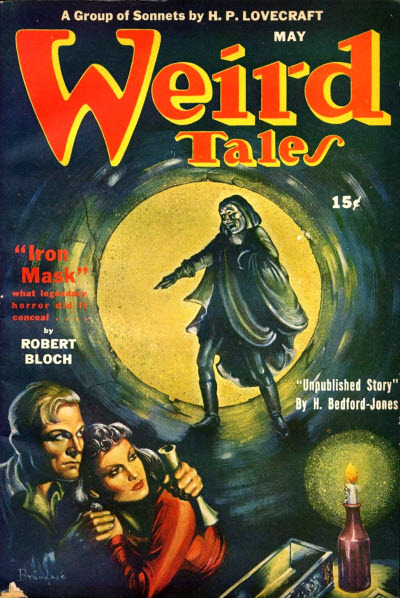 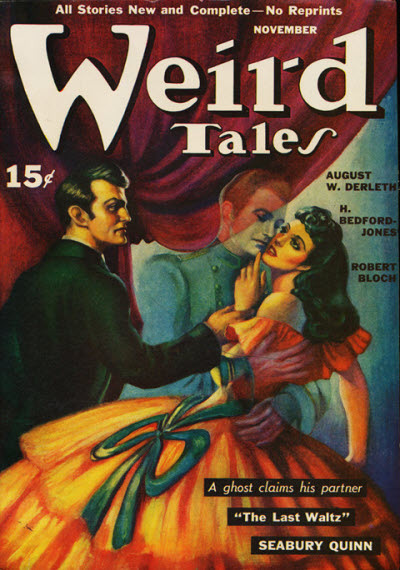 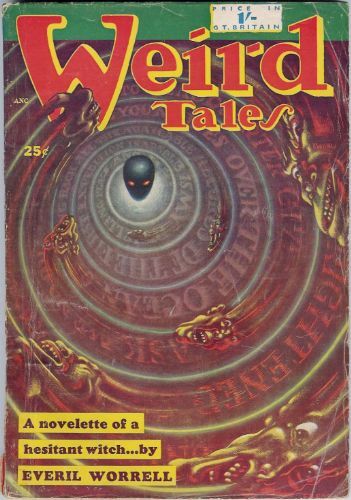 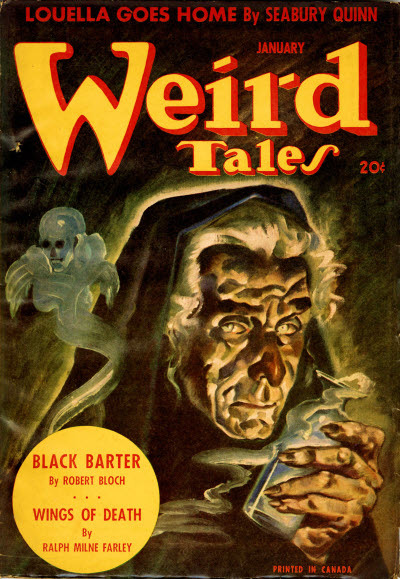 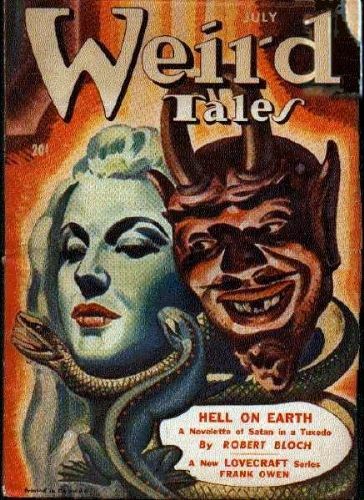 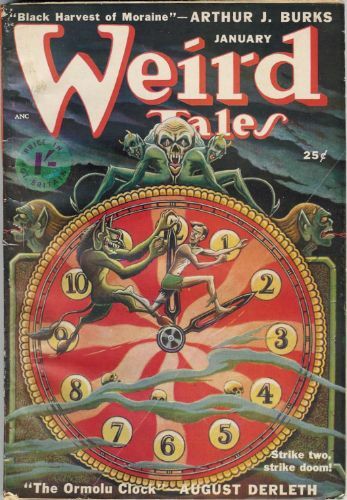 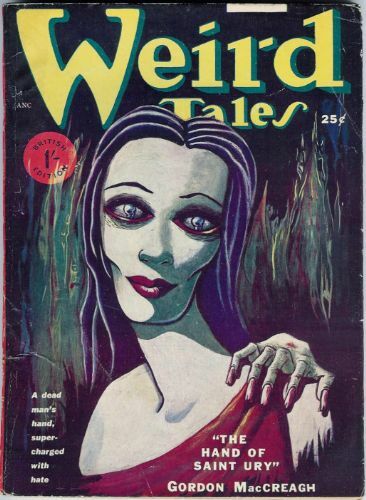 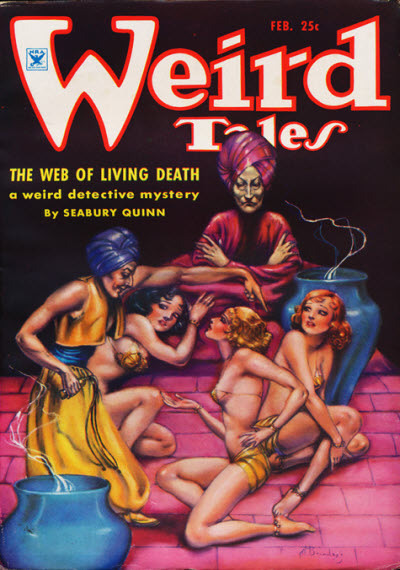 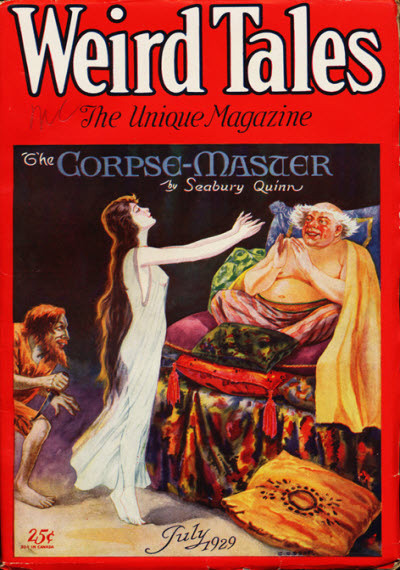 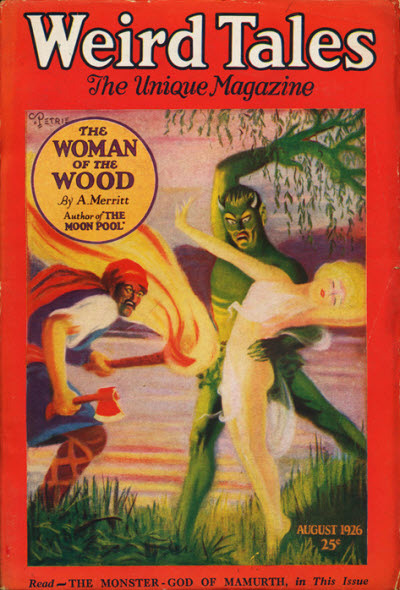 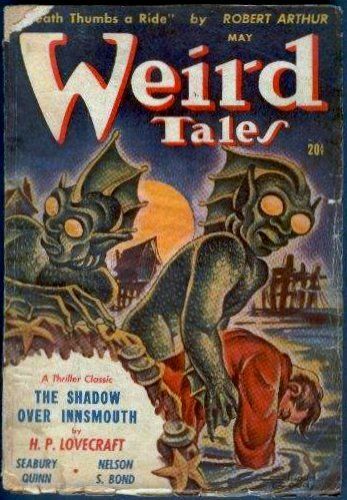 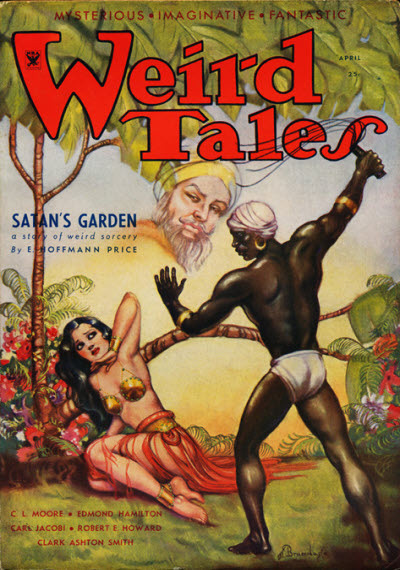 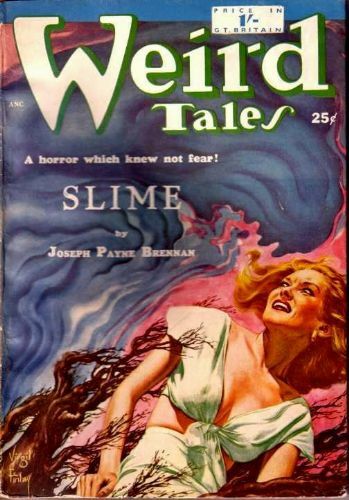 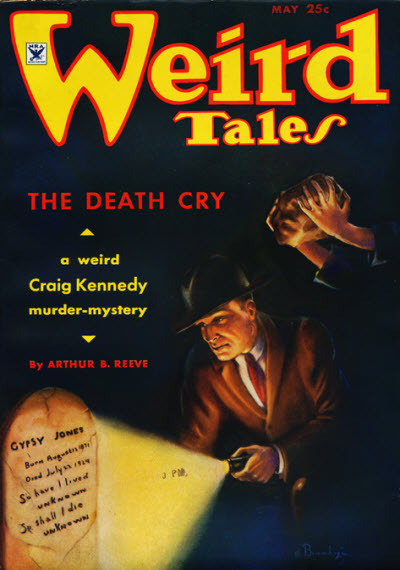 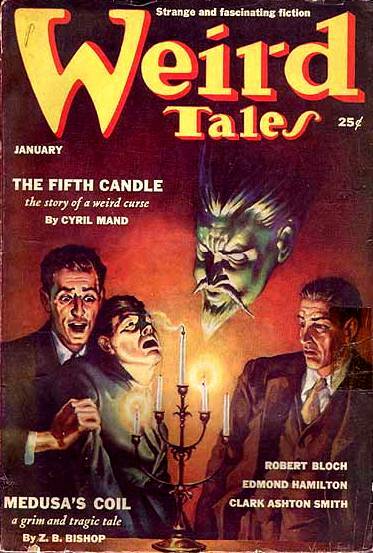 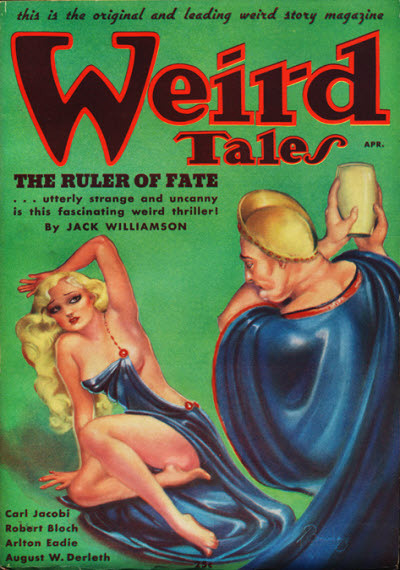 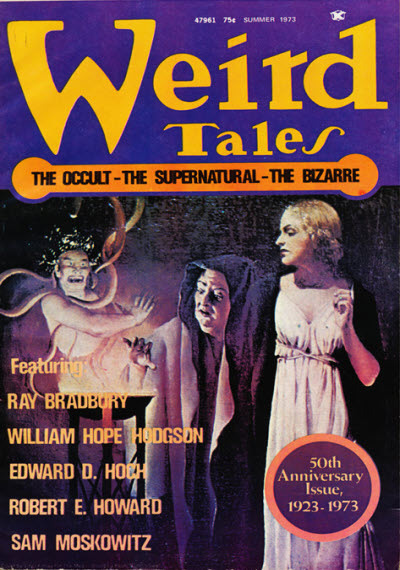 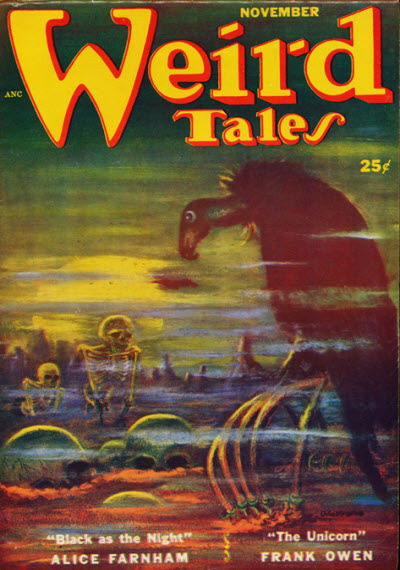 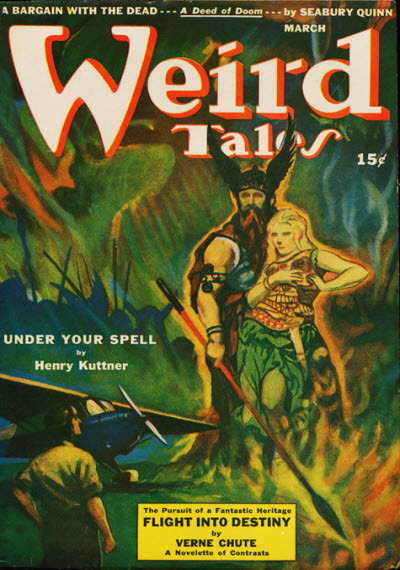 Although Weird Tales is known as "the magazine that never dies", it is not for lack of trying! 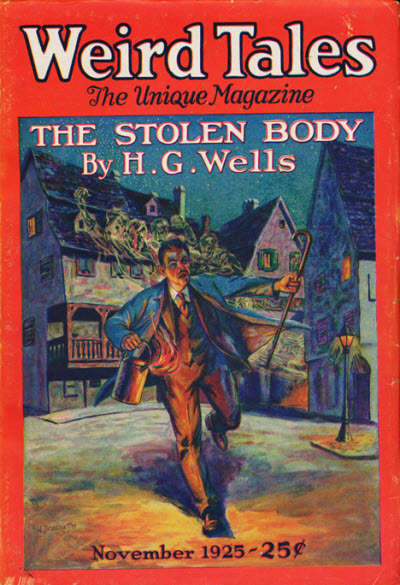 The first incarnation, from Rural Publishing, never hit its stride and ran into financial problems after only thirteen issues. 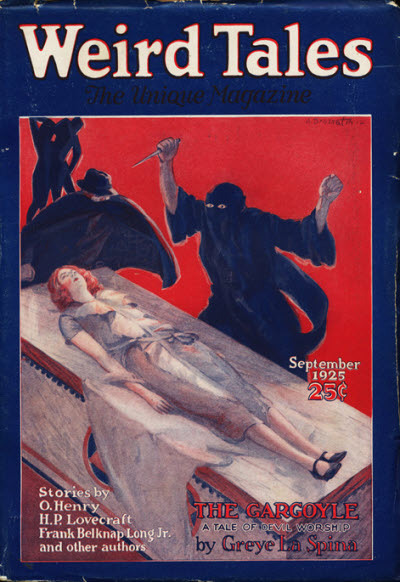 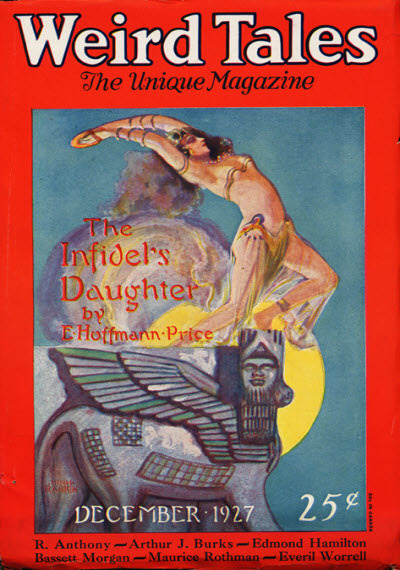 Matters improved in 1924 with the appointment of Farnsworth Wright as editor and, despite a financial crisis in 1931, the magazine flourished until 1938, when it was sold to William J. Delaney. 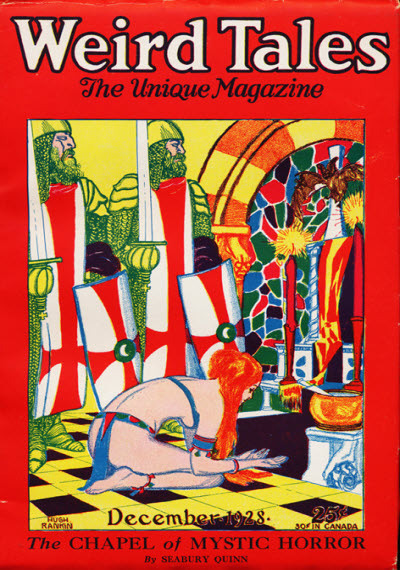 Although it continued for another 16 years, it was only with marginal success (and of limited interest) until it folded in 1954. 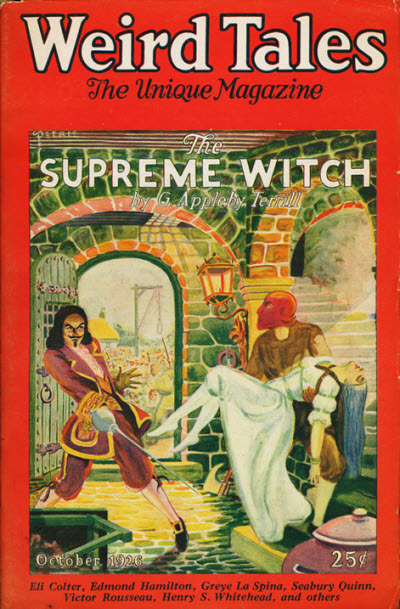 During this period, there were also a variety of reprints overseas. 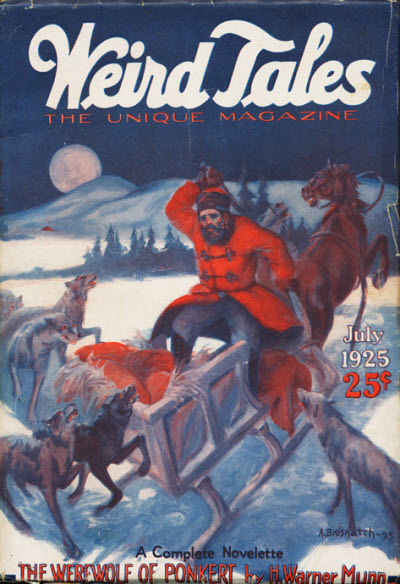 The most interesting were in Canada. 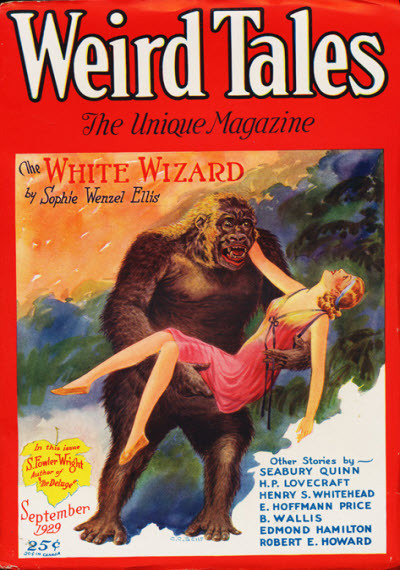 The first series (from June 1935 to July 1936) were simply abridged versions of the equivalent US editions. 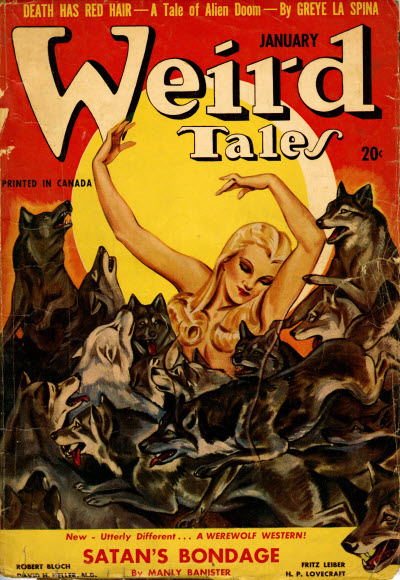 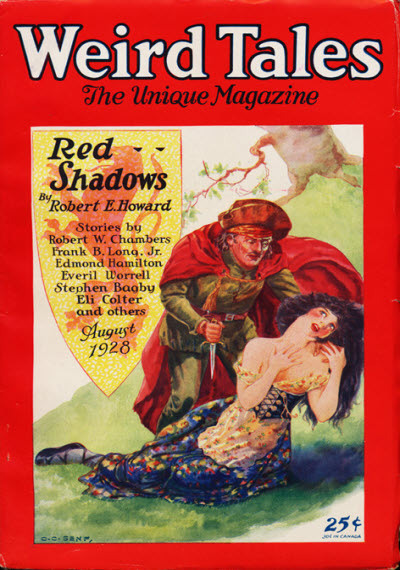 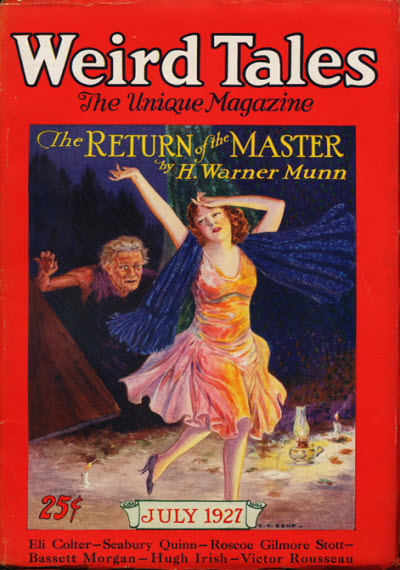 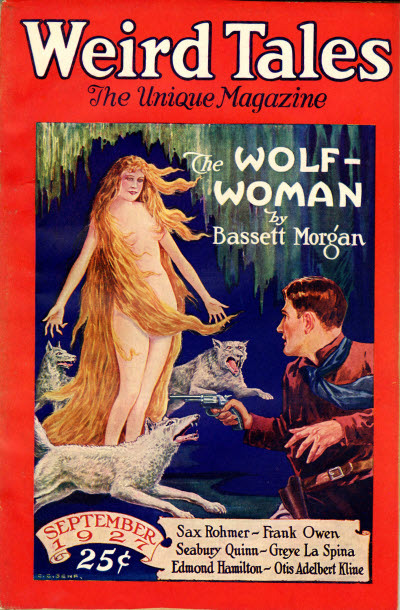 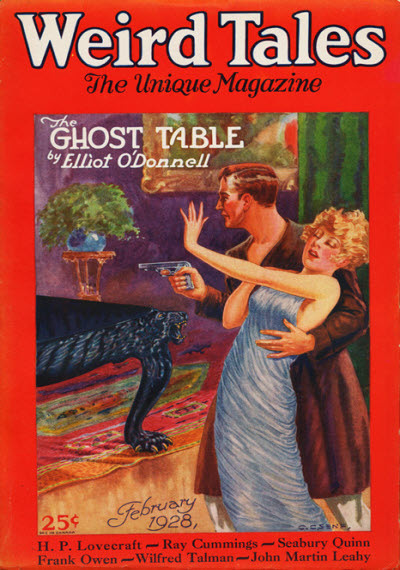 The second series (May 1942 to November 1951), however, both had all new artwork and had frequent reorganizations of stories, included some that appeared in Canadian issues earlier than the equivalent US printings, and others that were reprinted from Short Stories and did not appear in the US edition at all. 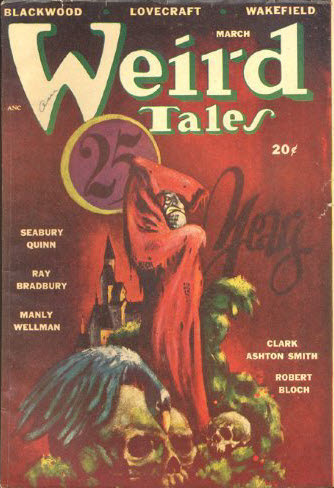 This variation lasted until the January 1948 issue and thereafter the issues were identical to the US equivalents. 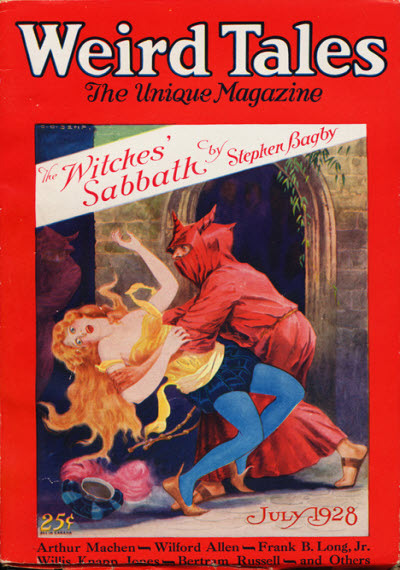 The other reprints were in the UK, where there were four different series. 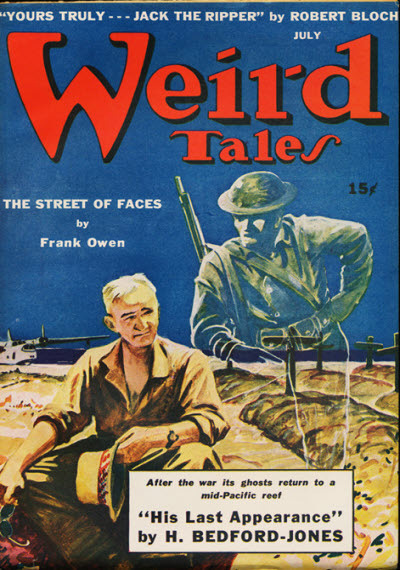 The first consisted of only three unnumbered and undated issues published in early 1942 by the infamous Gerald G. Swan, corresponding to abridged versions of the US issues September and November 1940, and January 1941. 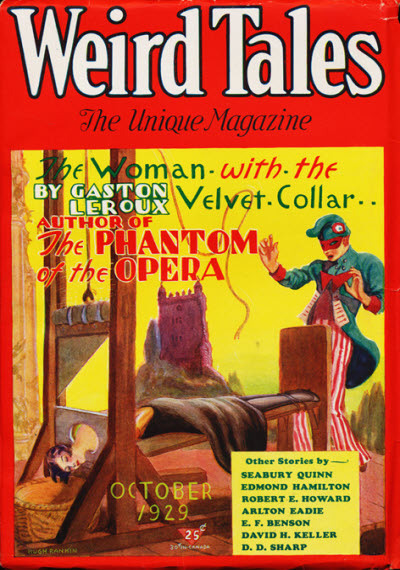 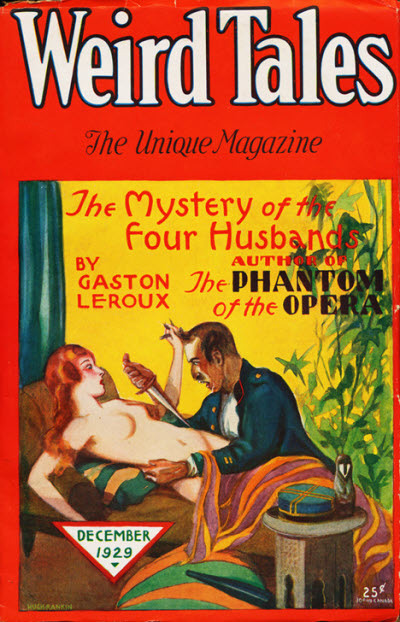 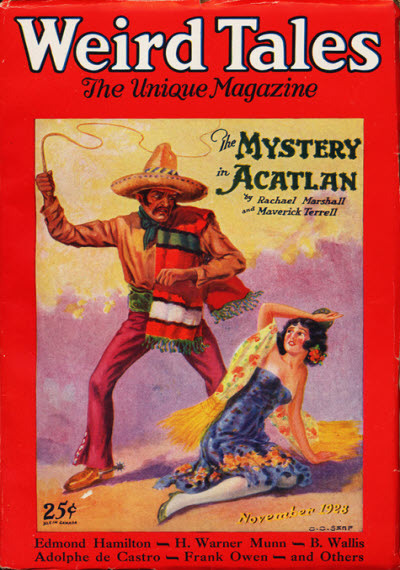 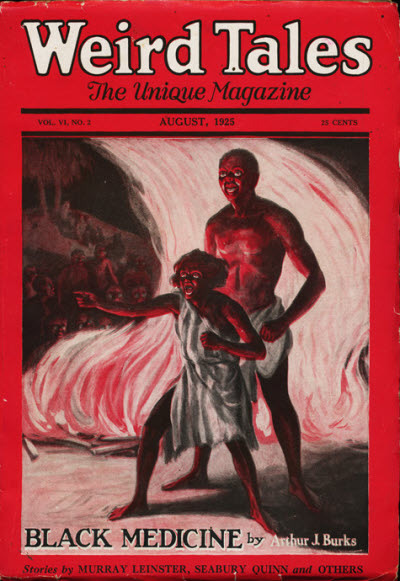 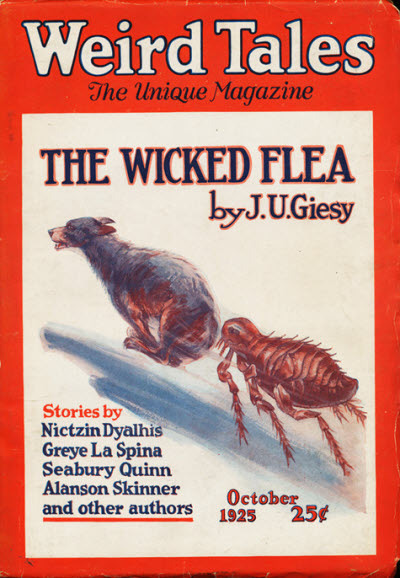 The second series was even briefer, with only a single issue (still unnumbered and undated) in late 1946 containing a mere three stories from the US October 1937 issue. 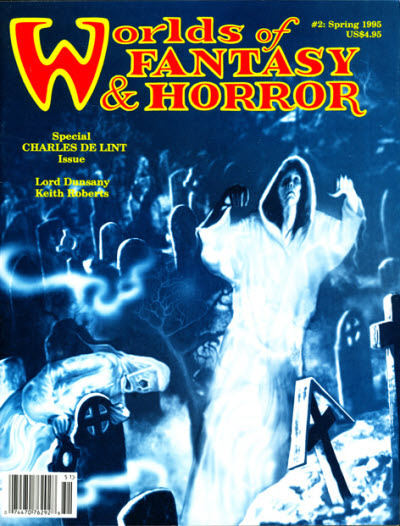 The third series was more successful, lasting for 23 issues and overlapped with the fourth series, which lasted for a mere five. 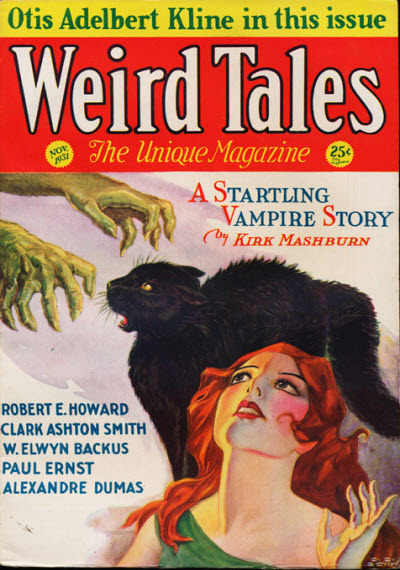 In each case the magazines were simply reprints of assorted US issues. 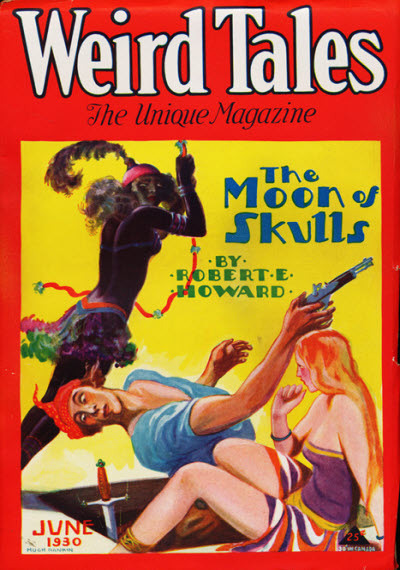 The title had established a major reputation among fans, however, and was revived in 1973 under the editorial guidance of Sam Moskowitz, but was unable to make a profit and died after only 4 issues. 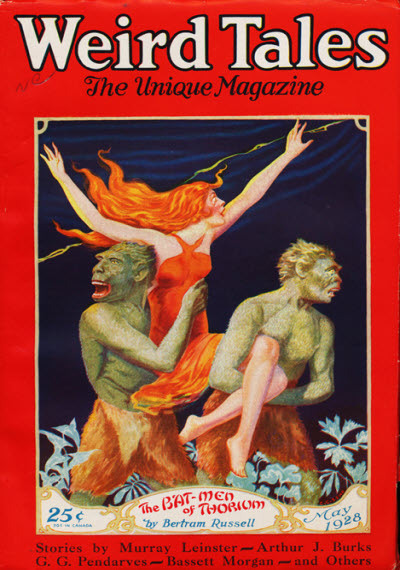 A further attempt was made to revive the magazine in 1981, this time as a paperback edited by Lin Carter, but after only four issues this fell foul of the contractual problems that were to dog the magazine for many years. 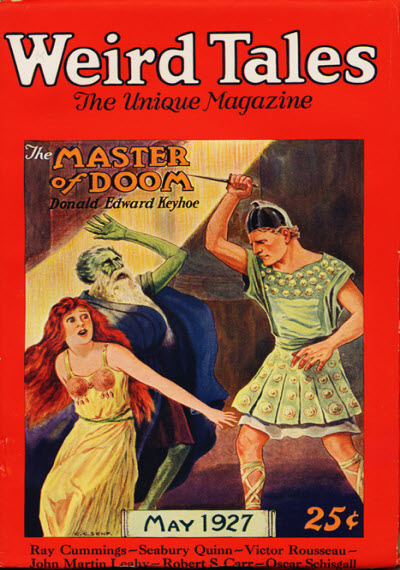 The next phase was even more chaotic as two different editors (Forrest Ackerman and Gil Lamont) laid claim to the magazine, with each preparing mock-ups of the next issue. 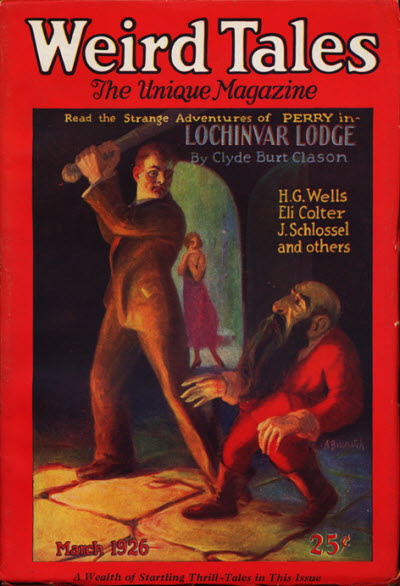 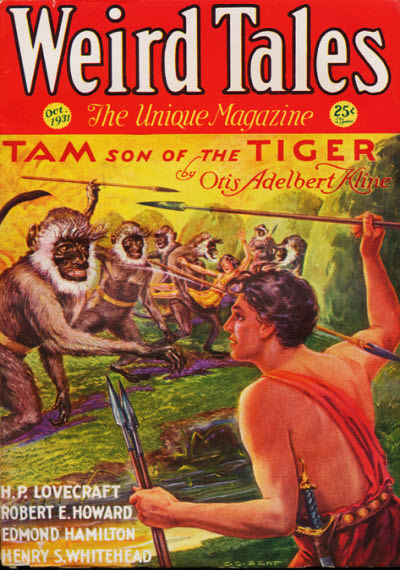 Gil Lamont finally won the dispute, but had little reason to celebrate as the magazine again died, this time after only two issues. 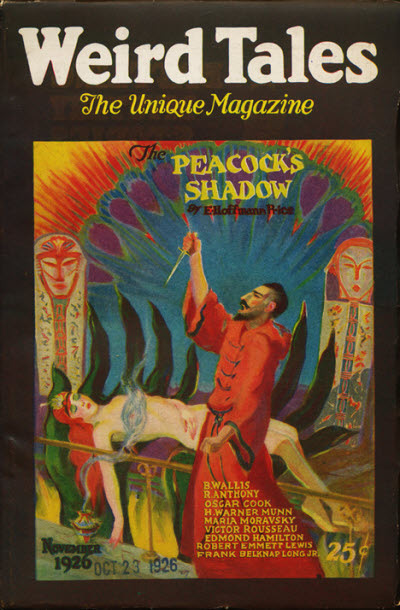 After a hiatus of two years, a period of relative stability was ushered in under the stewardship of George Scithers & Darrell Schweitzer who edited the magazine for six years on an irregular schedule that attempted to be quarterly. 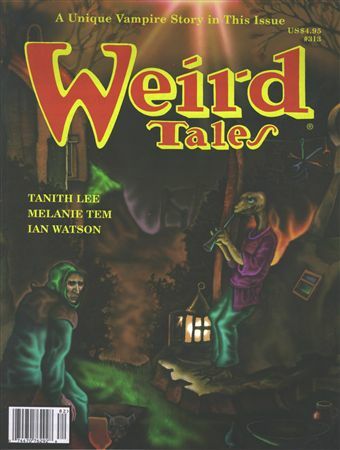 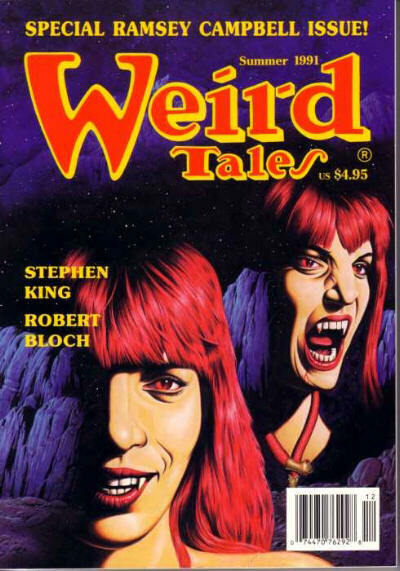 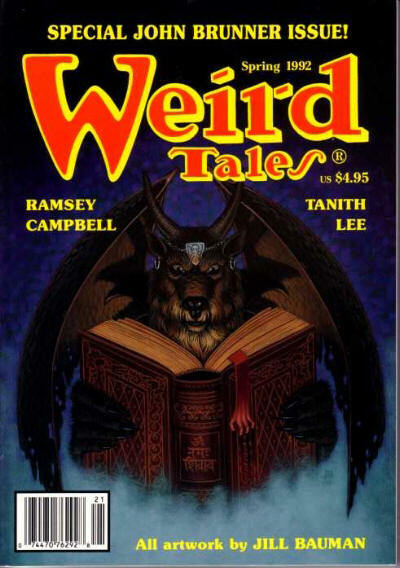 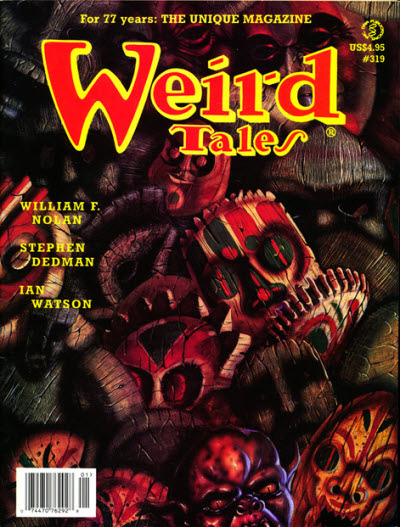 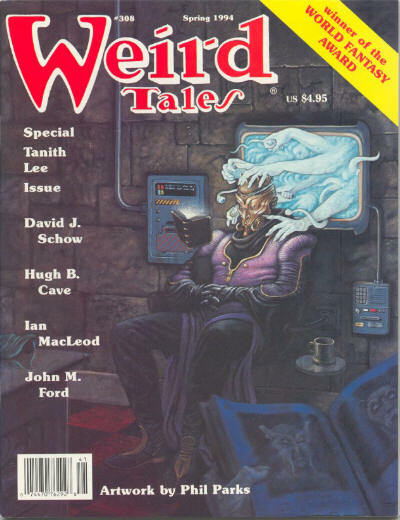 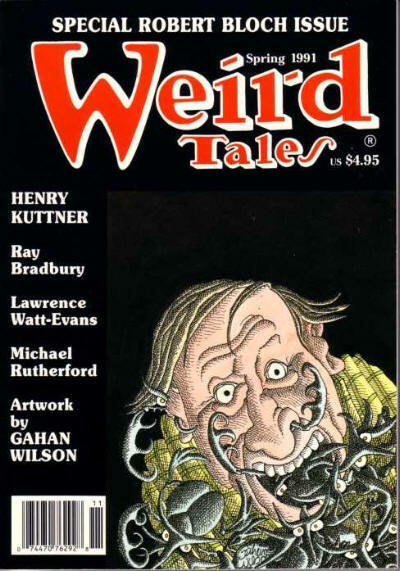 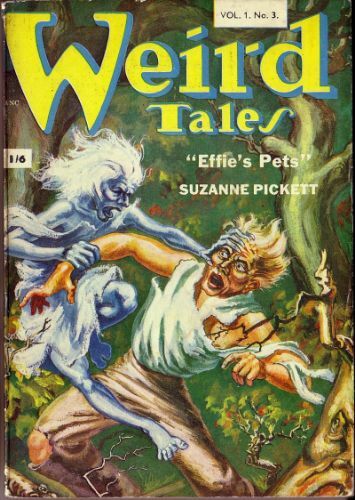 In 1994, however, the curse of Weird Tales struck again - Scithers & Schweitzer were only licensing the name from the copyright owner, and this licensing ran into "various legal, as well as financial, problems" as a result of which the title reverted to the owner. 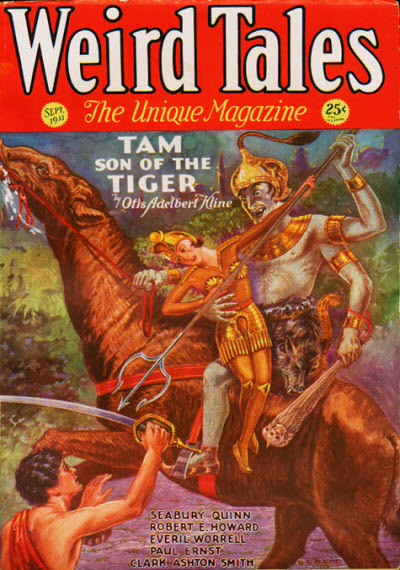 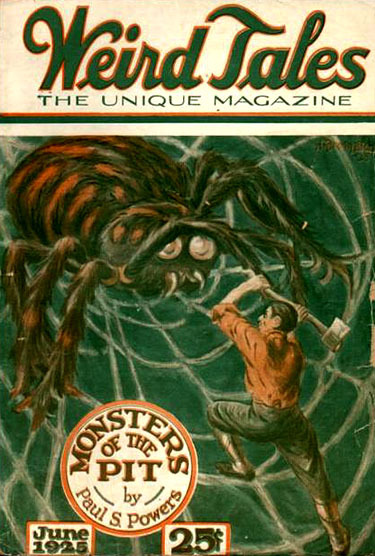 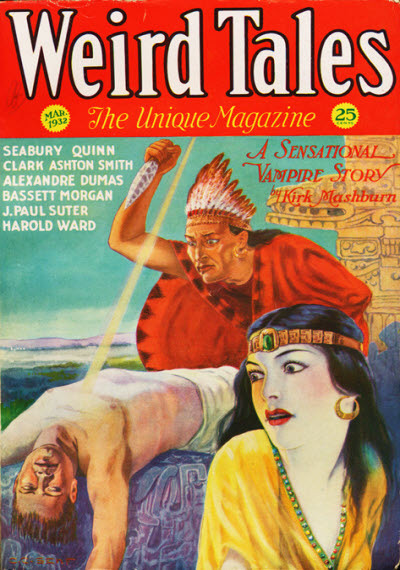 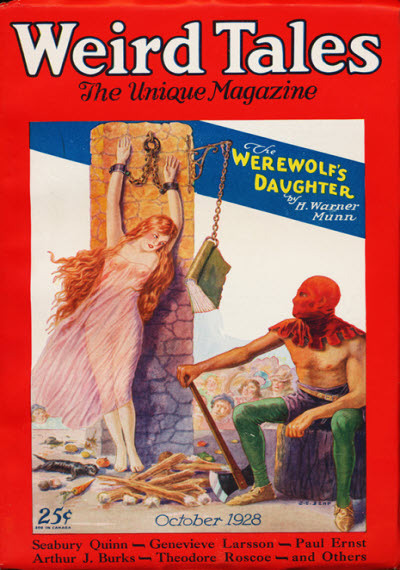 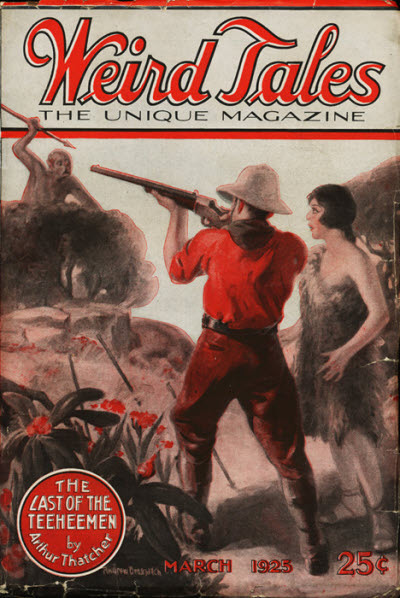 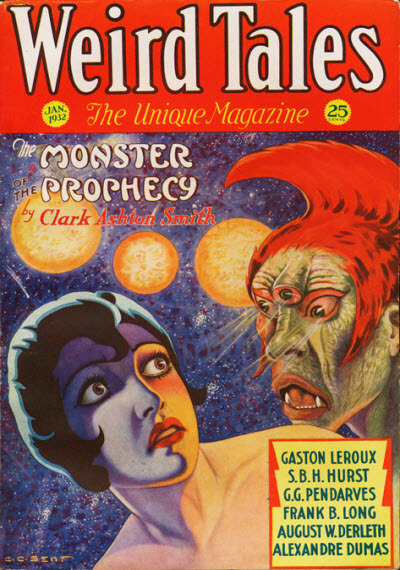 Undaunted, Scithers & Schweitzer continued the magazine under the name of Worlds of Fantasy & Horror, with the numbering restarted at #1, but this lasted for only four issues, spread over three years. 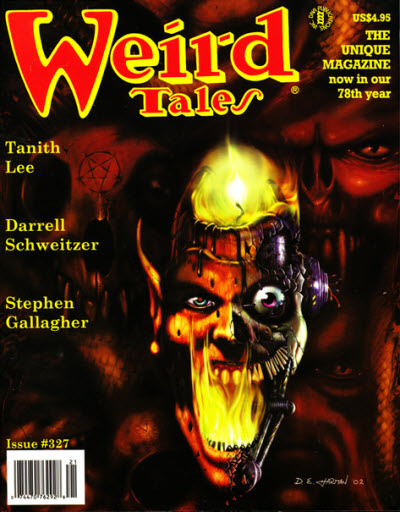 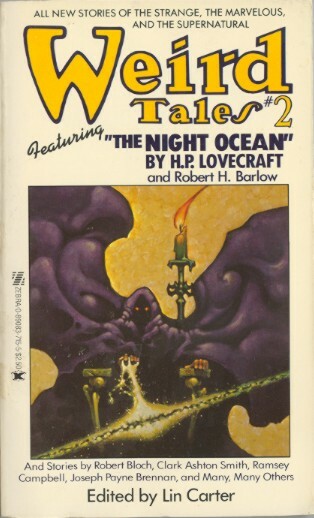 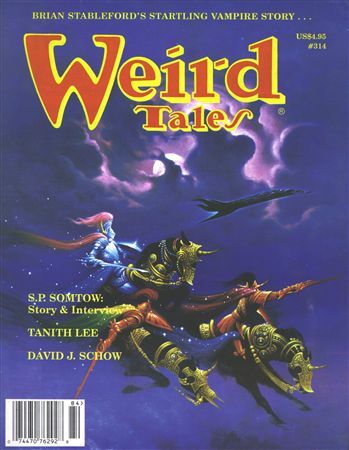 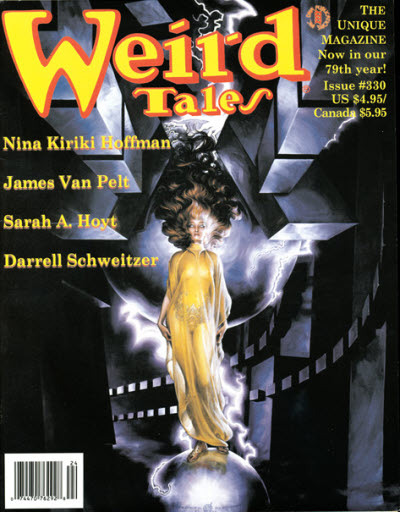 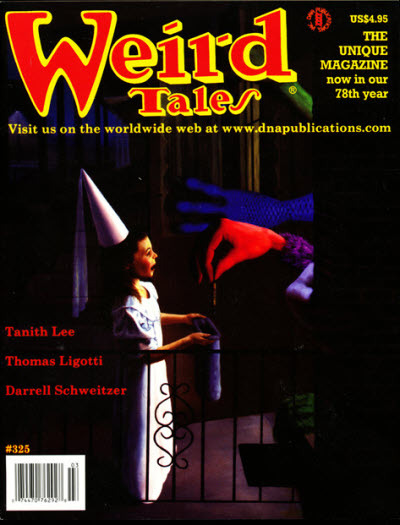 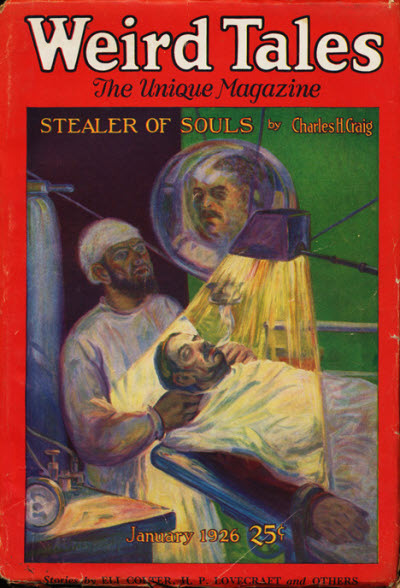 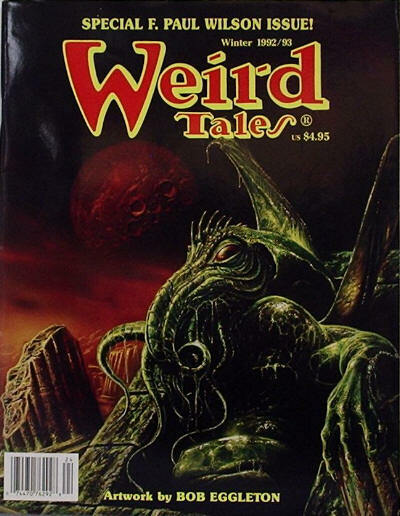 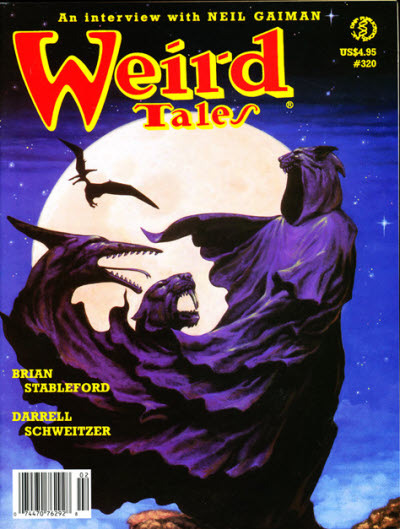 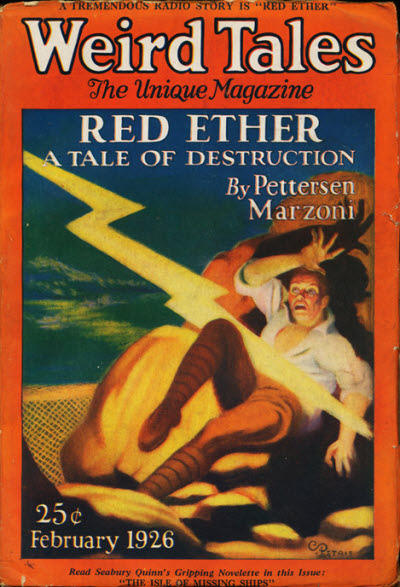 Just over a year later, in 1998, a new publisher managed to arrange a new deal with the copyright owner and Weird Tales re-appeared, still with Scithers & Schweitzer at the helm. 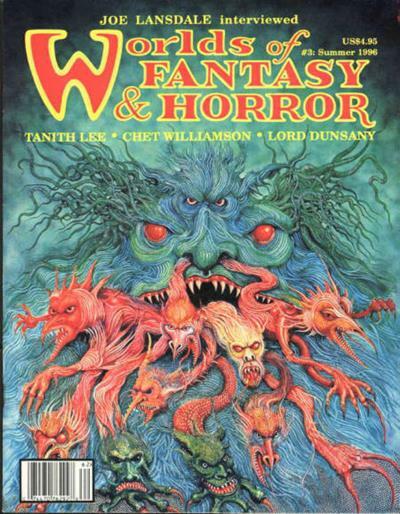 Just to confuse matters the new issues were numbered as if the 4 issues of Worlds of Fantasy & Horror had been part of the main sequence. 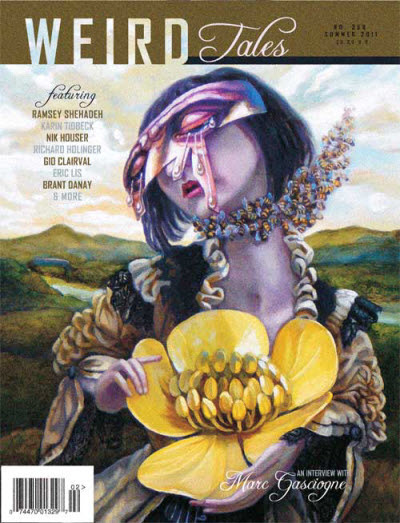 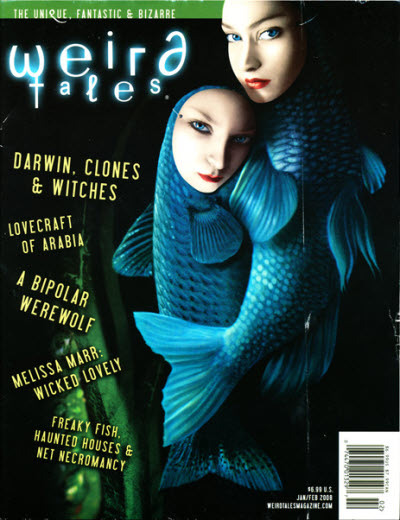 After five years, of a regular quarterly schedule, the magazine faltered again and another publisher came on board in early 2003. 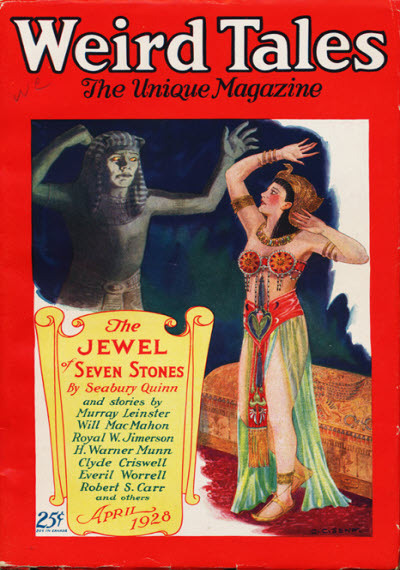 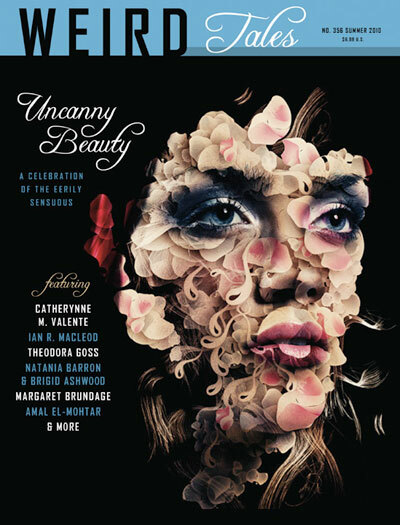 For the next nine years, a varied combination of publishers and editors attempted to keep the magazine afloat, even managing an (almost) bi-monthly schedule for three years, but by early 2009 it was clearly in trouble with issues becoming more and more irregular until finally, in 2012, the magazine was sold to Marvin Kaye, who took over as both publisher and editor with effect from the Fall 2012 issue. 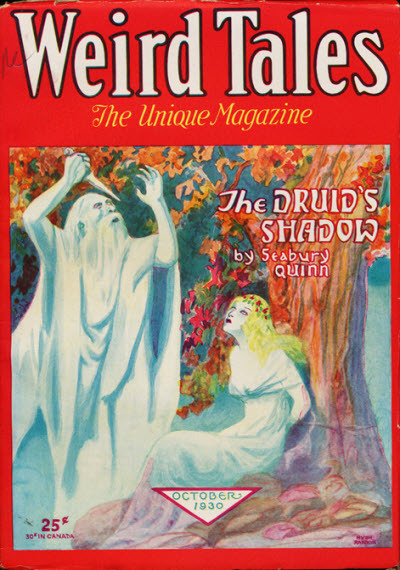 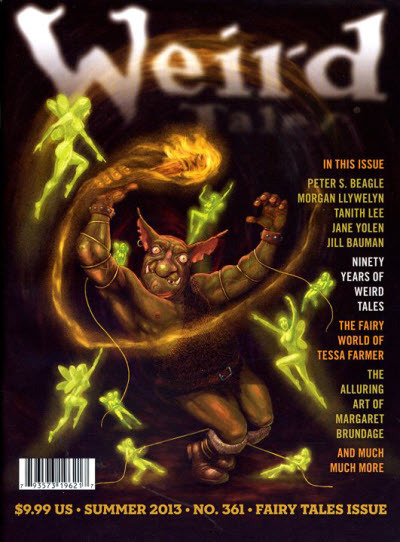 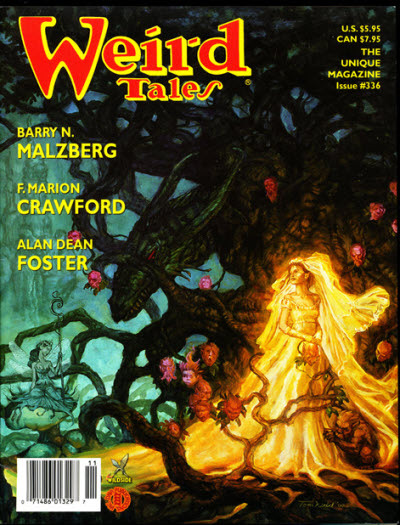 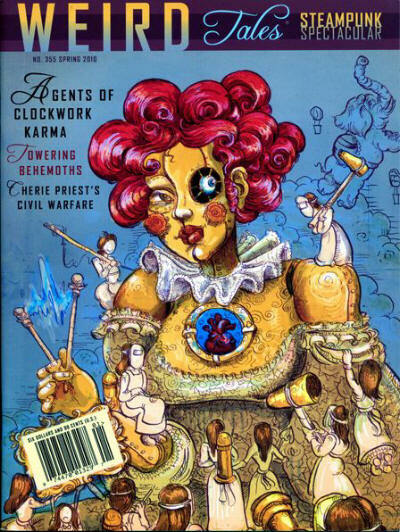 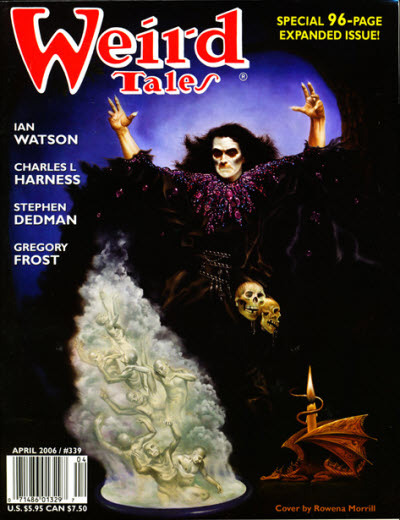 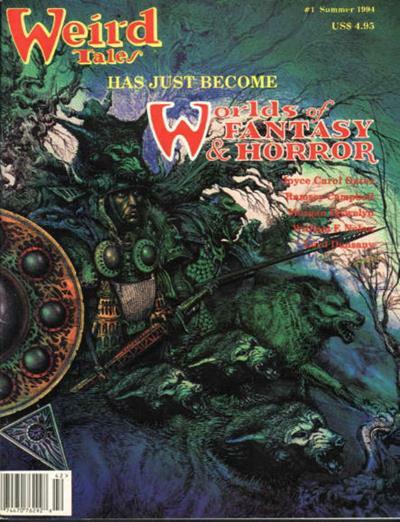 Issues from Summer 1994 to Winter 1996 were titled Worlds of Fantasy & Horror.